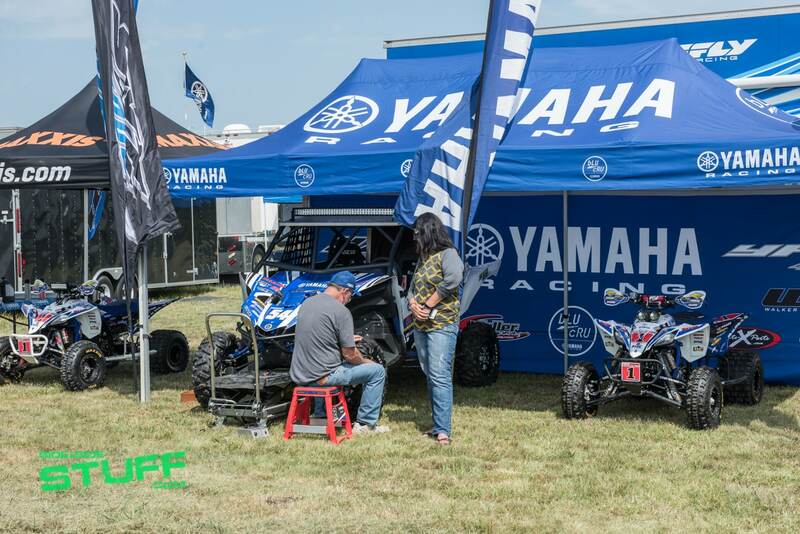 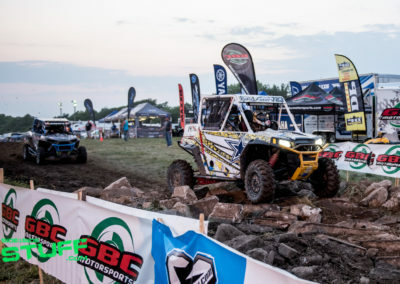 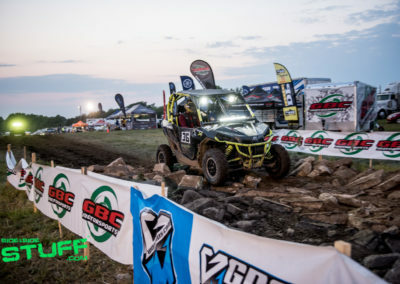 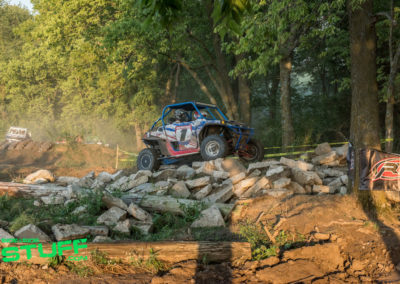 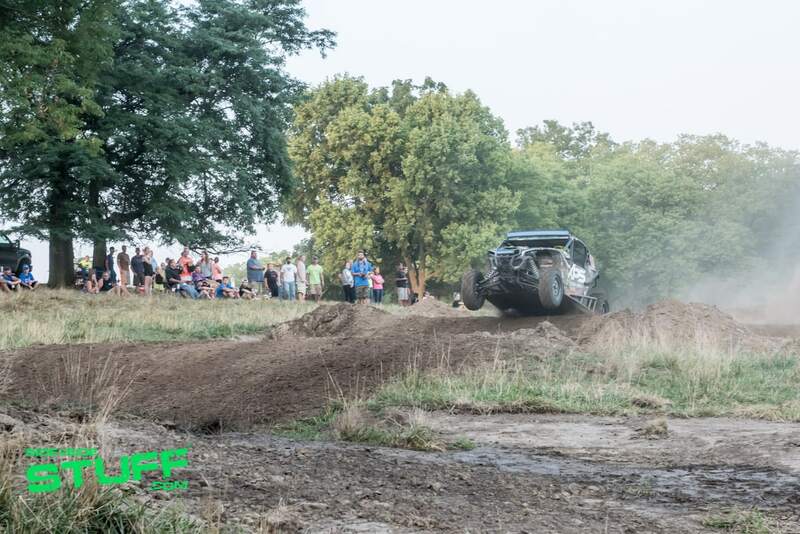 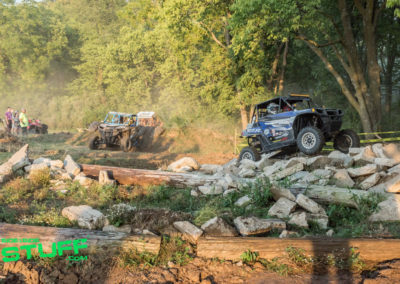 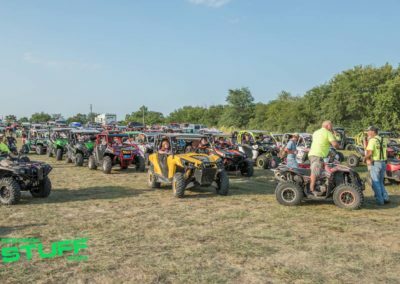 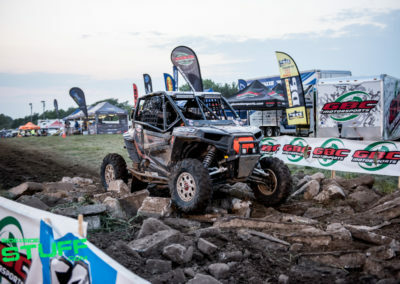 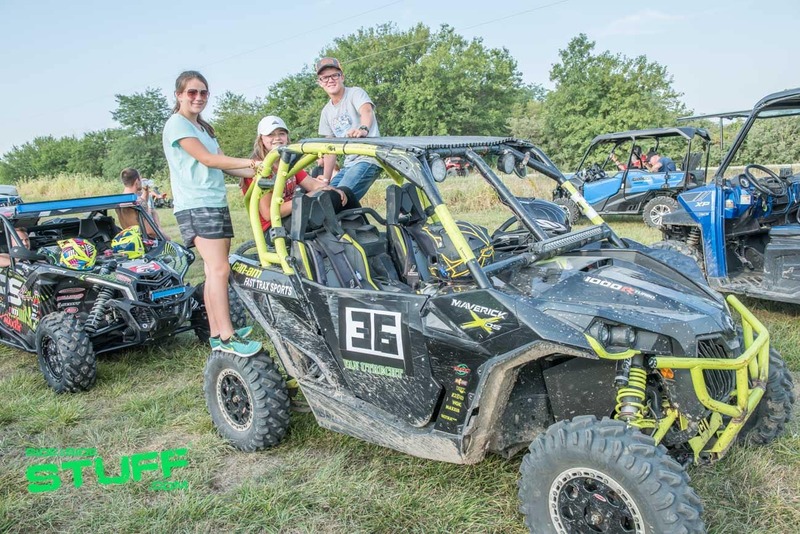 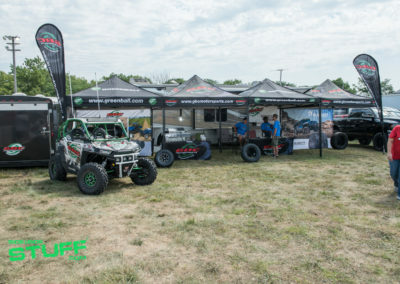 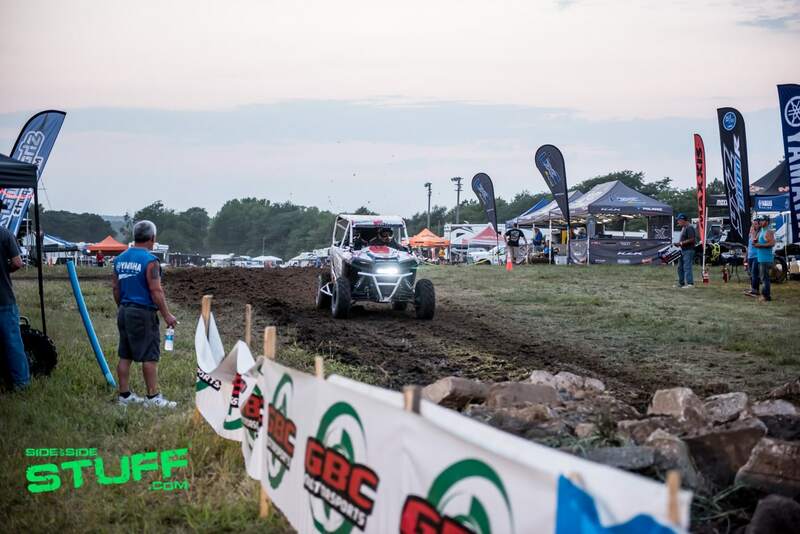 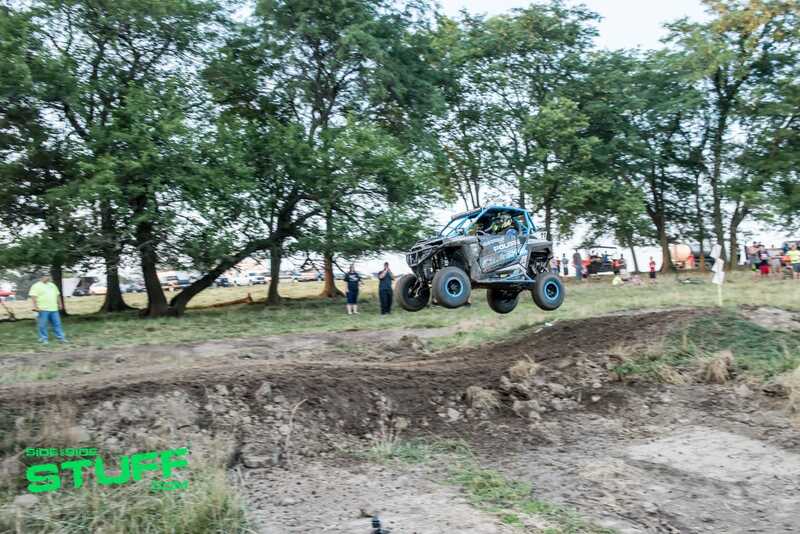 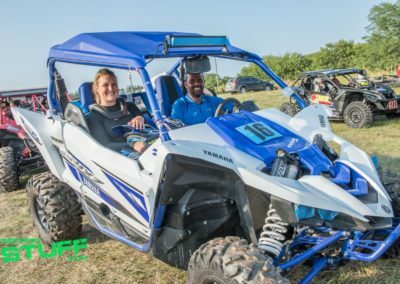 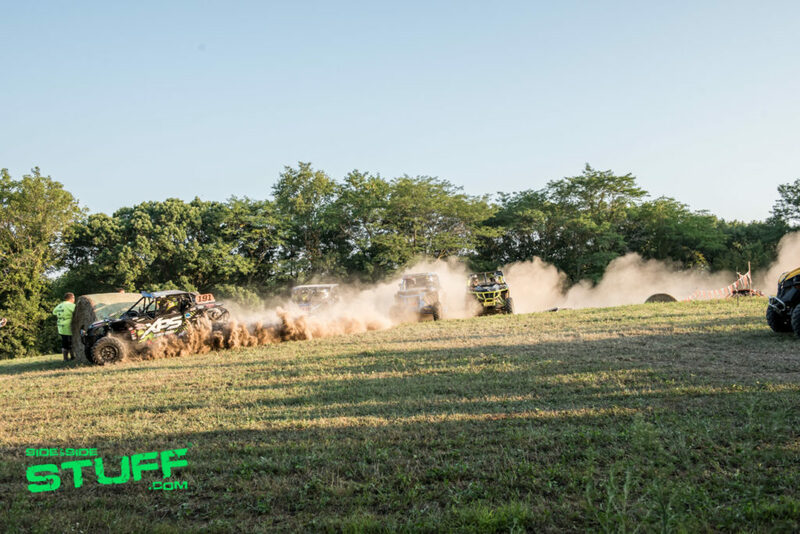 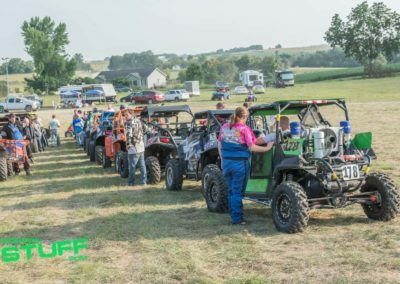 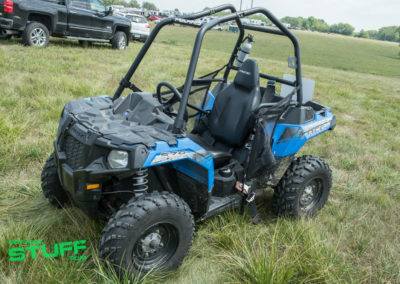 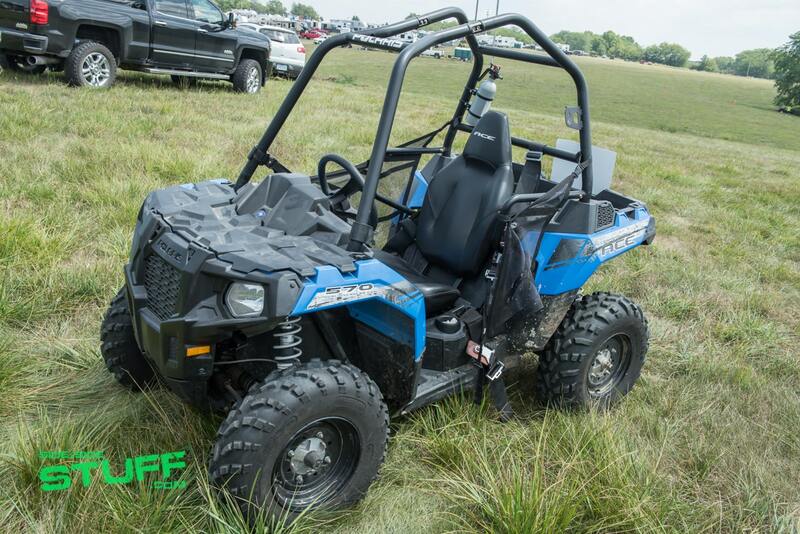 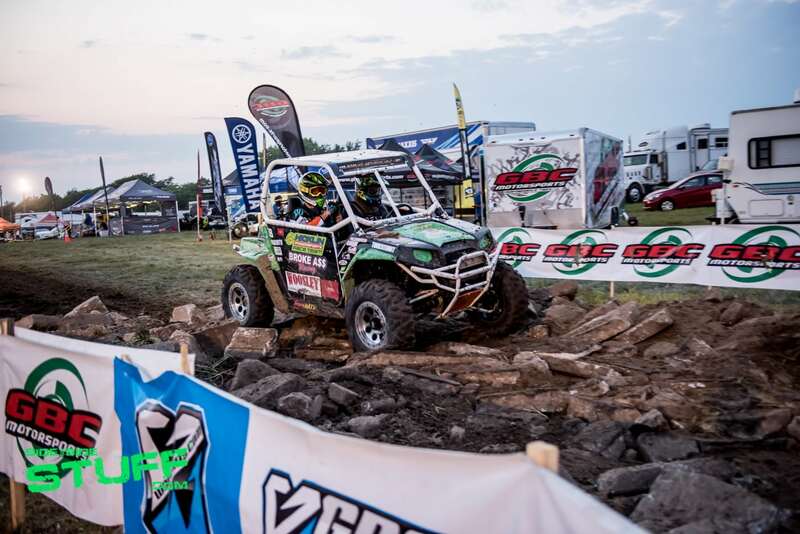 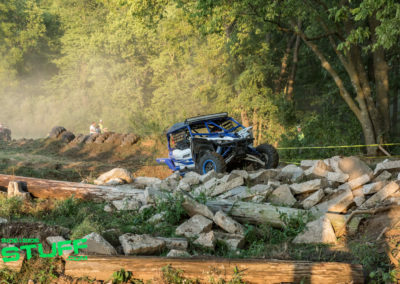 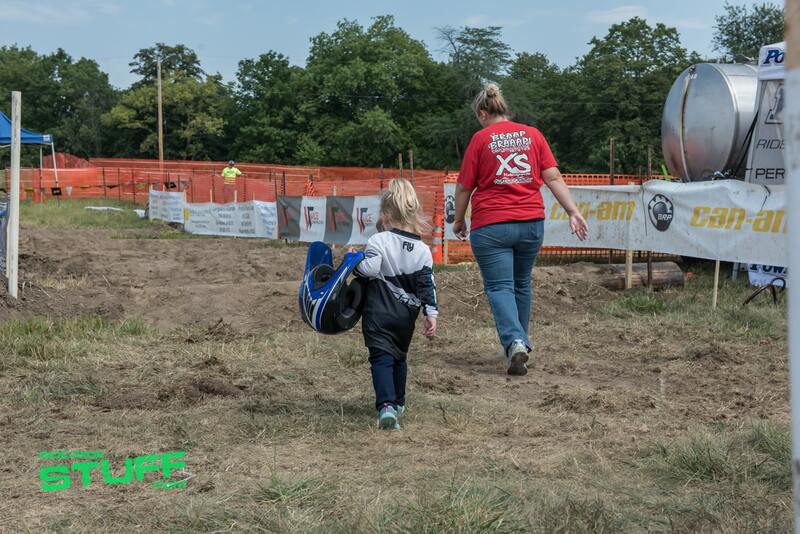 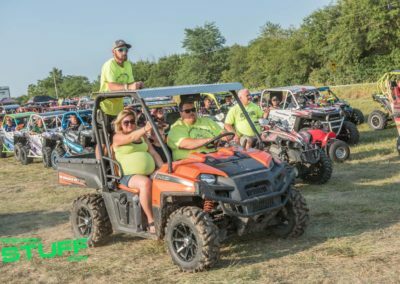 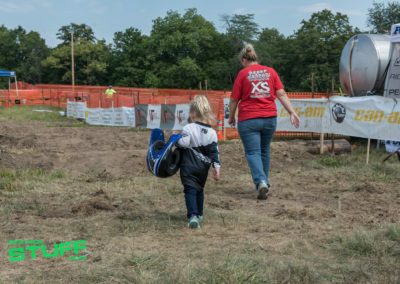 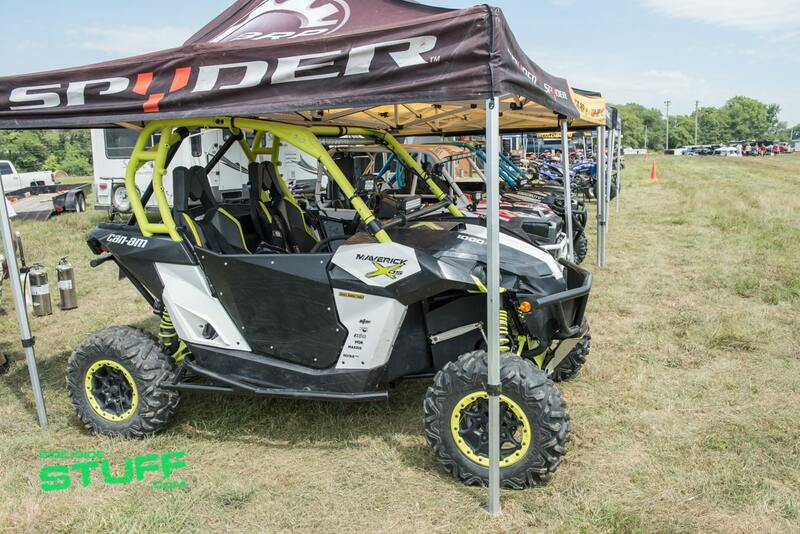 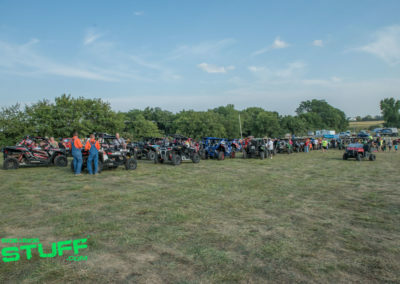 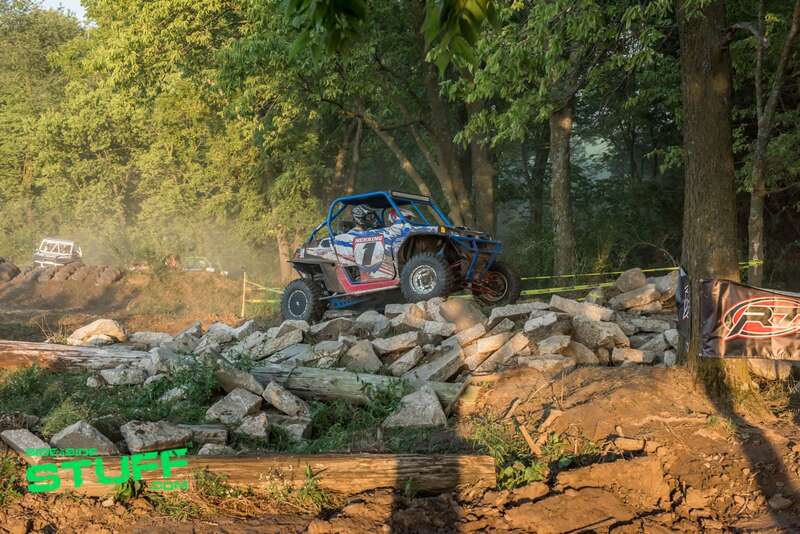 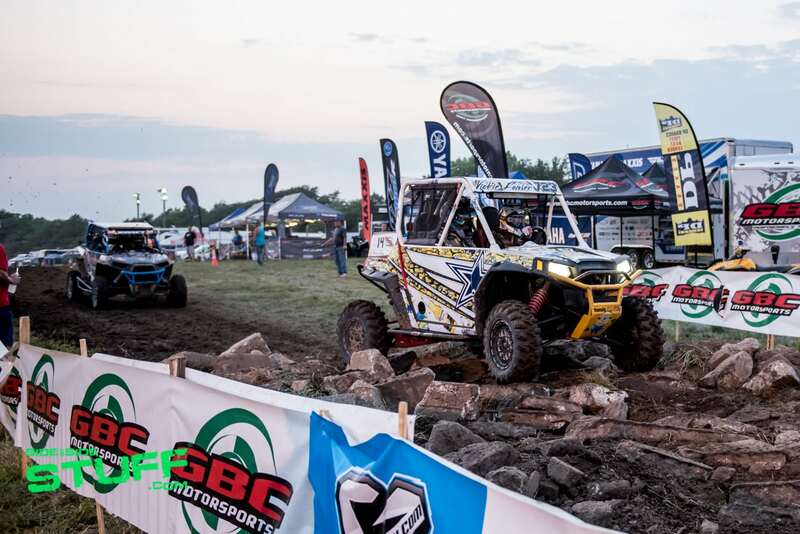 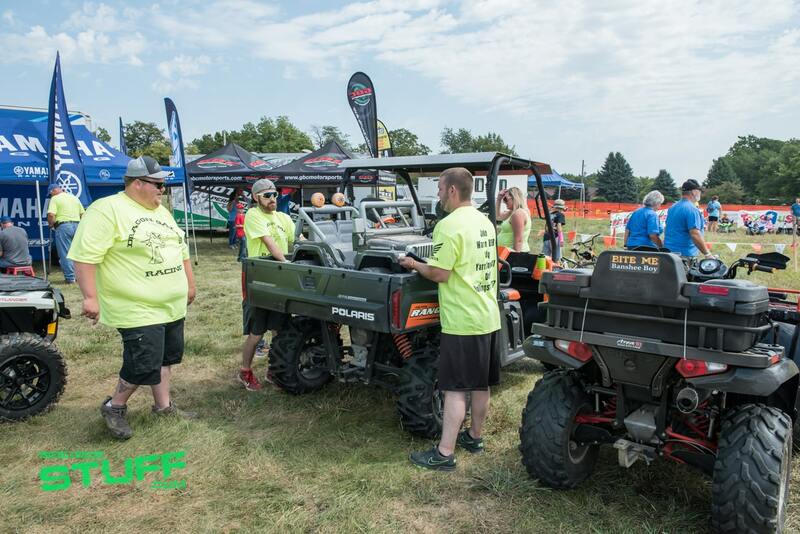 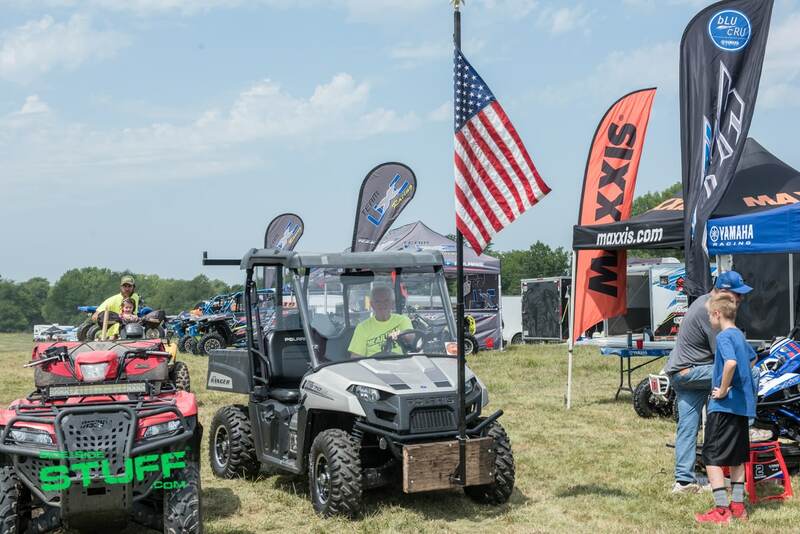 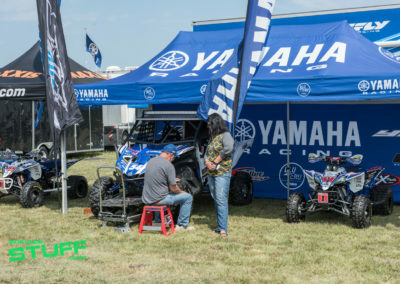 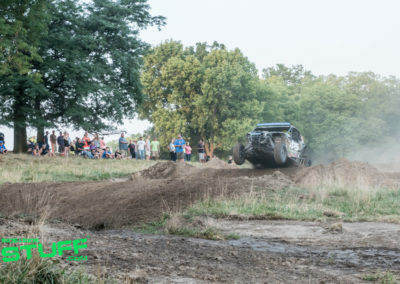 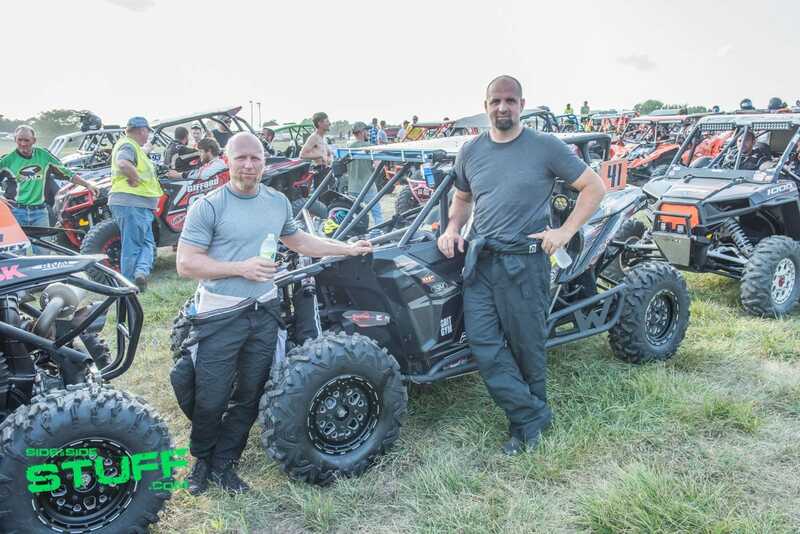 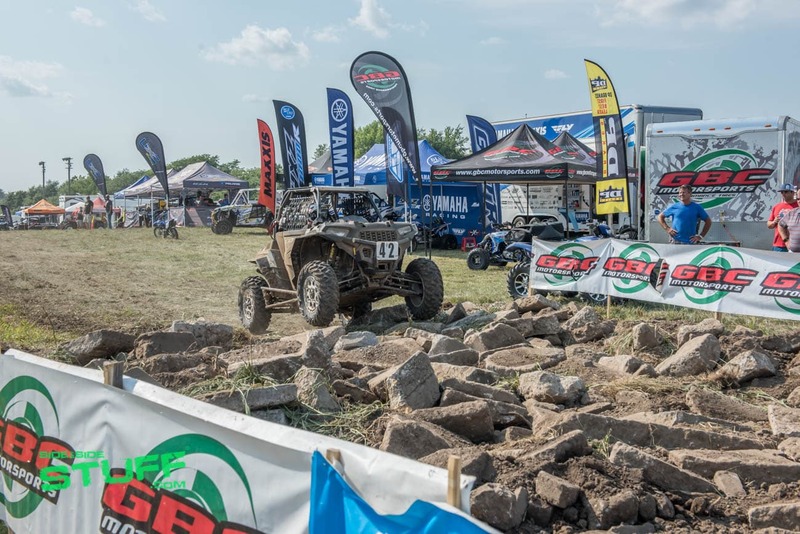 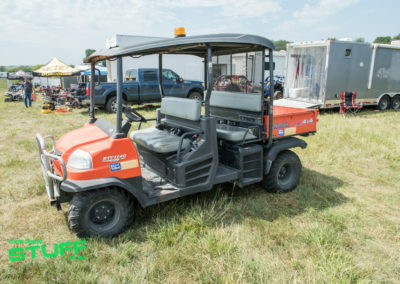 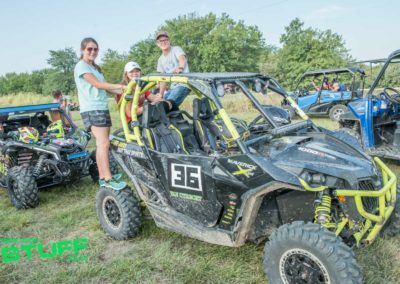 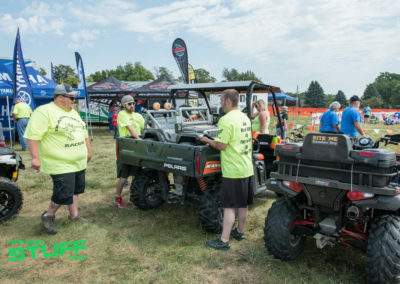 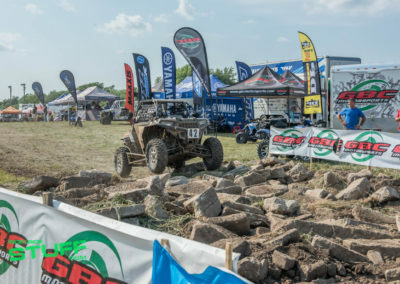 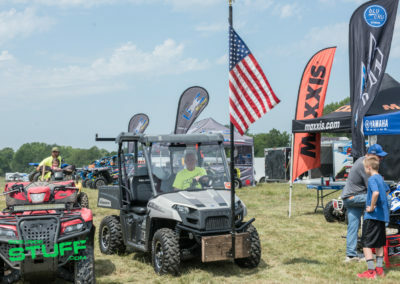 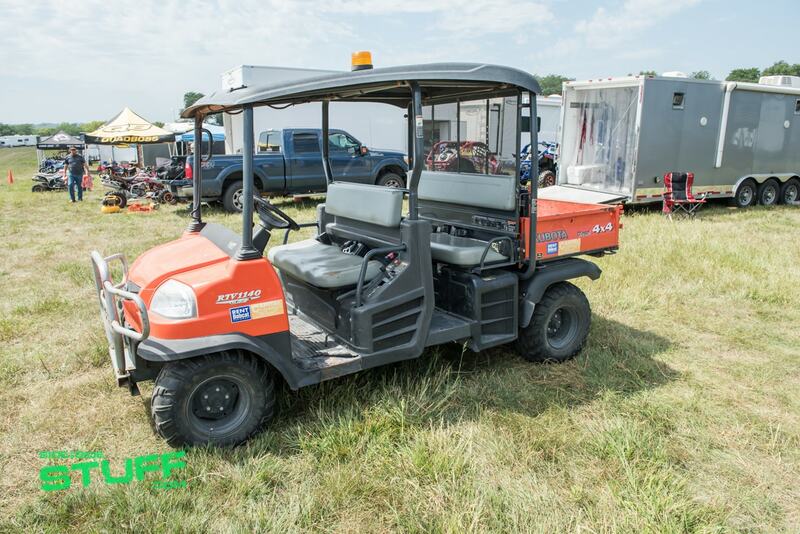 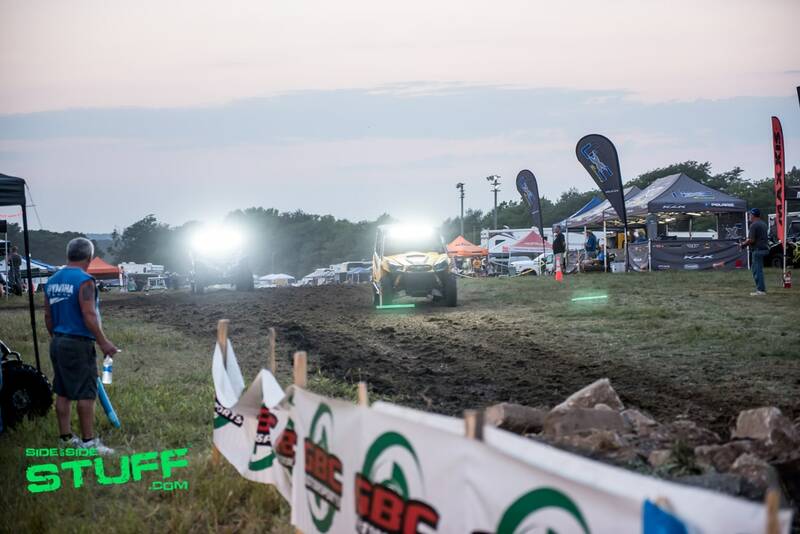 For the last 10 years, a 500 acre chunk of land just outside of Des Moines, IA has been transformed into a cross-country paradise for the annual running of the GBC Motorsports Heartland Challenge. 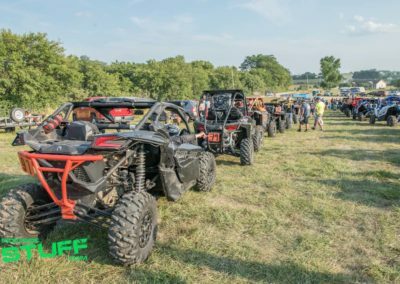 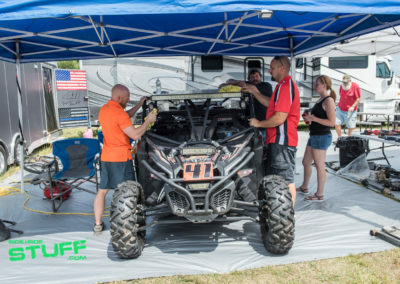 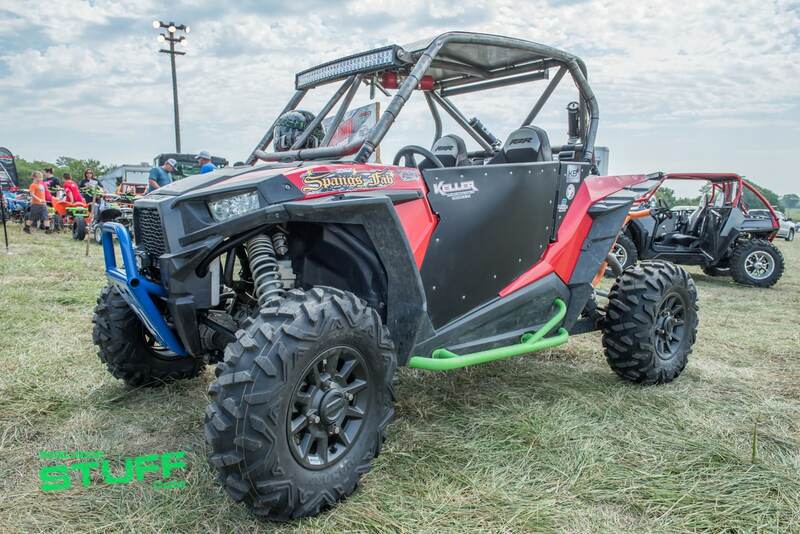 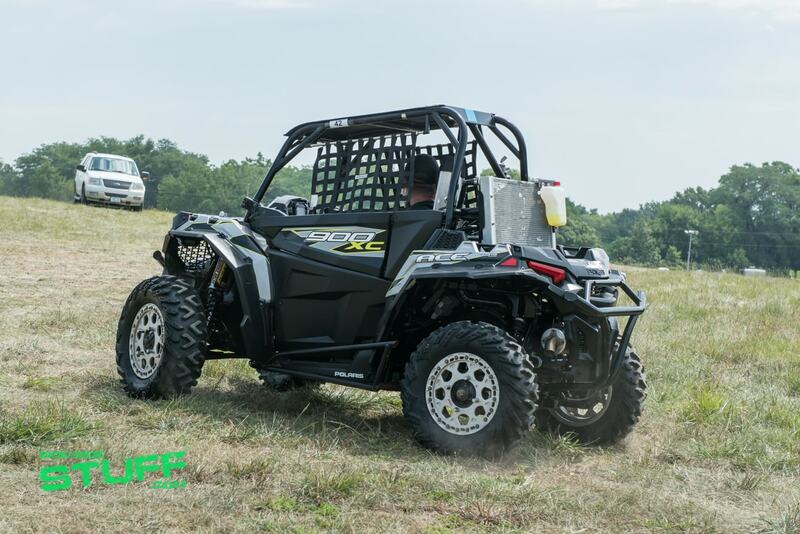 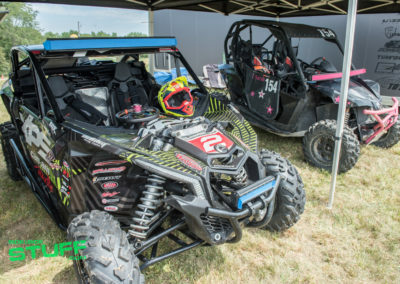 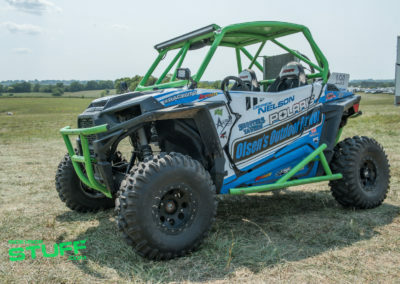 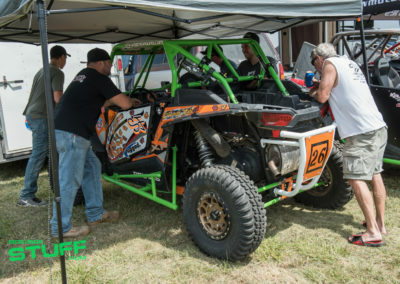 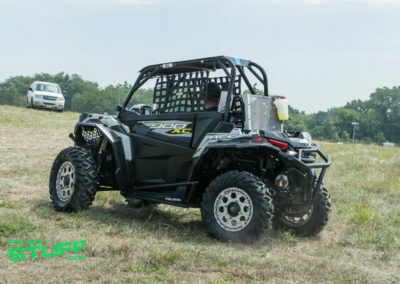 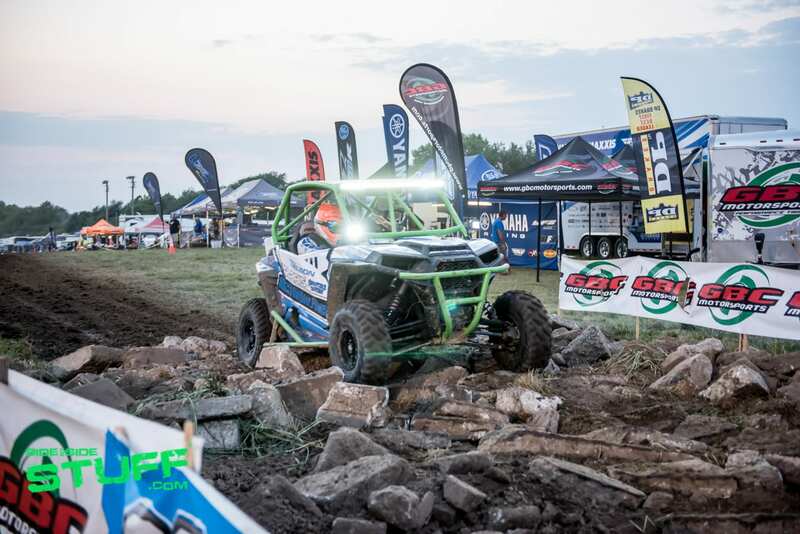 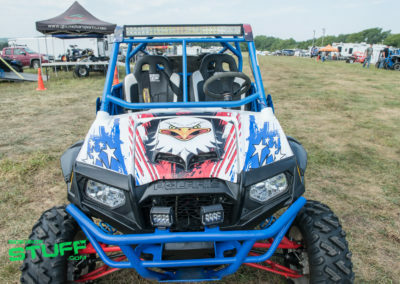 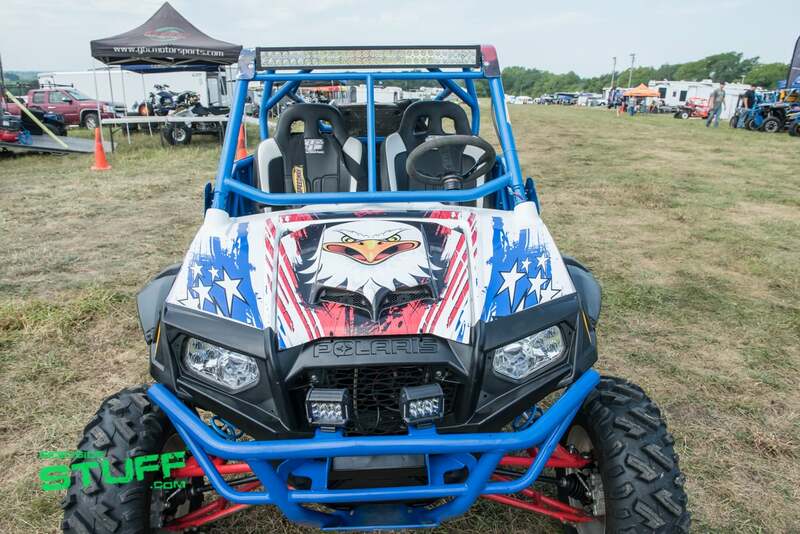 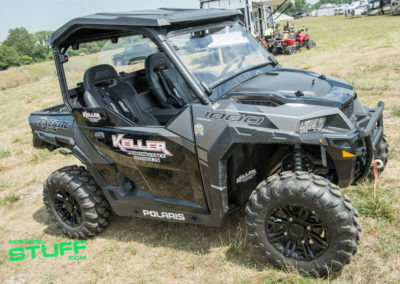 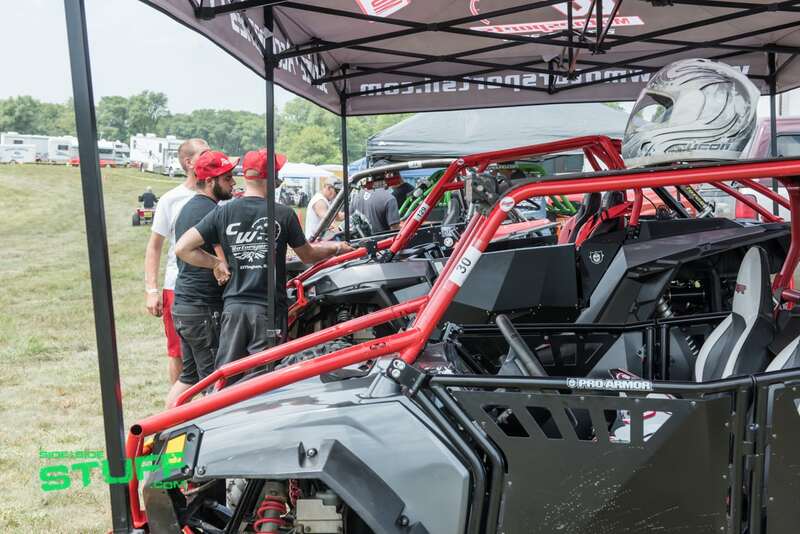 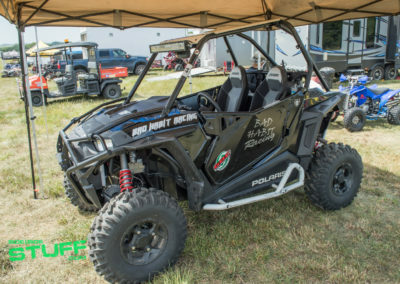 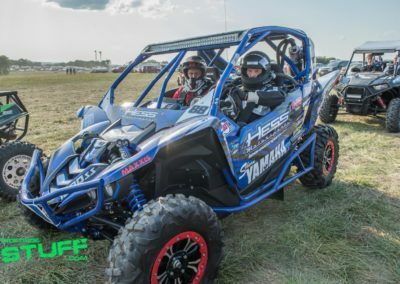 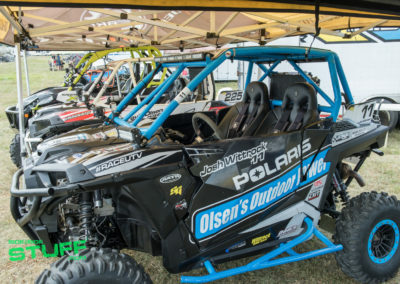 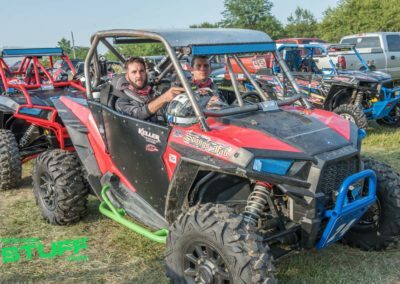 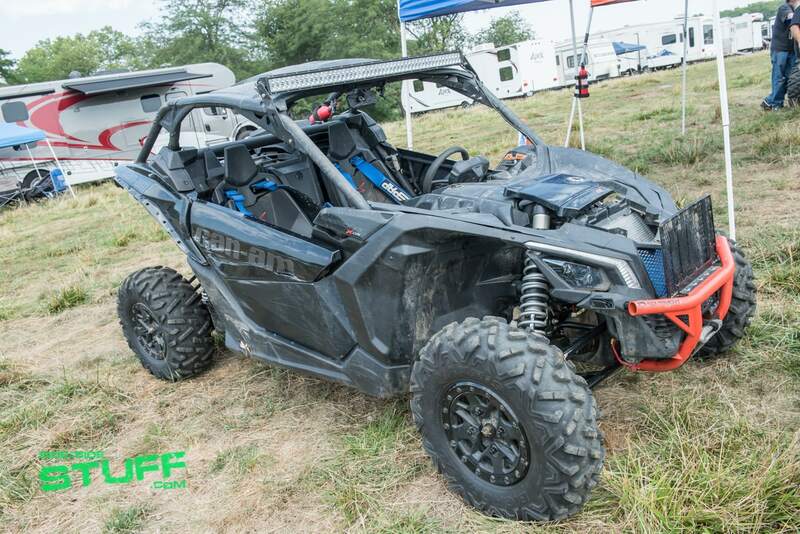 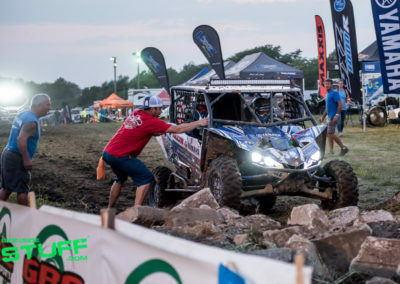 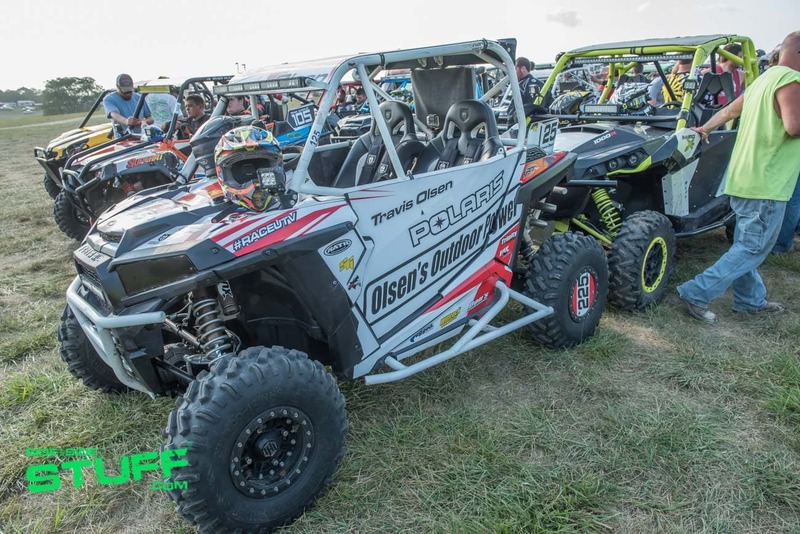 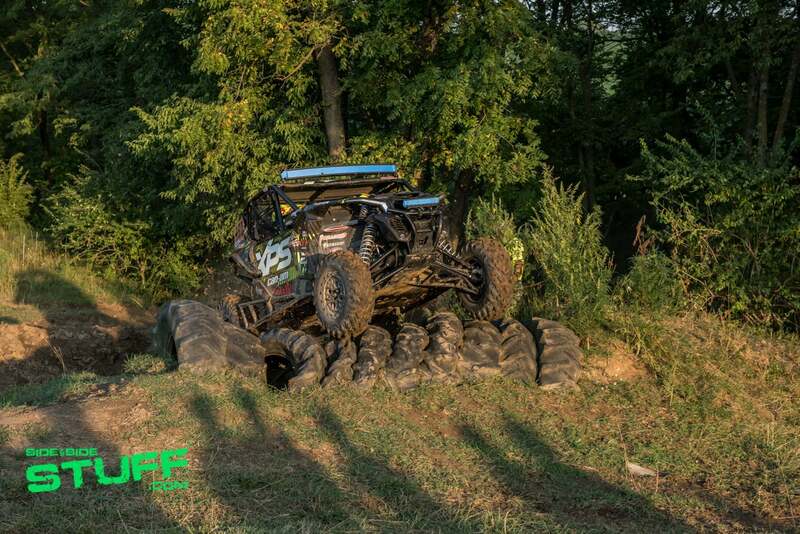 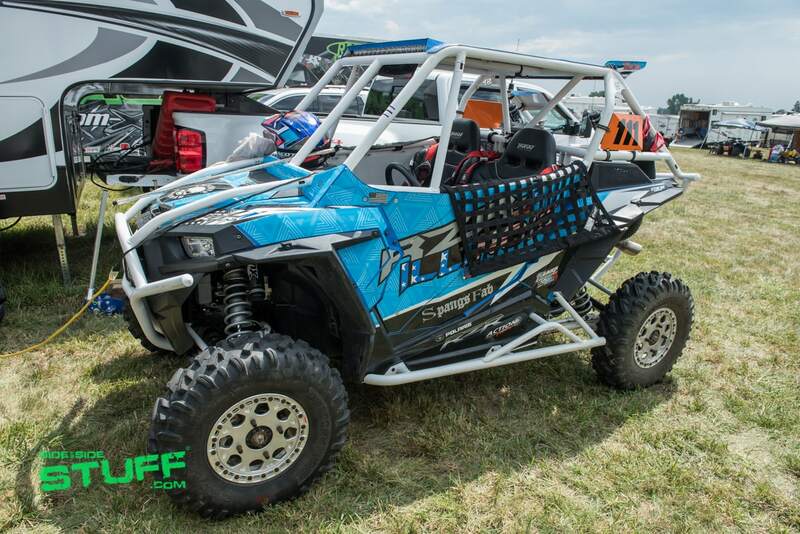 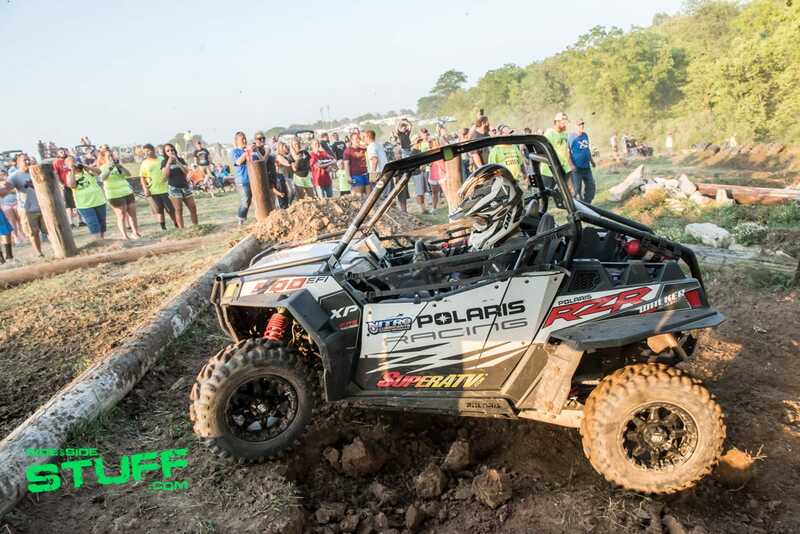 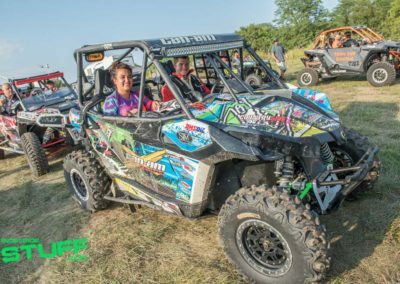 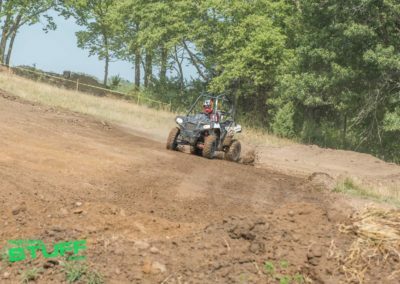 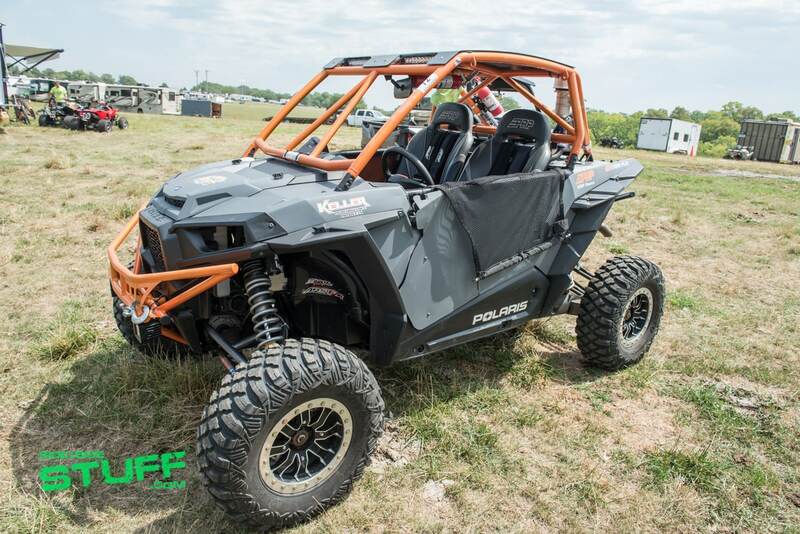 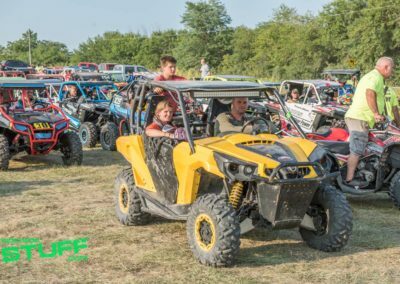 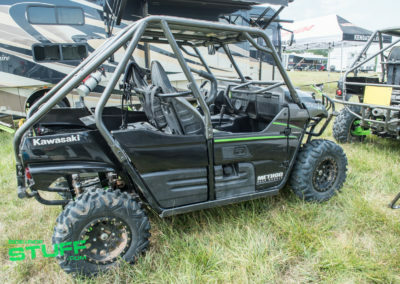 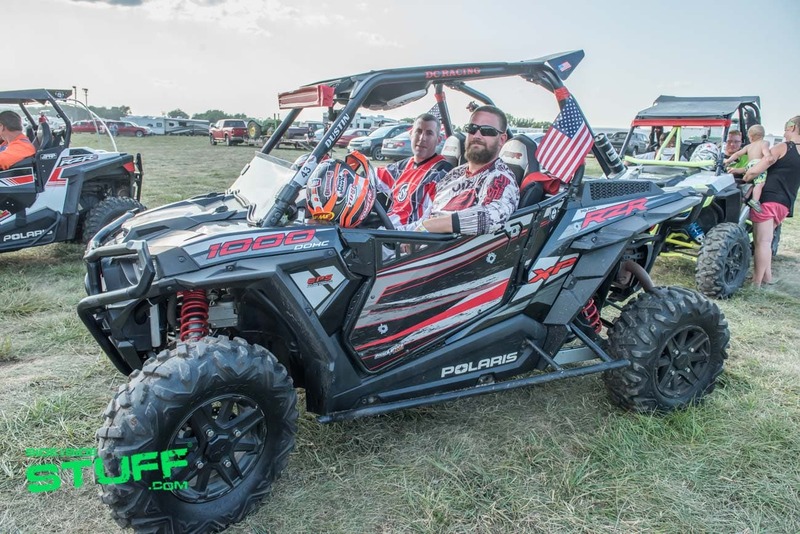 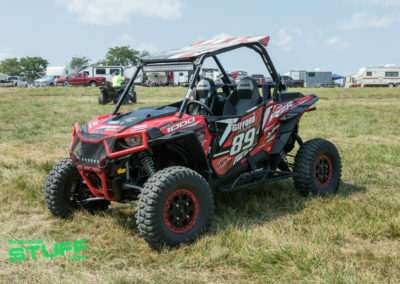 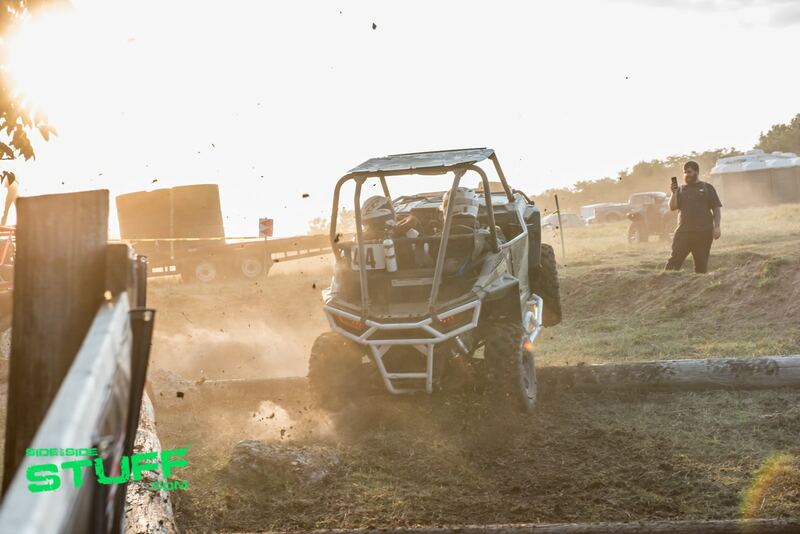 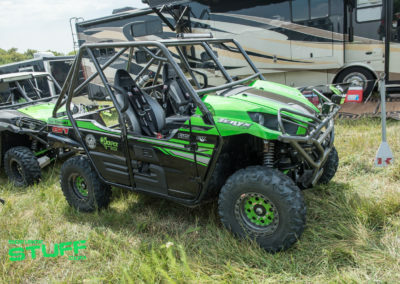 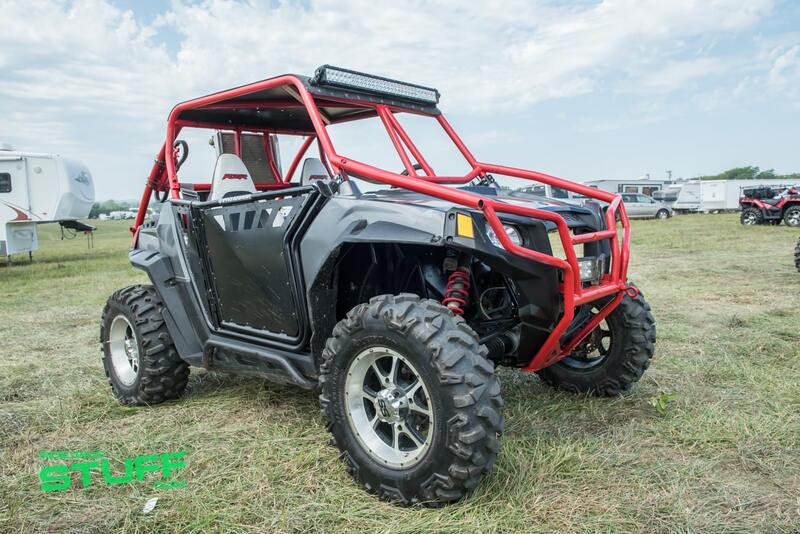 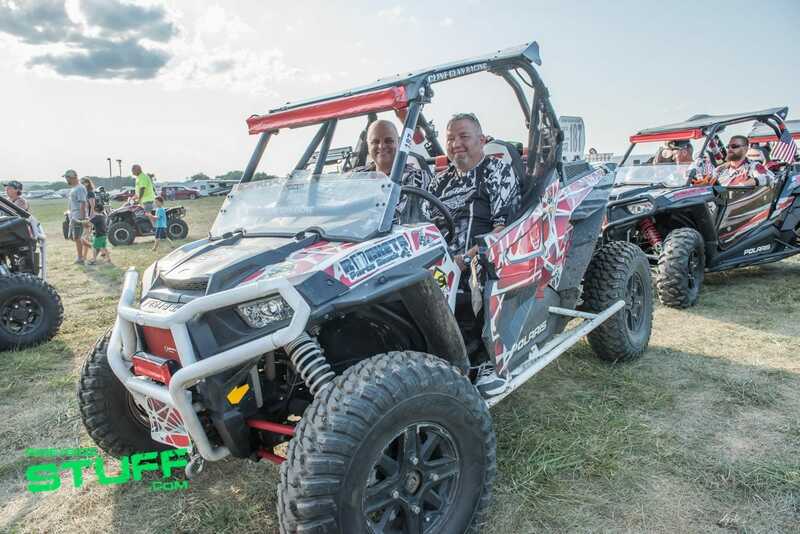 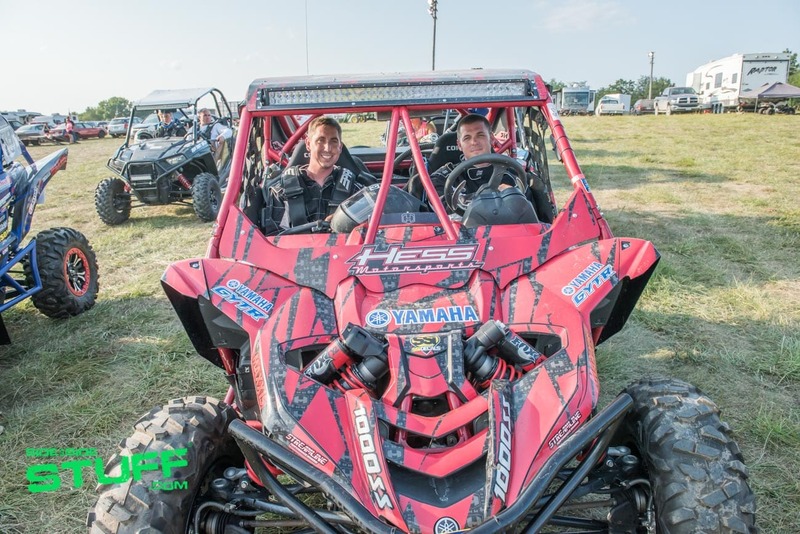 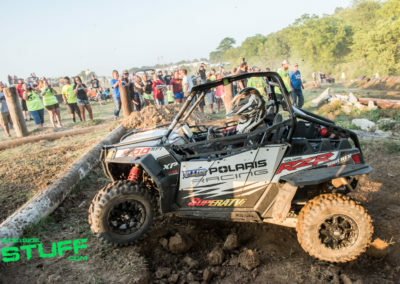 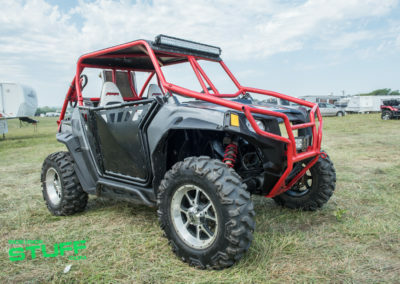 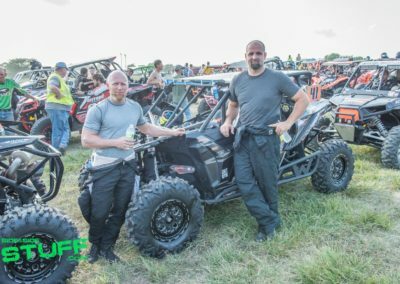 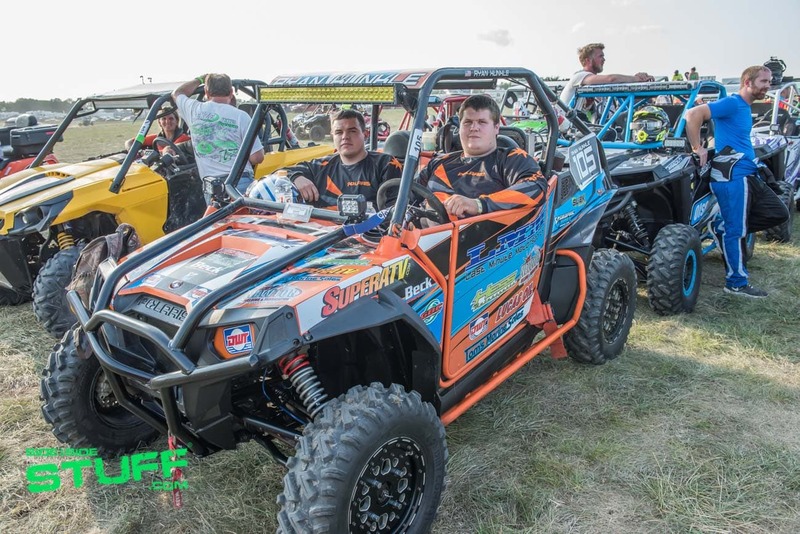 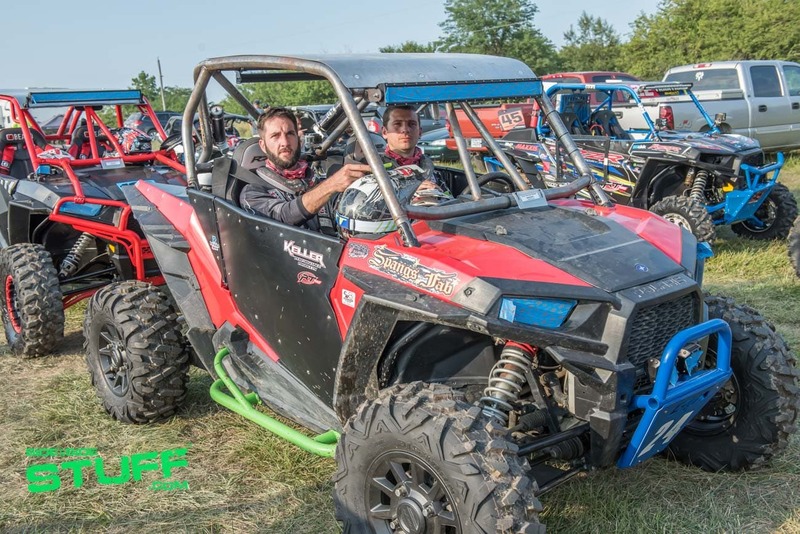 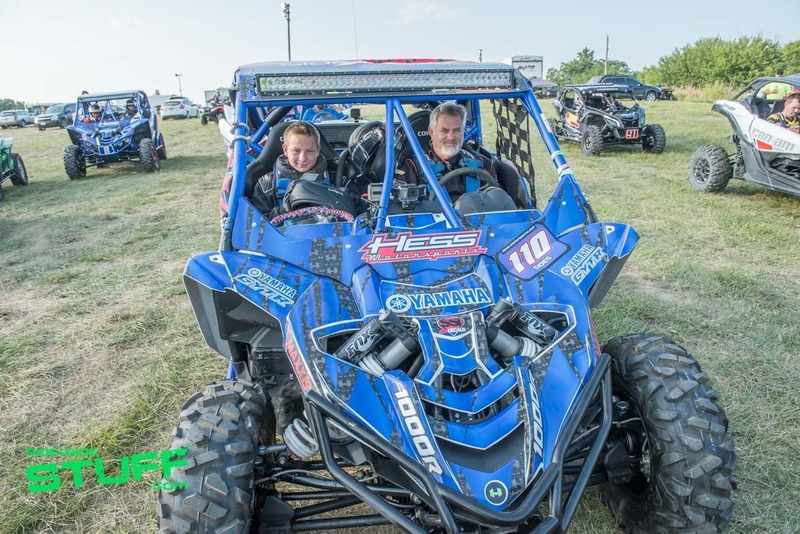 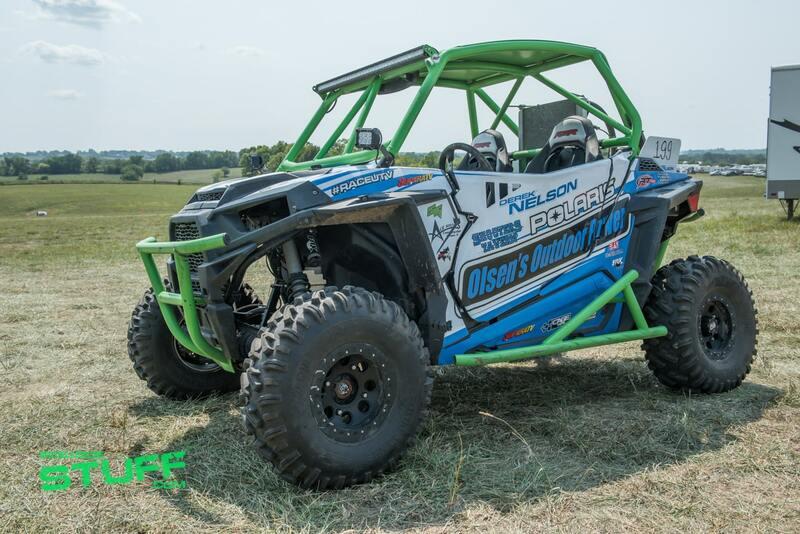 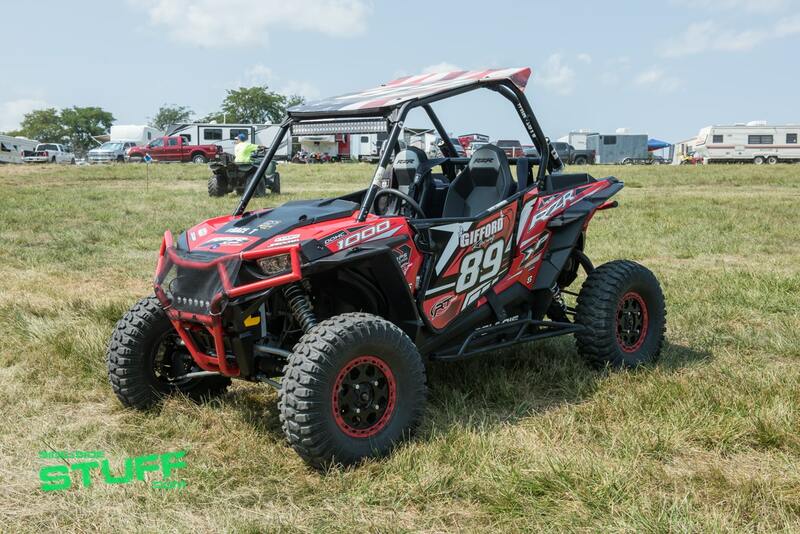 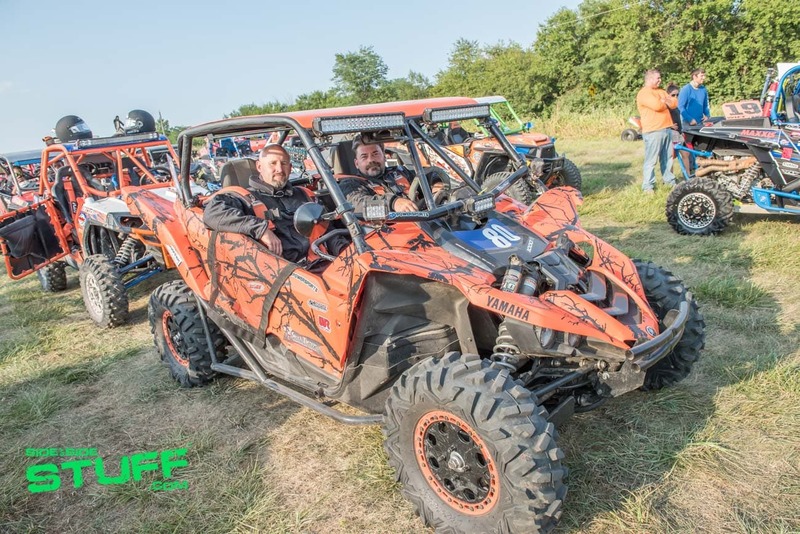 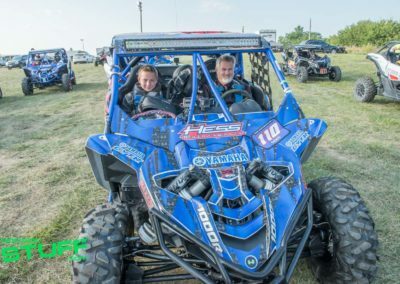 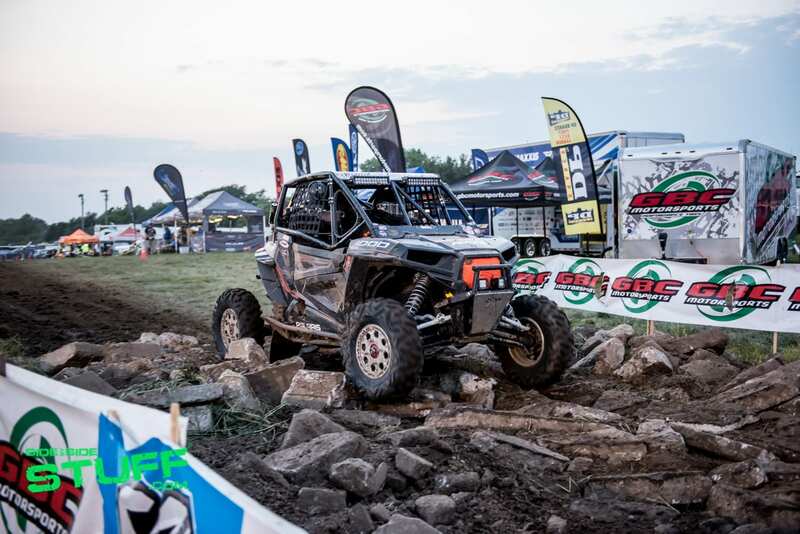 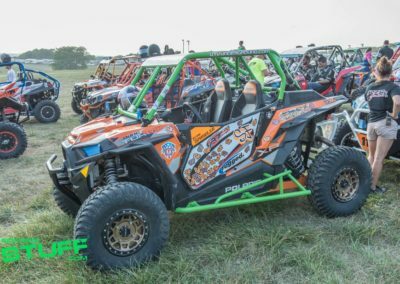 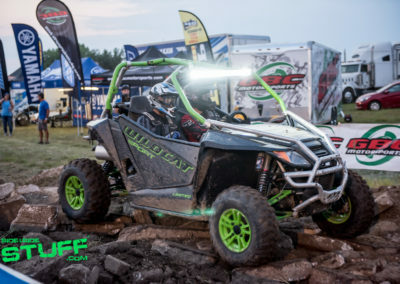 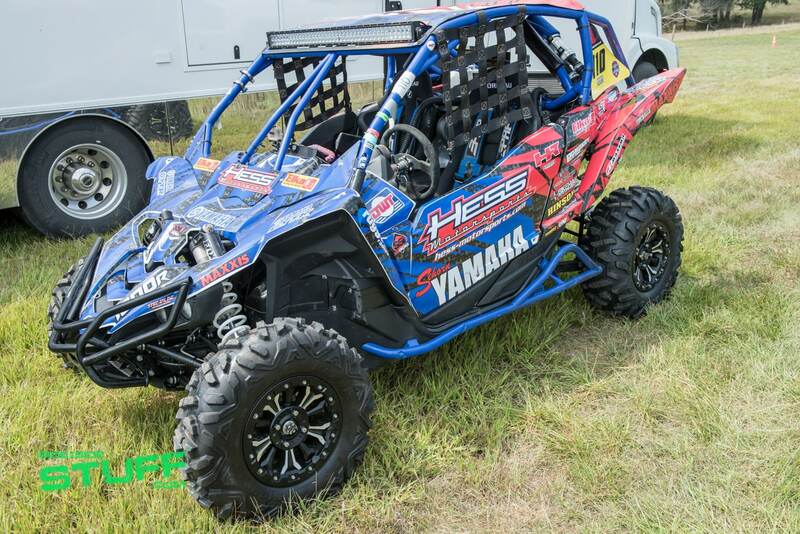 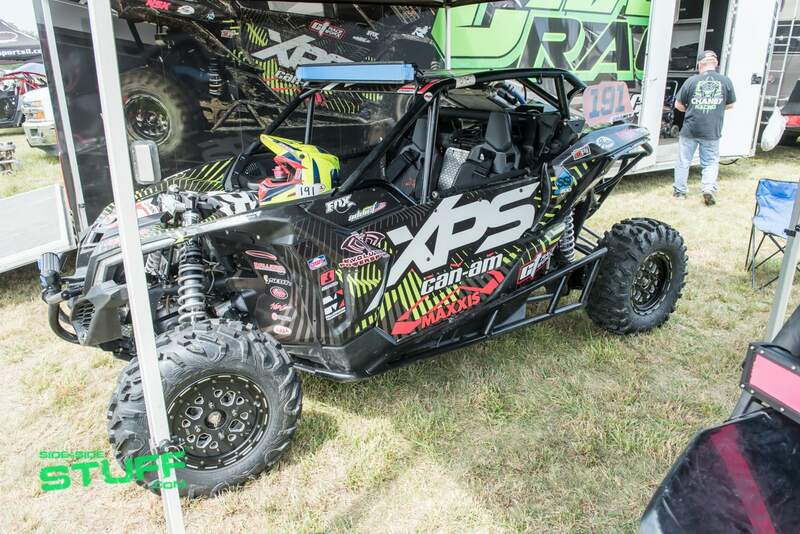 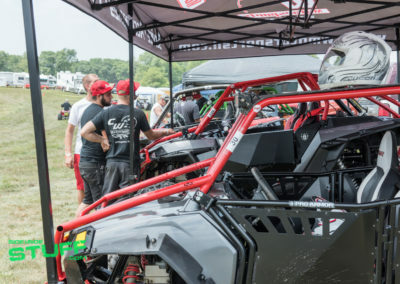 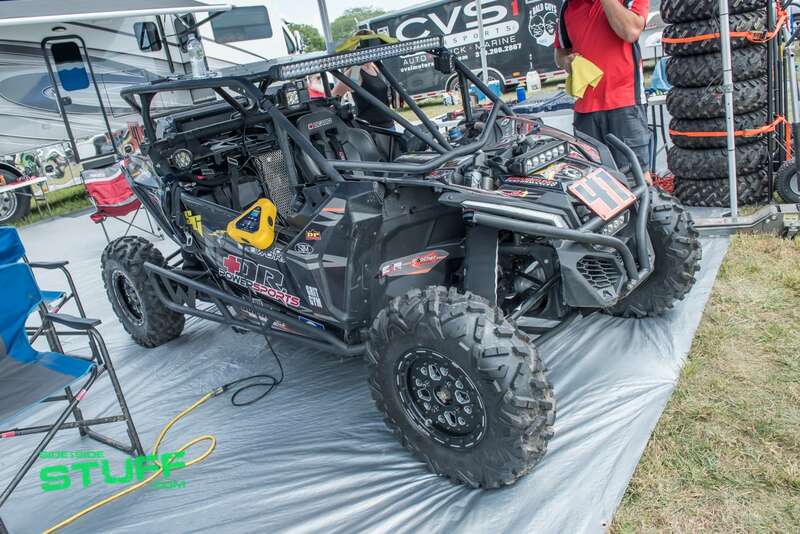 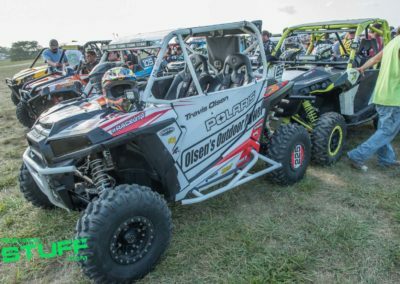 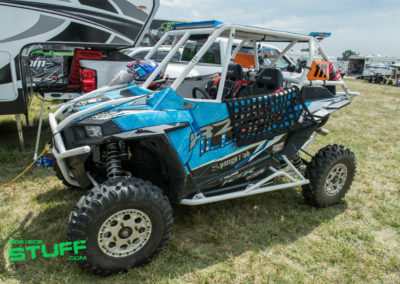 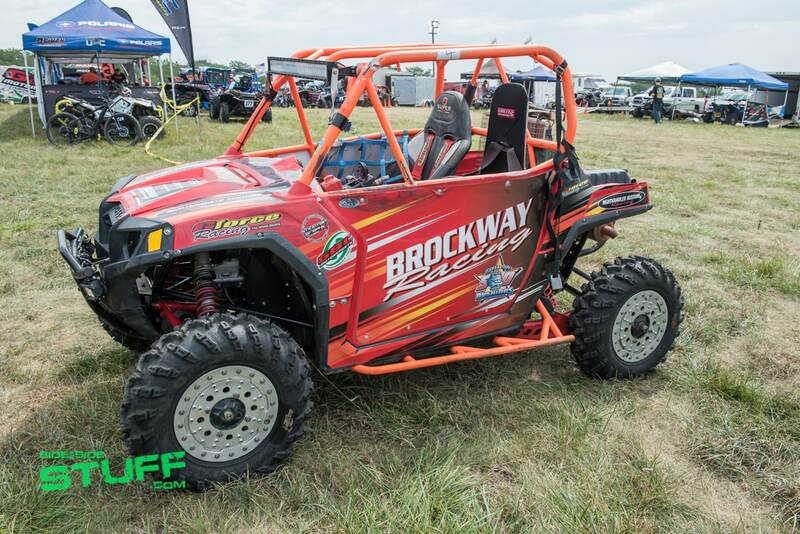 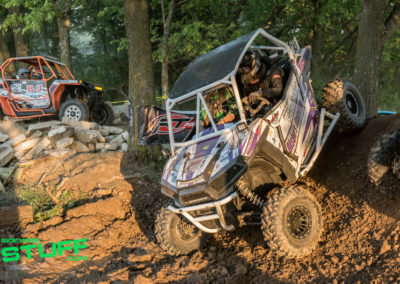 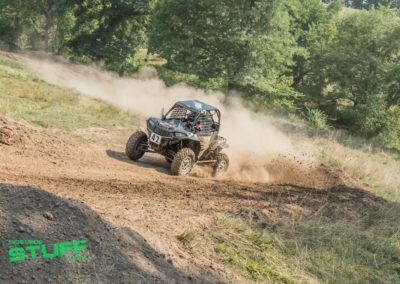 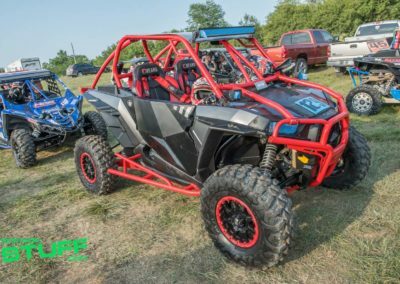 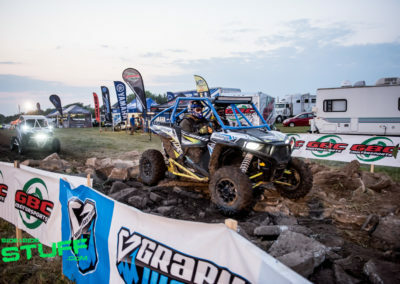 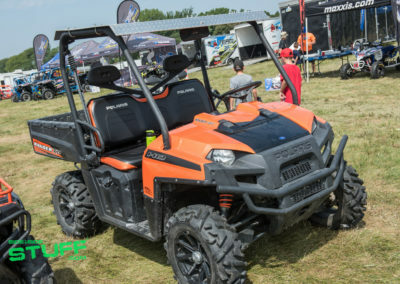 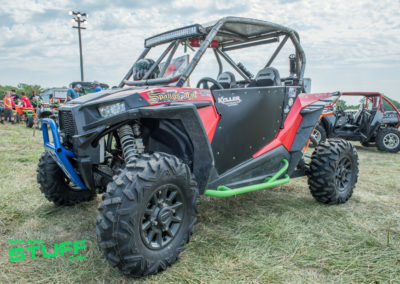 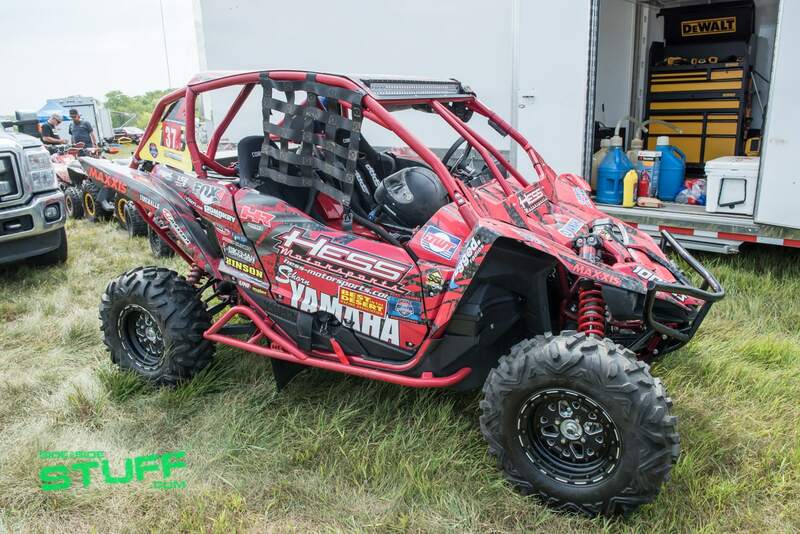 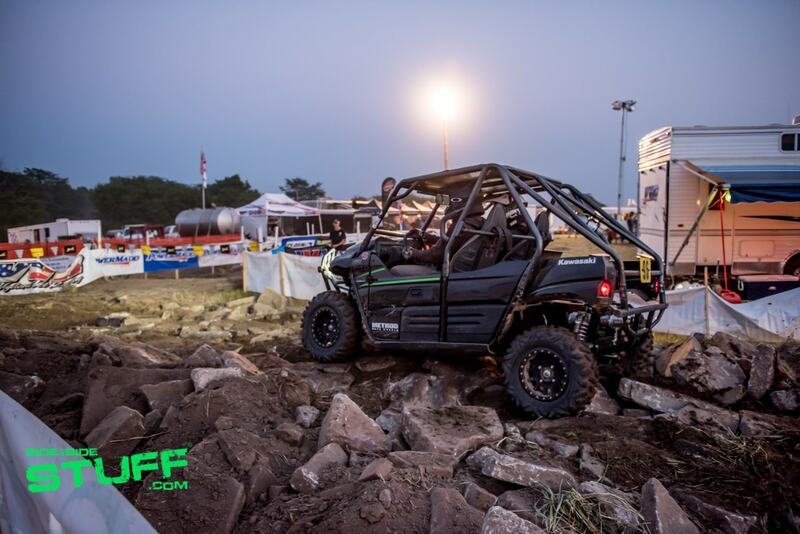 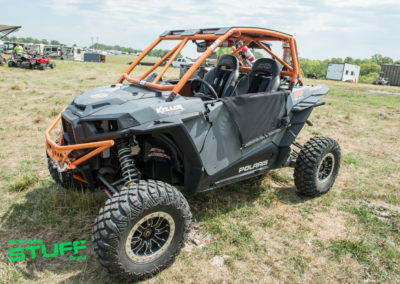 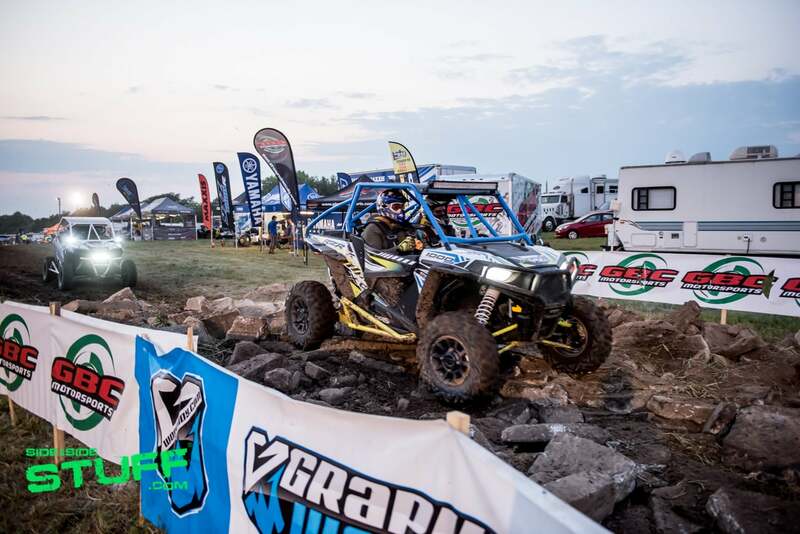 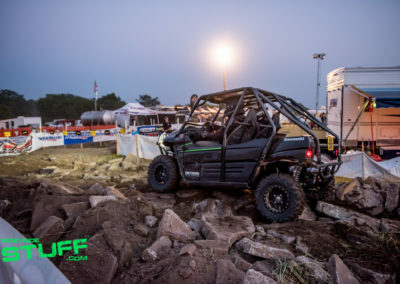 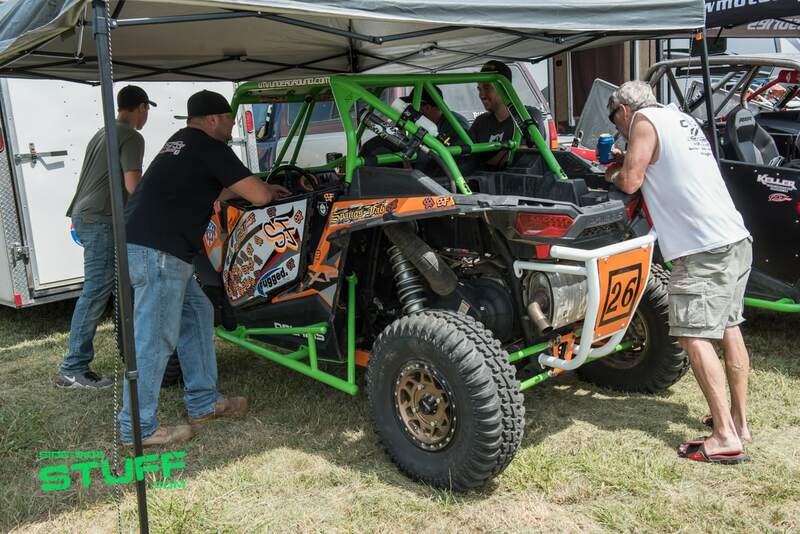 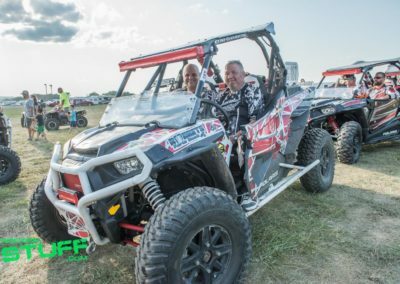 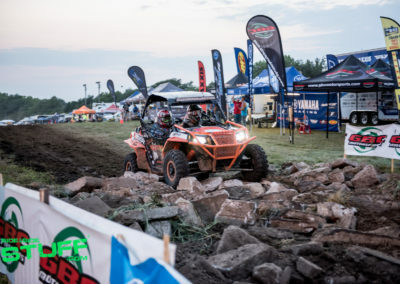 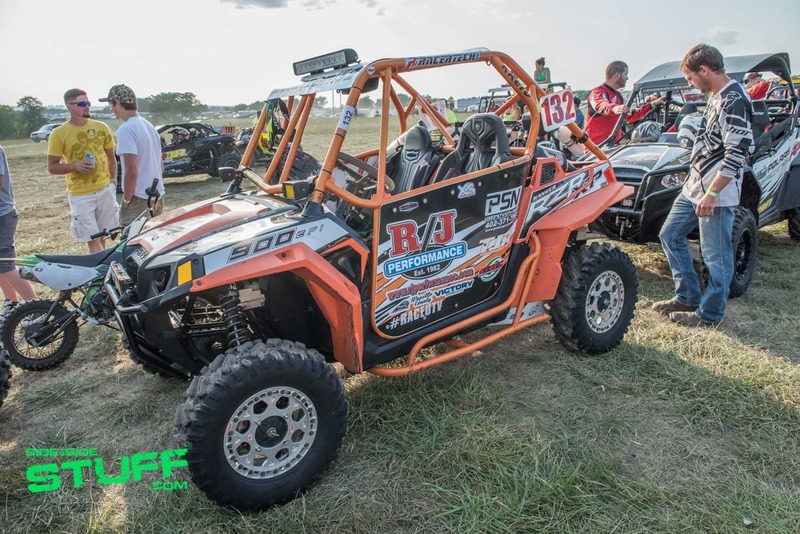 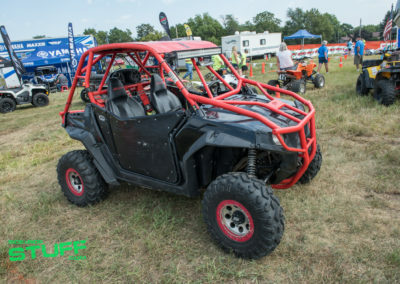 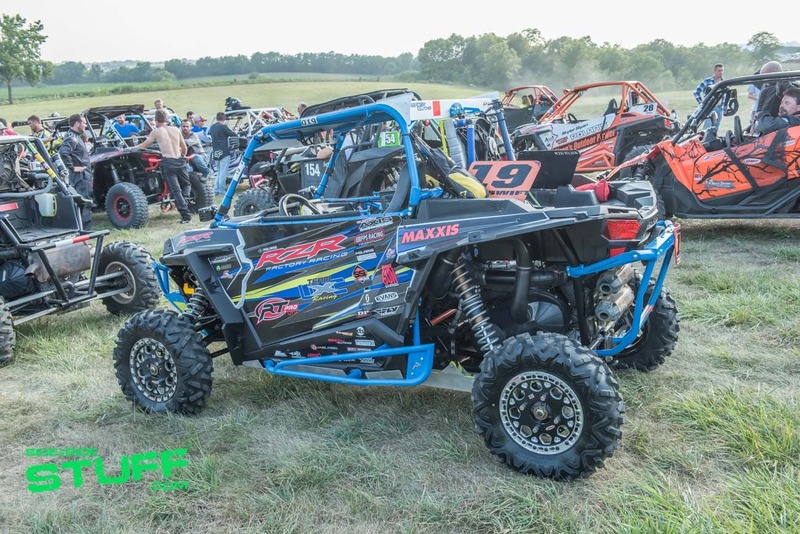 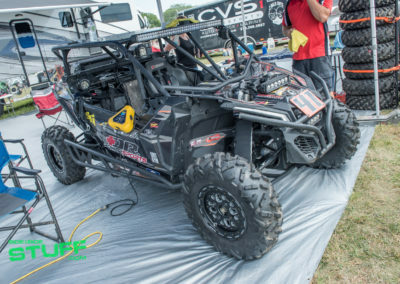 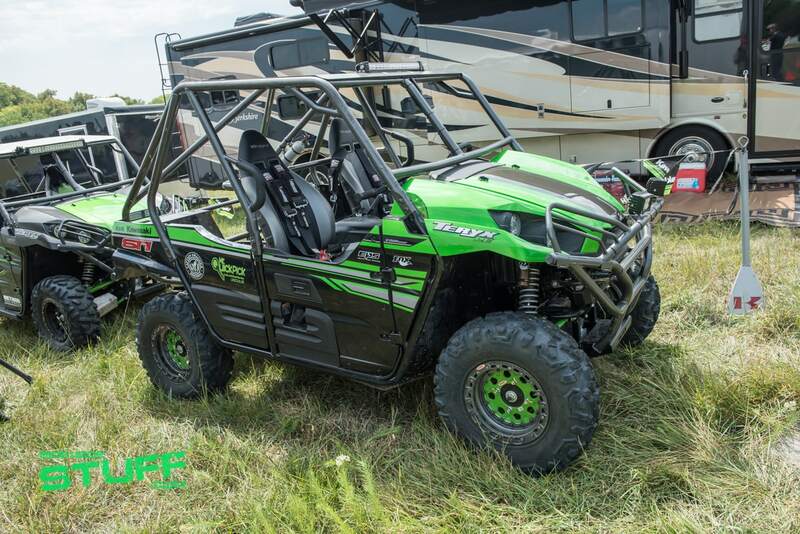 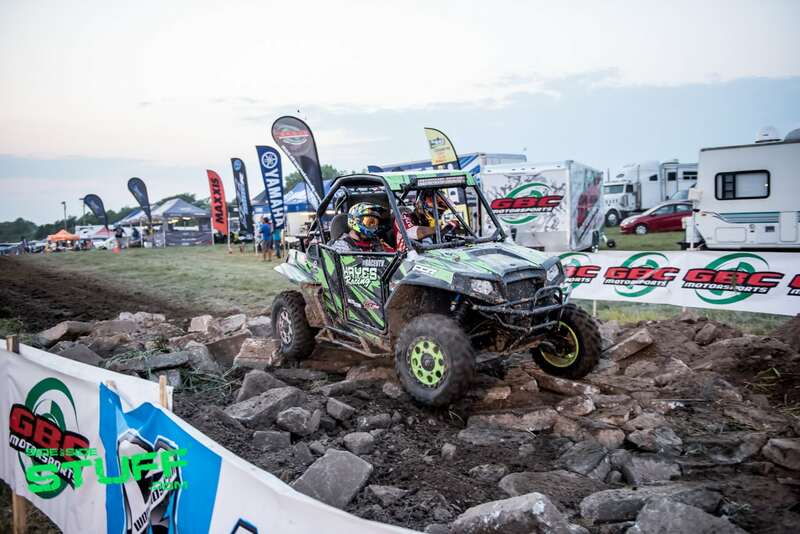 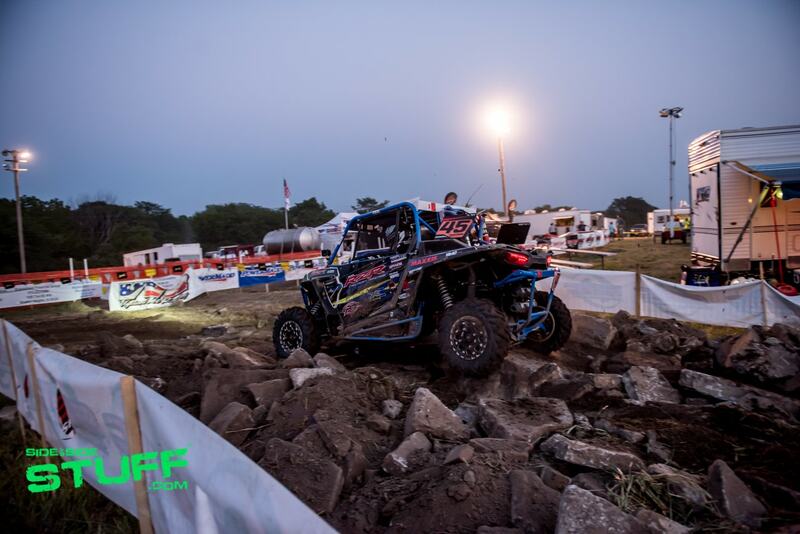 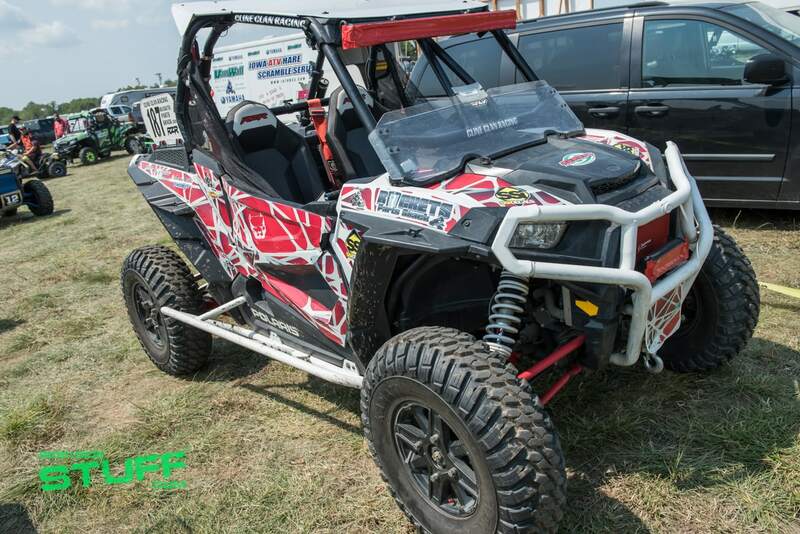 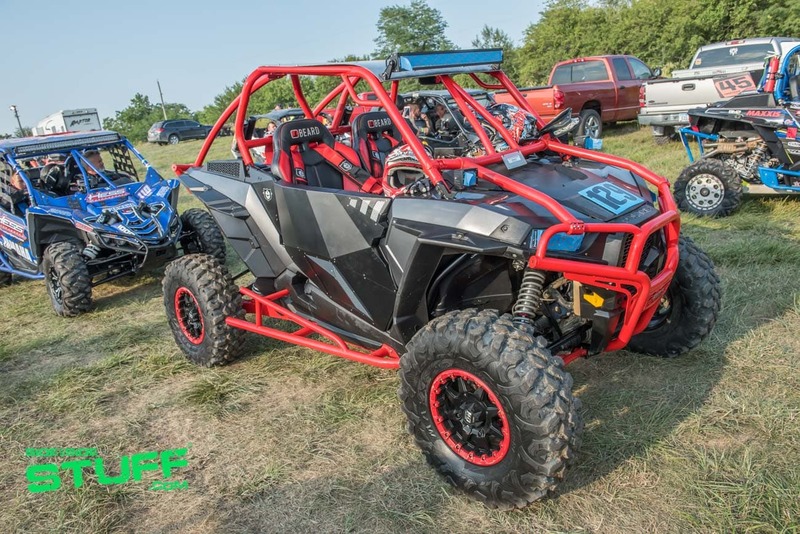 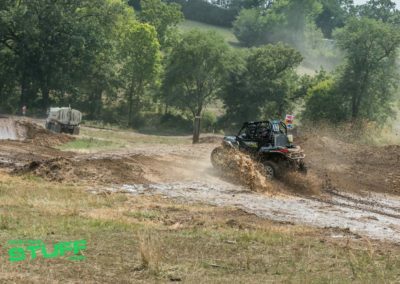 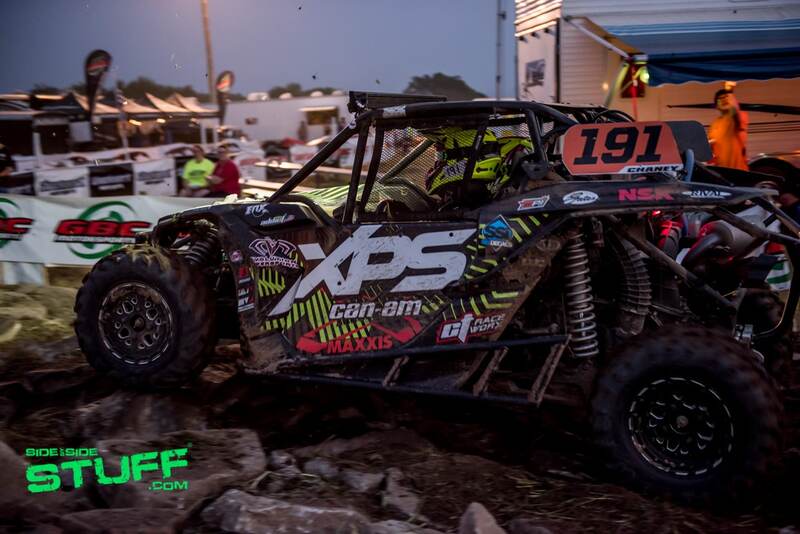 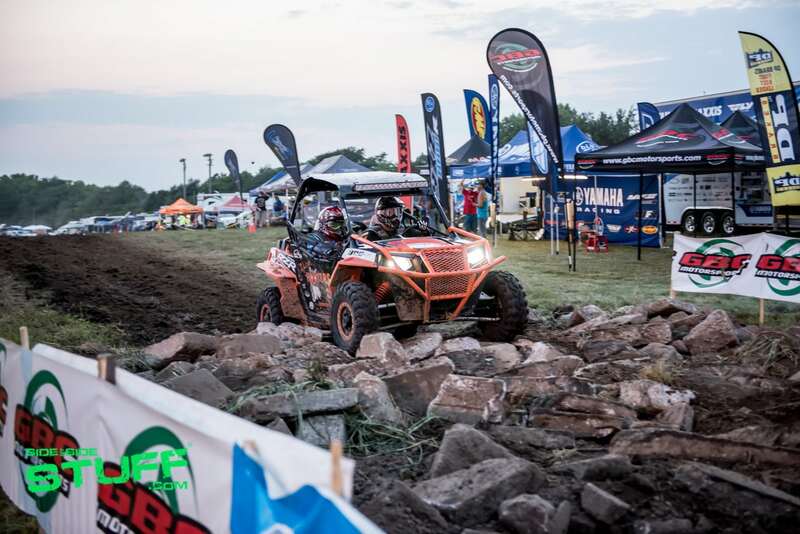 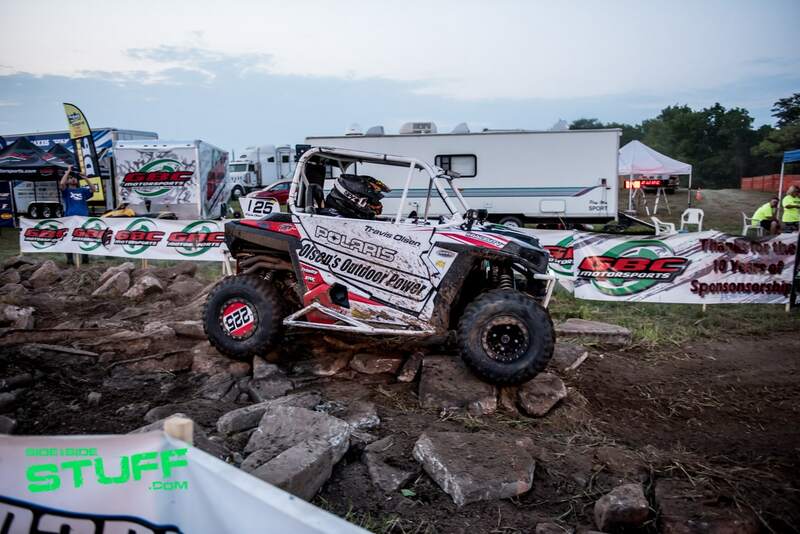 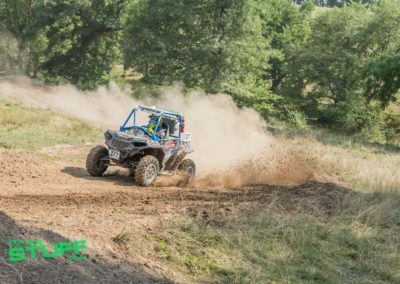 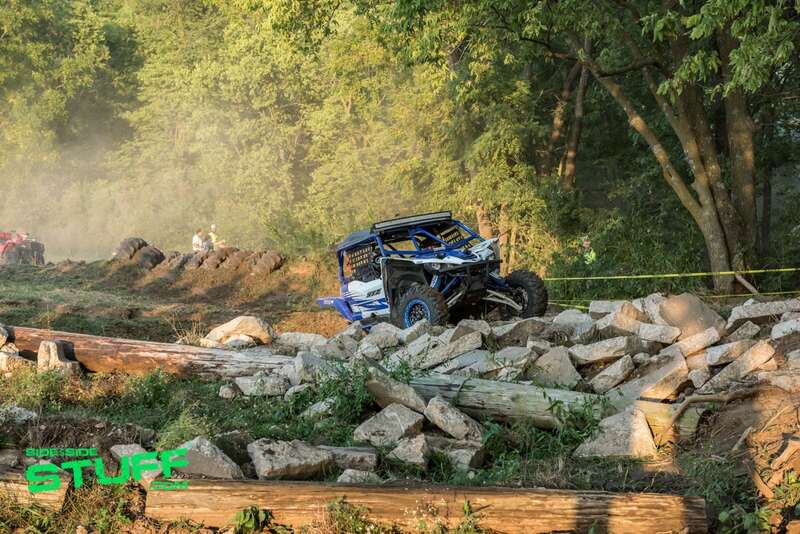 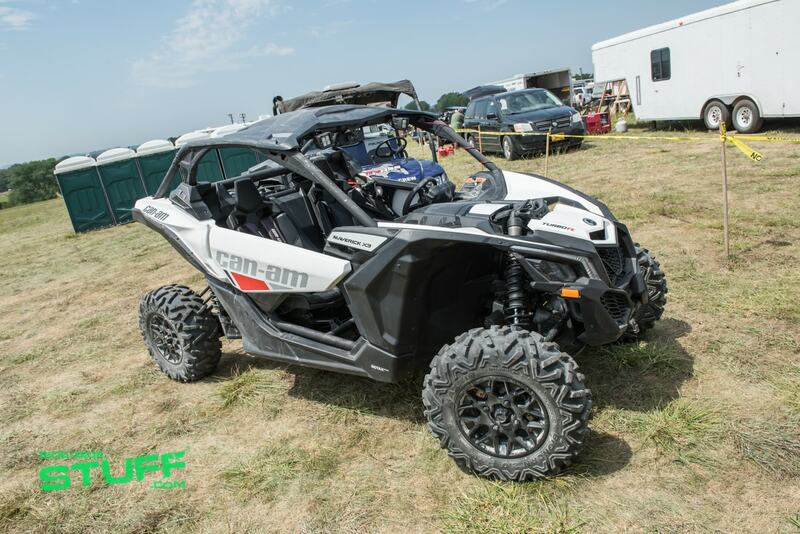 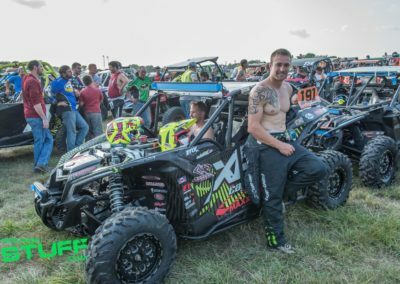 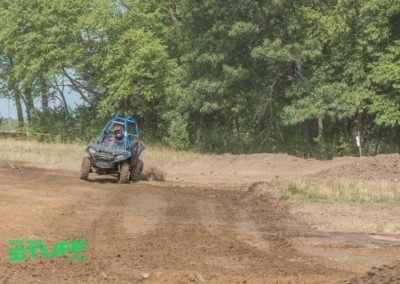 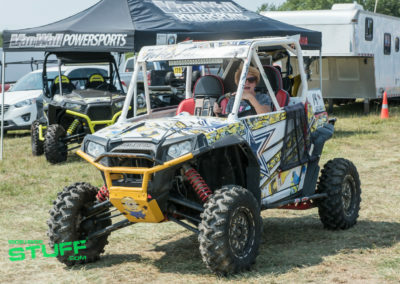 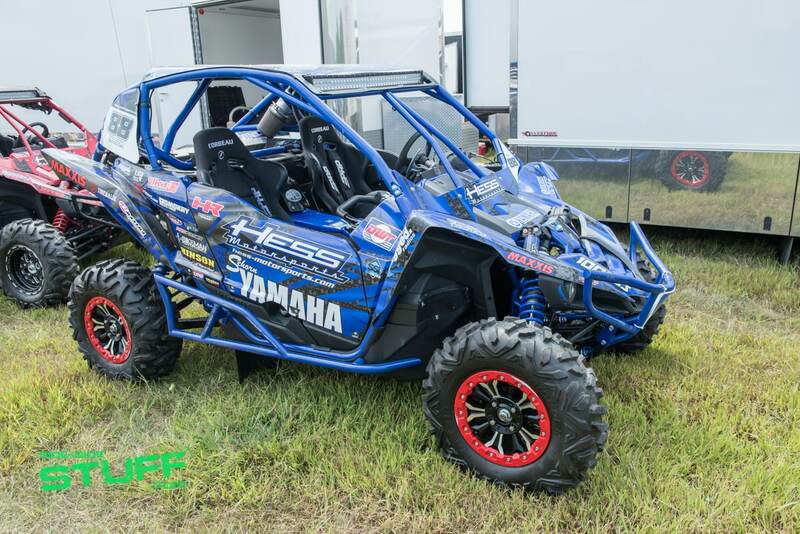 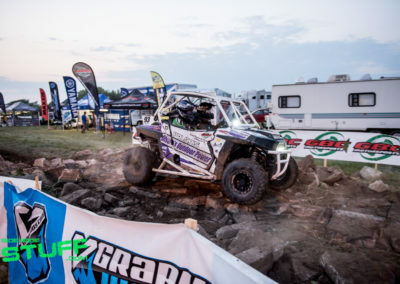 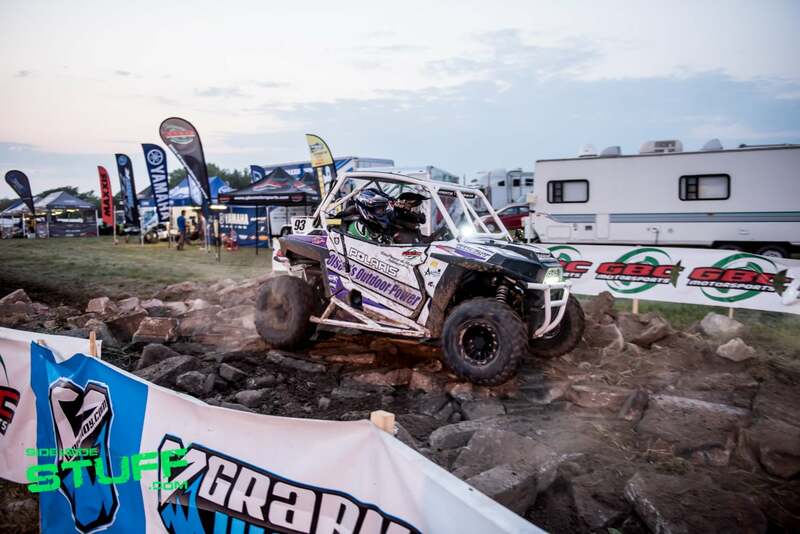 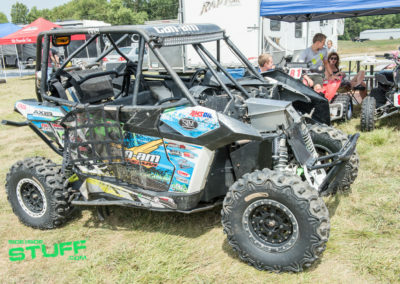 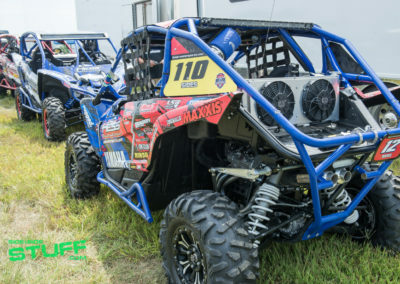 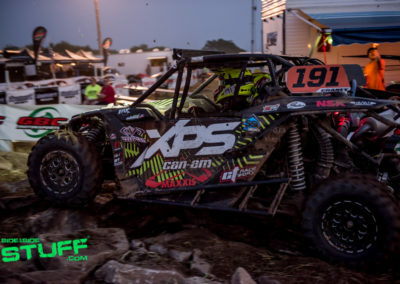 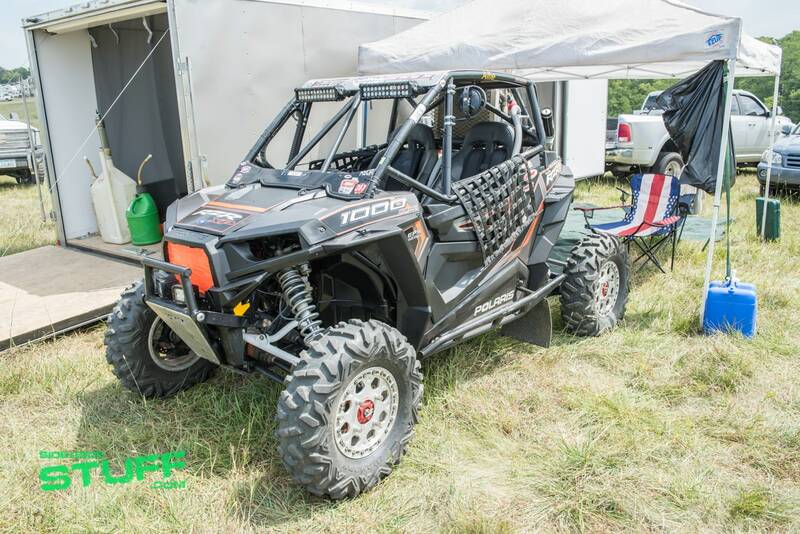 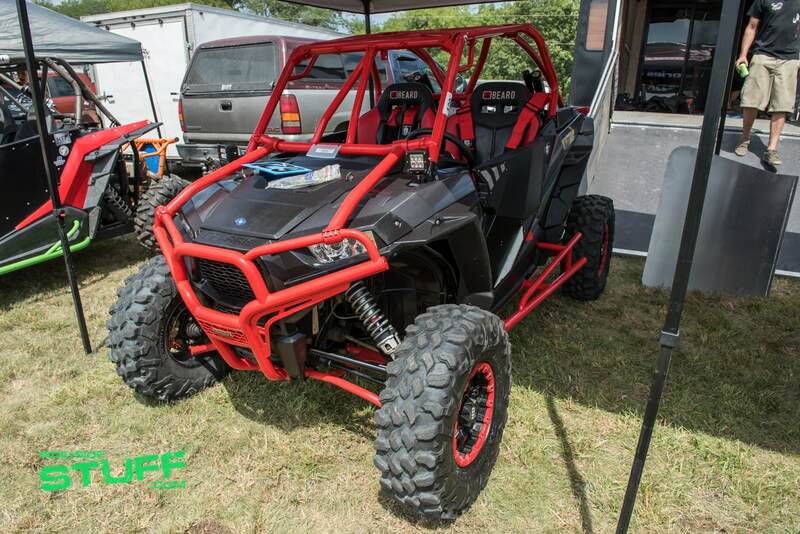 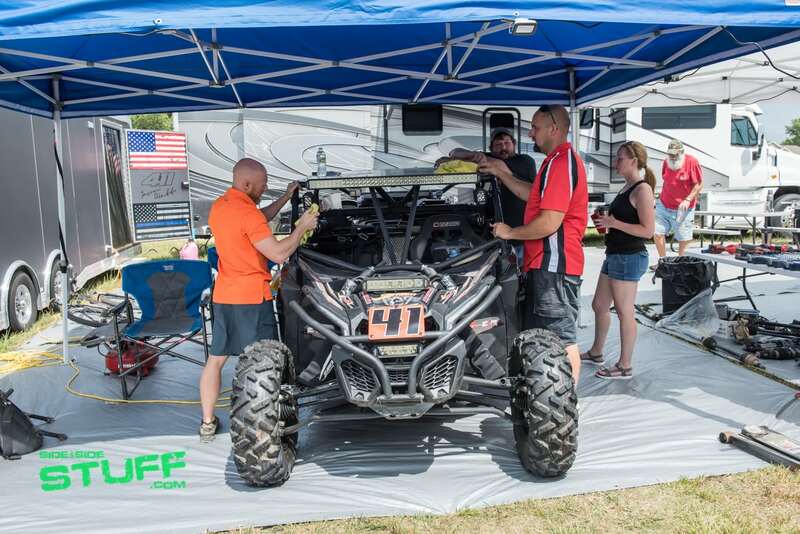 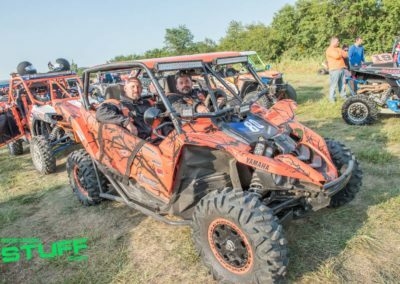 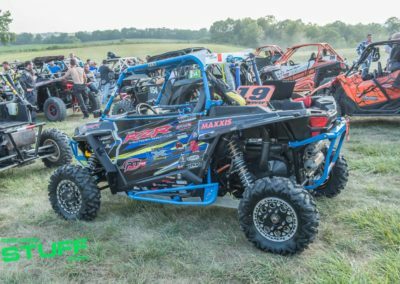 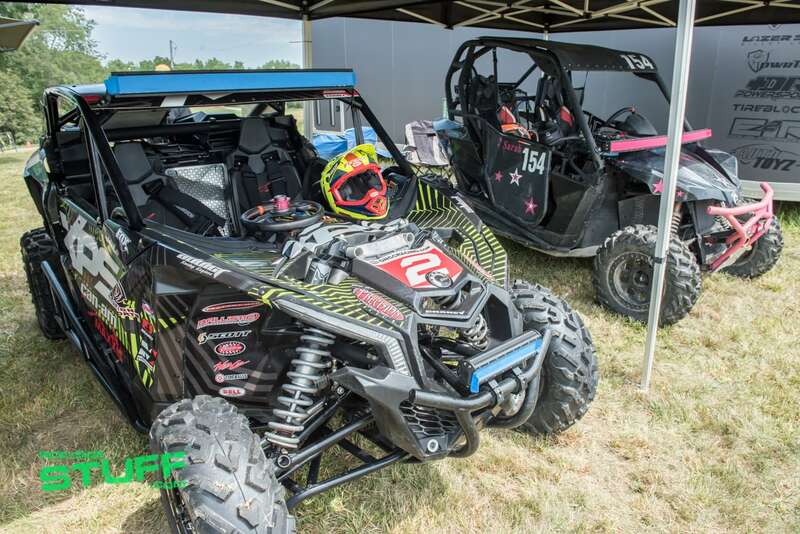 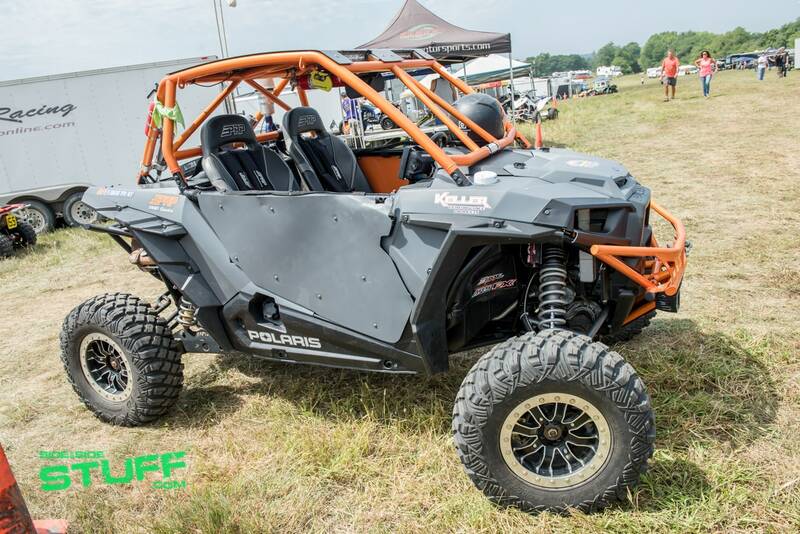 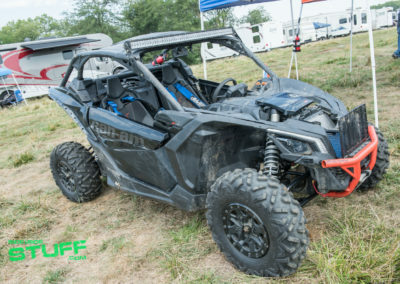 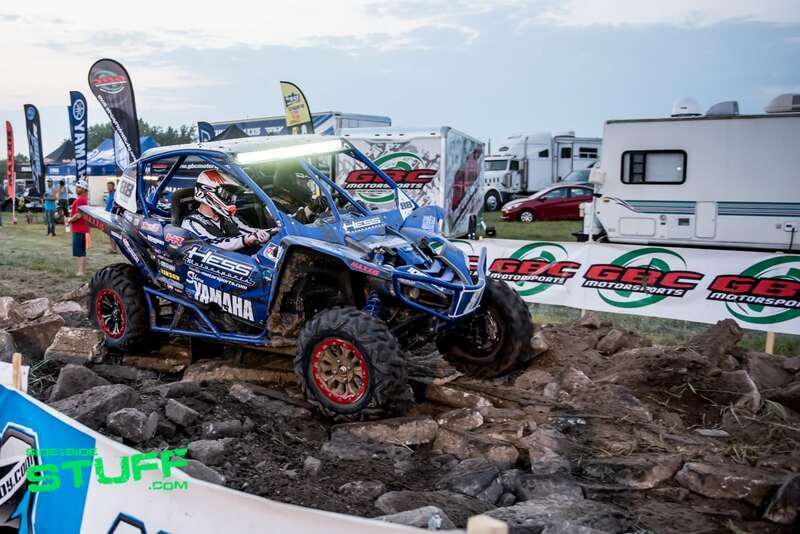 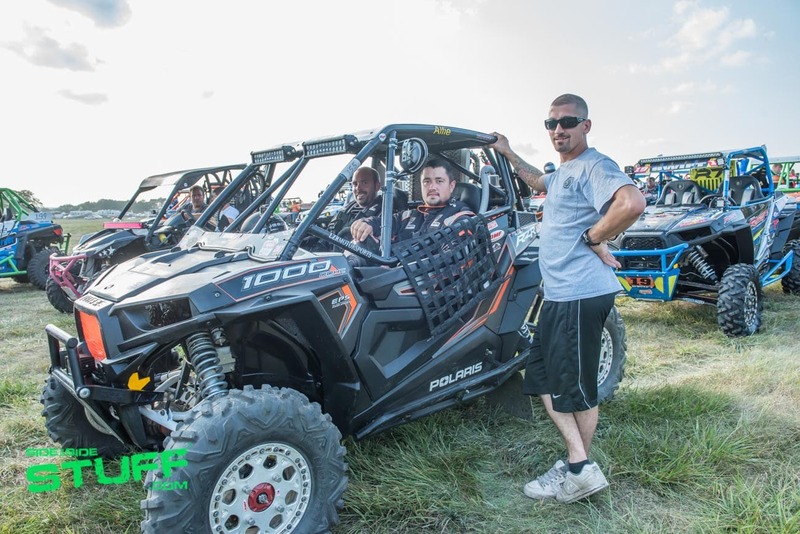 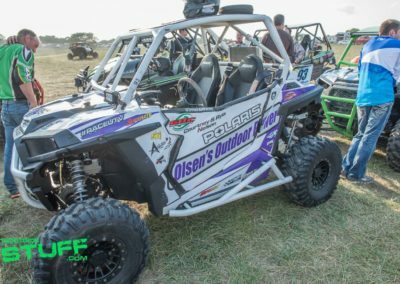 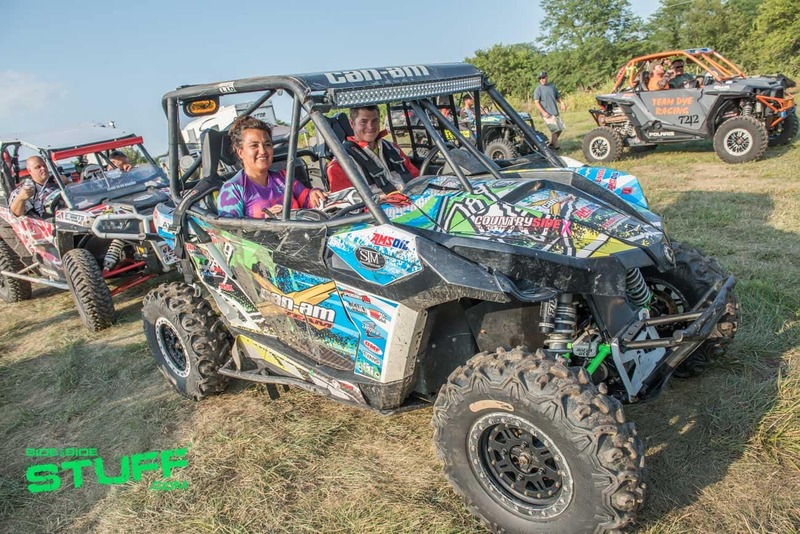 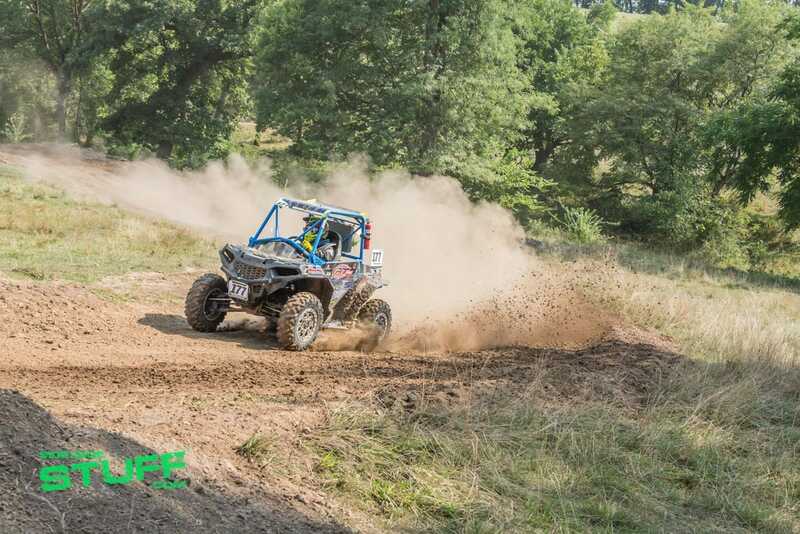 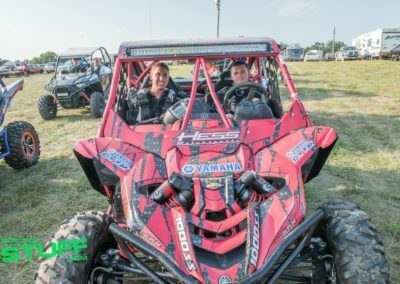 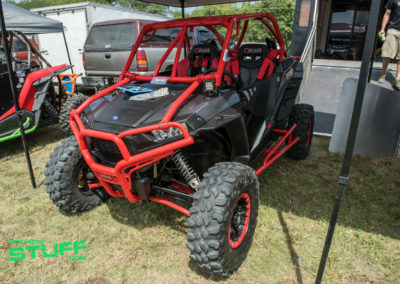 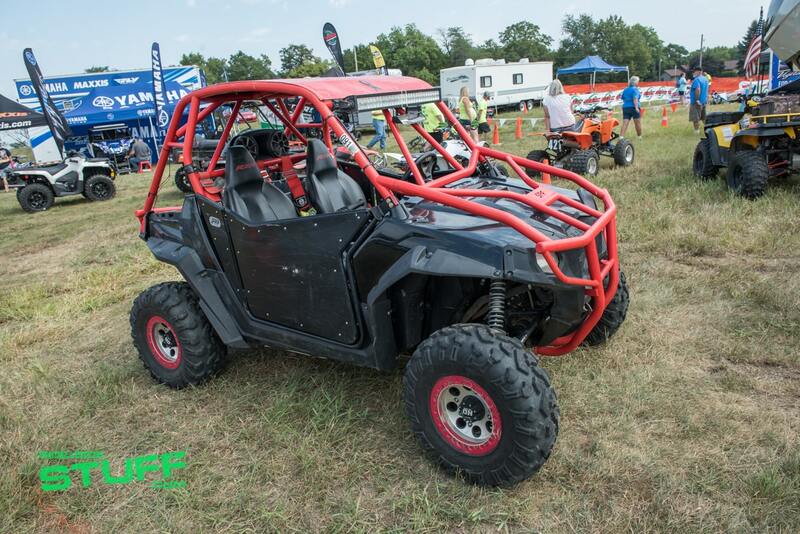 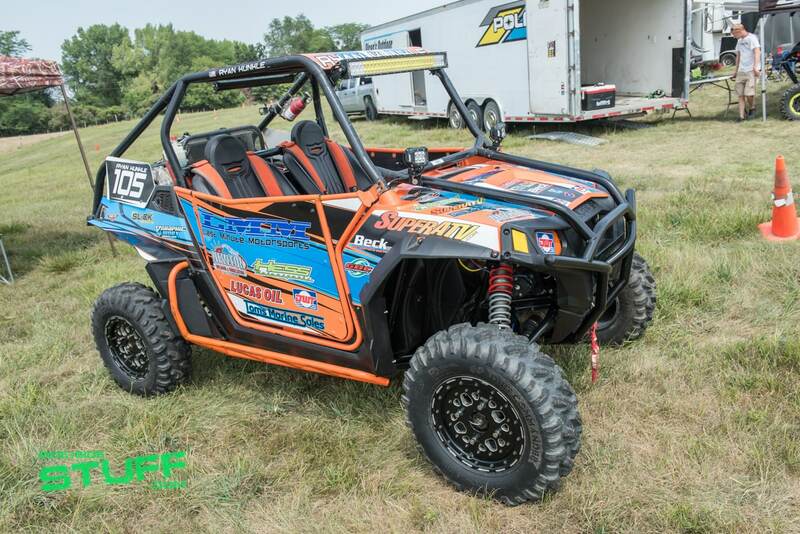 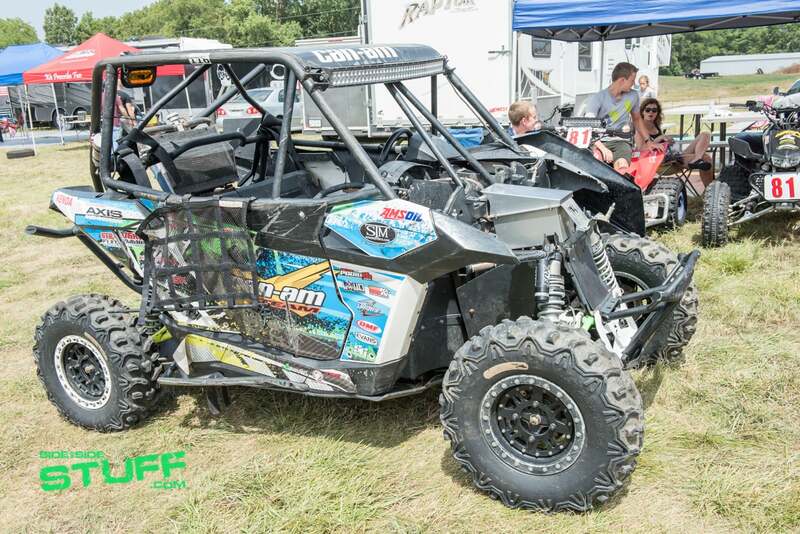 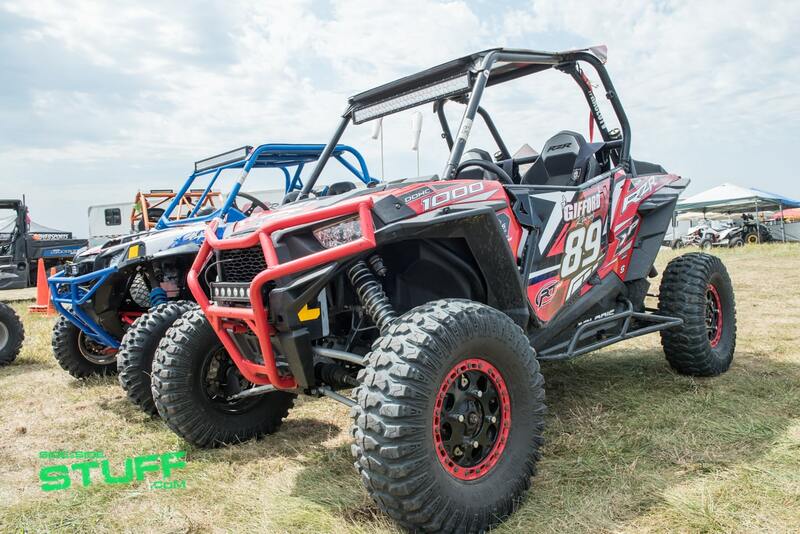 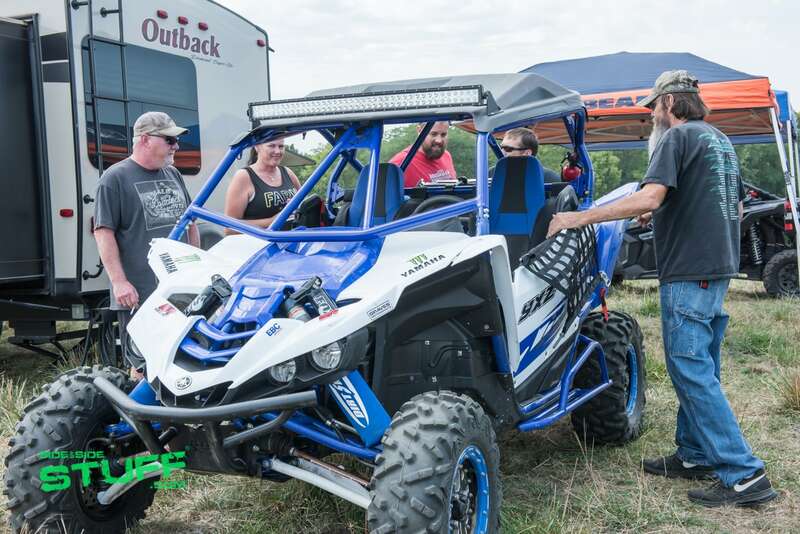 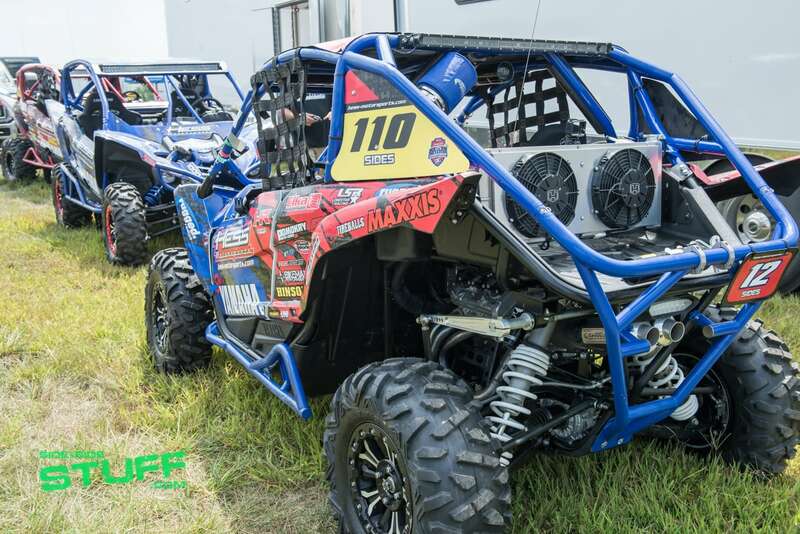 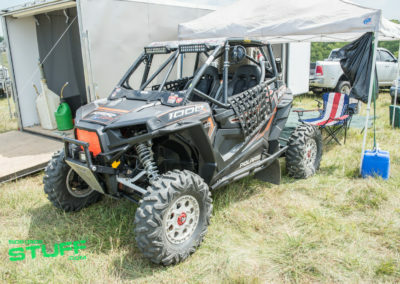 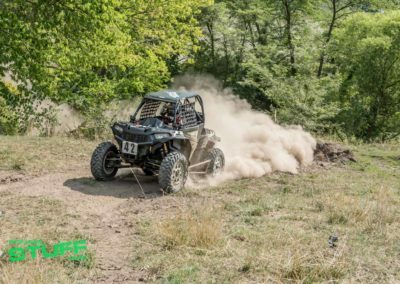 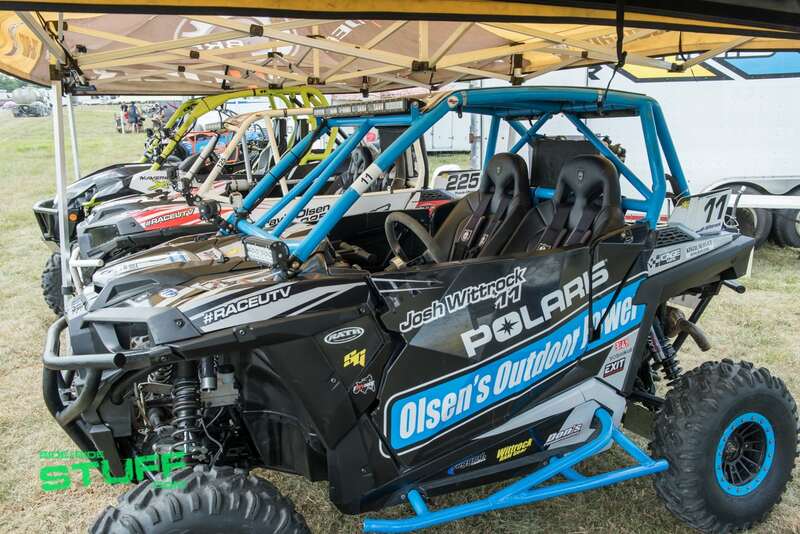 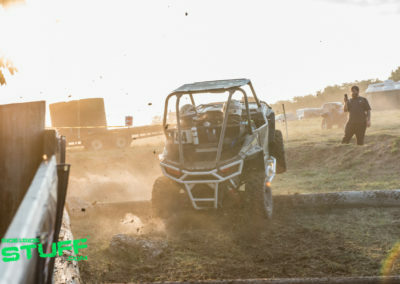 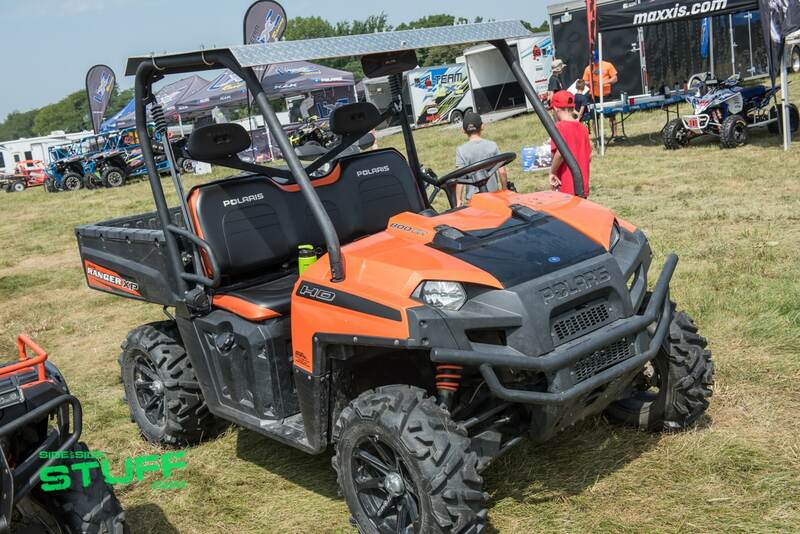 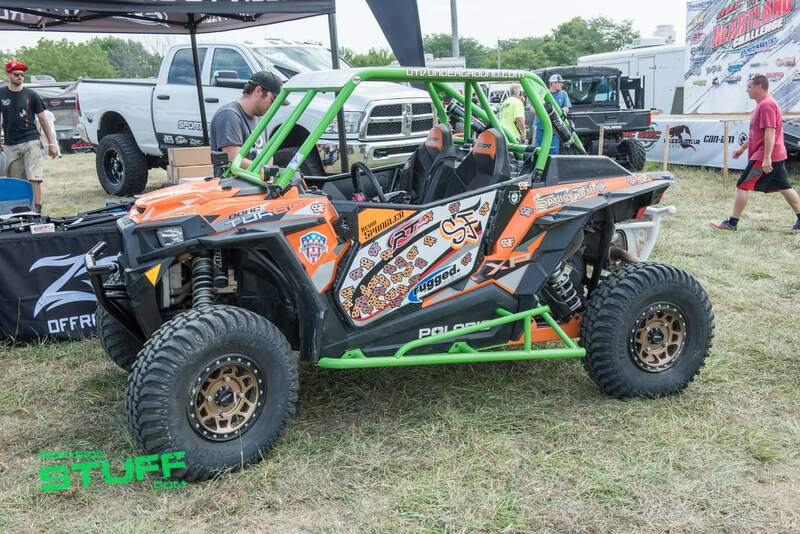 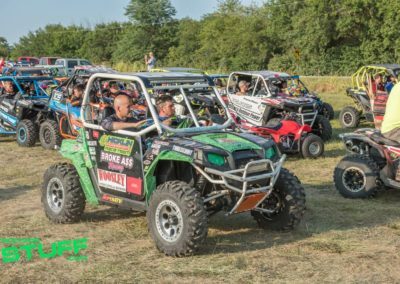 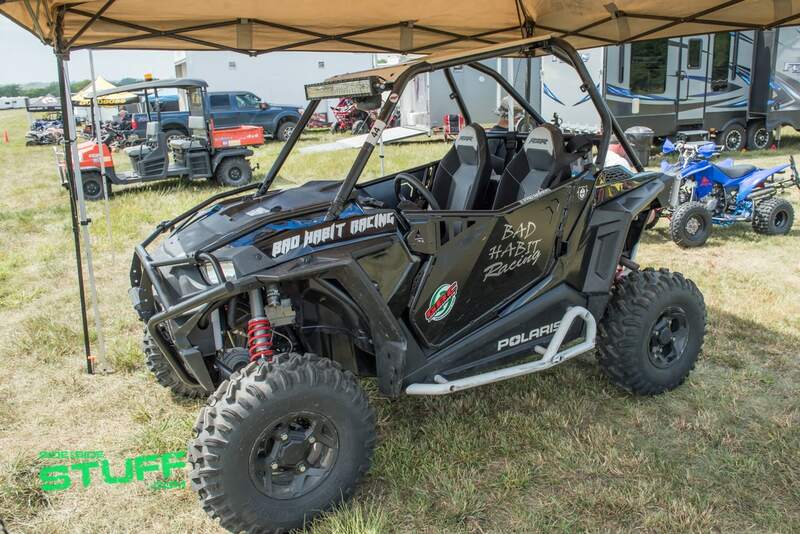 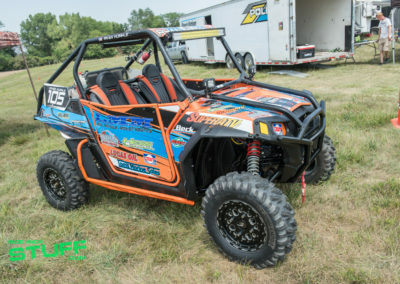 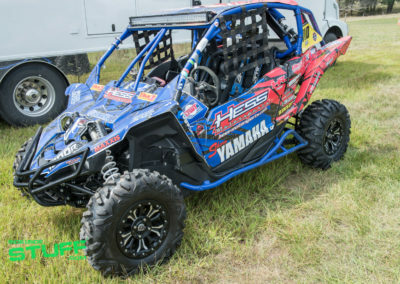 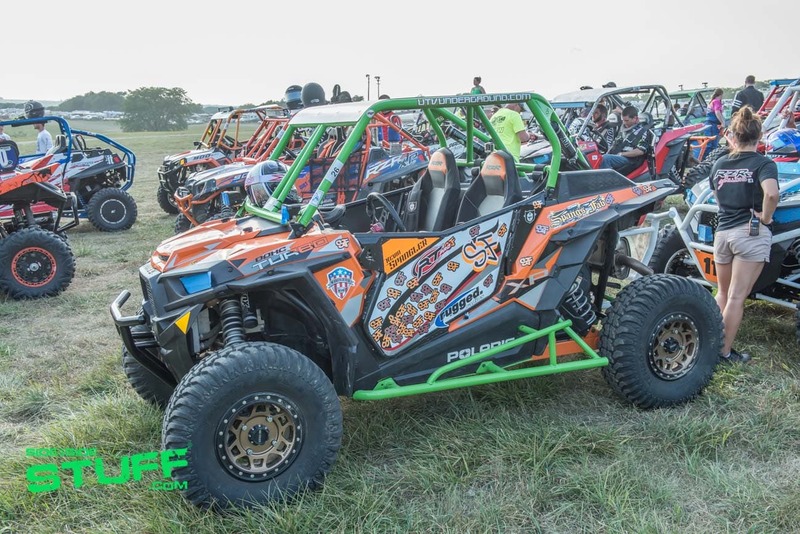 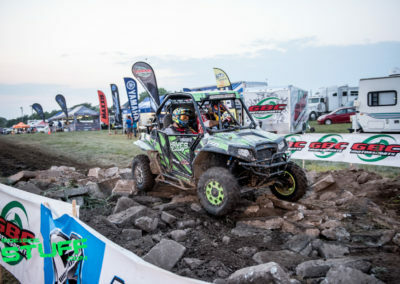 Billed as “The country’s most challenging side by side race in America” the Challenge brings race teams from all over the country to compete in one of 5 classes; that includes teams running the Polaris ACE. 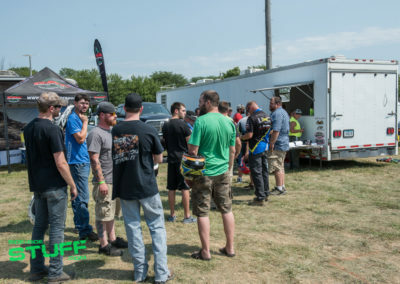 Many of the race teams showed up Thursday to beat the crowd of racers to the tech inspection station, all racers must have their machine inspected prior to the start of the race. 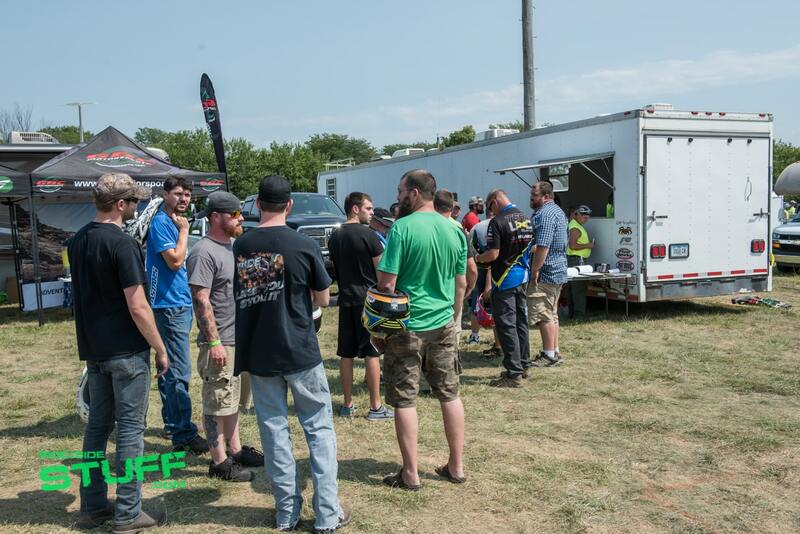 Those who showed up Thursday were welcome to camp wherever they chose as there was ample room for camping. 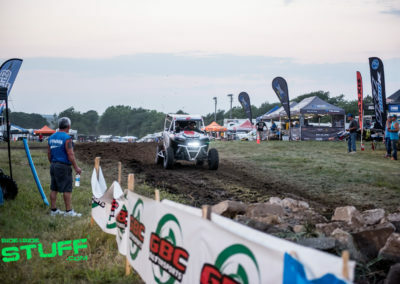 GBC Motorsports was serving up BBQ on Friday, there was also a food truck on hand selling different kinds of food. 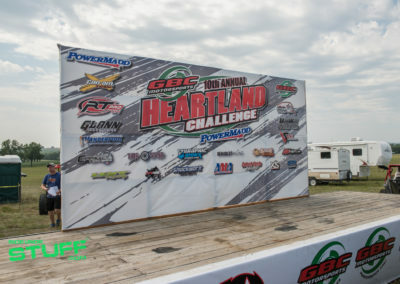 The Heartland Challenge race course had all the elements to make for an exciting race for both racers and spectators alike. 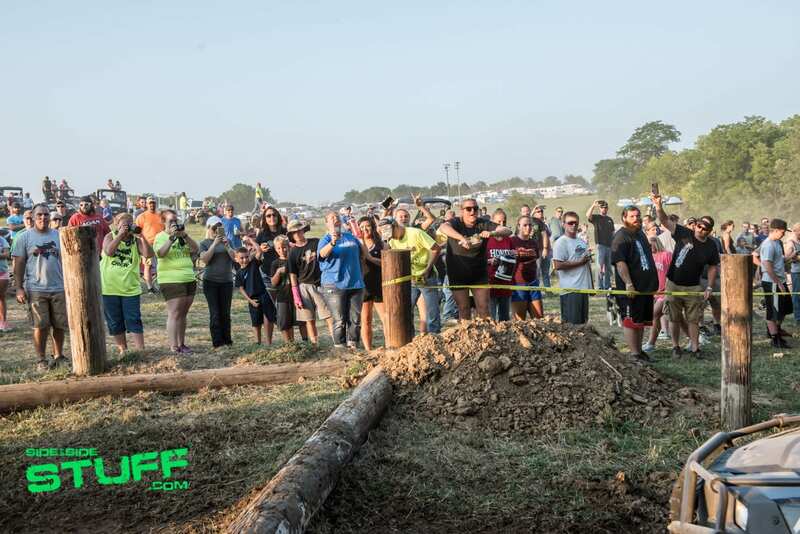 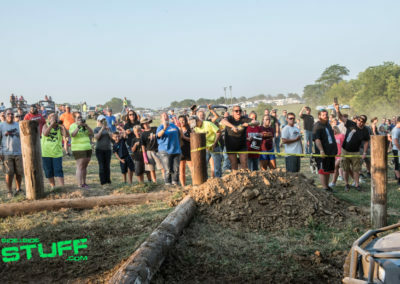 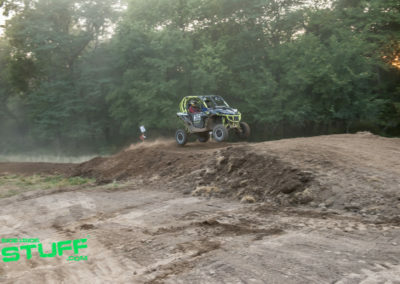 There was everything from fast open grass track and tight woods trails with elevations changes to a motocross section as well as an obstacle section that included broken concrete chunks, telephone poles and large tires. 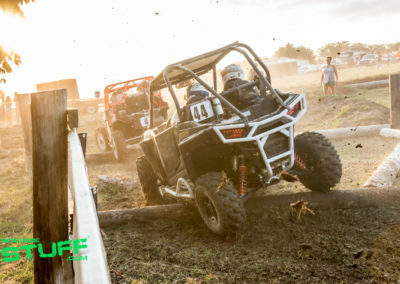 The difficulty of the obstacles would prove to be more challenging than some race teams expected. 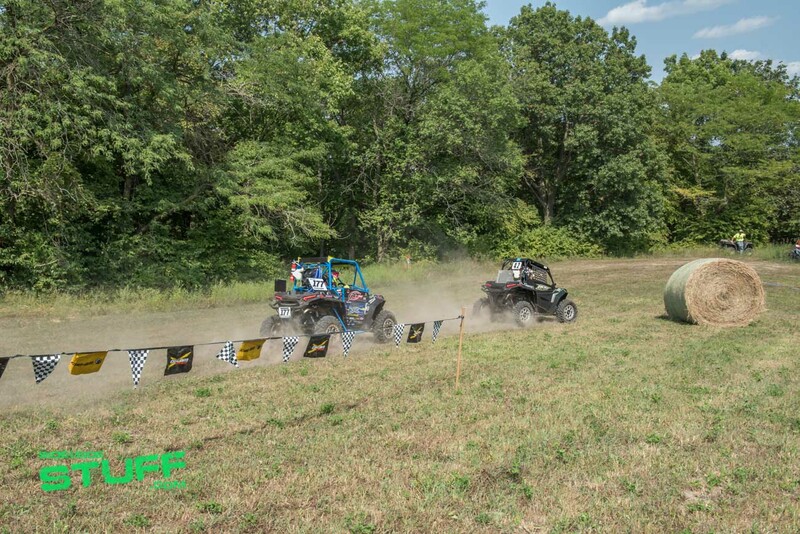 The action started off Friday at 3pm with the running of the ACE class. 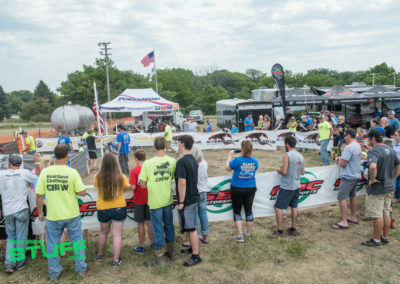 Seven ACE race teams went head to head for 1.5 hours on the 6 mile plus long course. 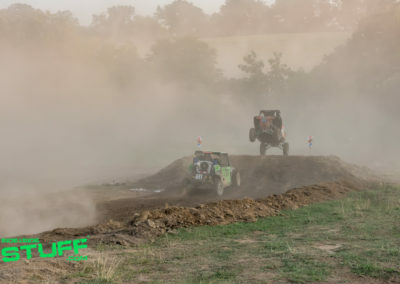 The ACE racers were the first to tackle the course and found the track to be very dry and dusty in many of the sections keeping visibility low at times. 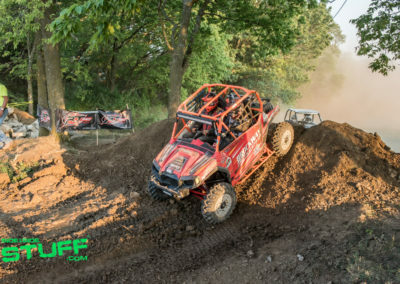 The side by side main event started as the sun was starting to set Friday evening at 7 pm and kept racers moving a quick pace for 4 hours. 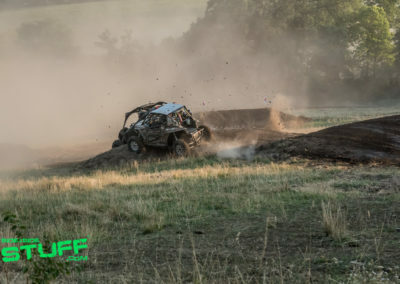 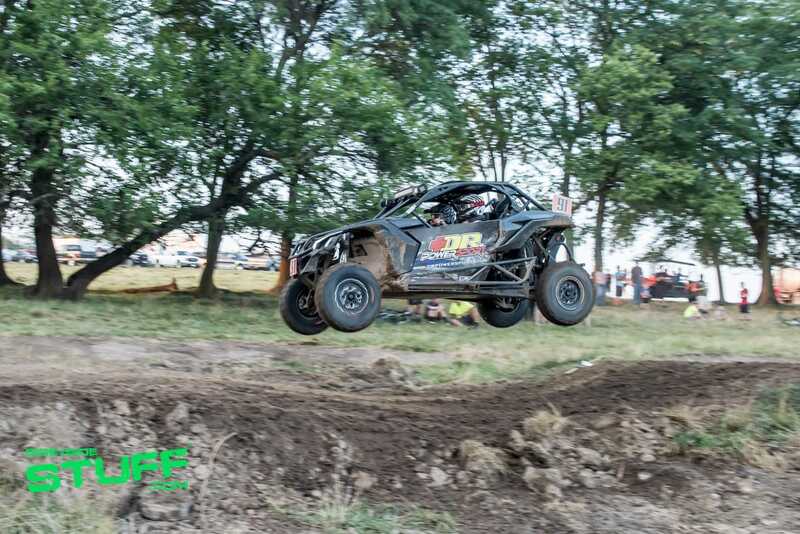 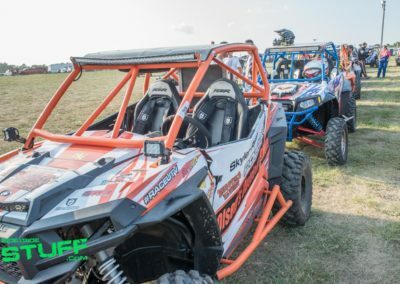 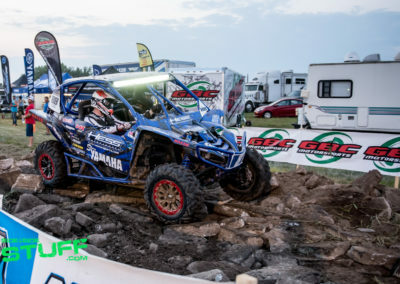 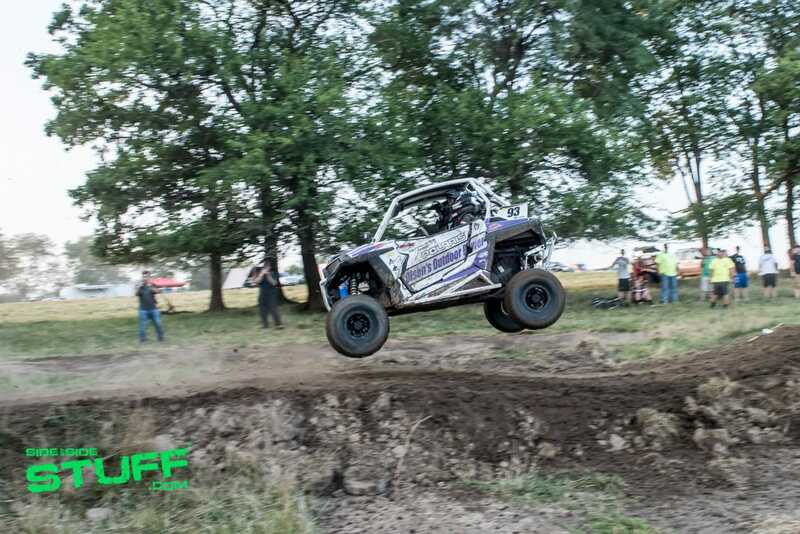 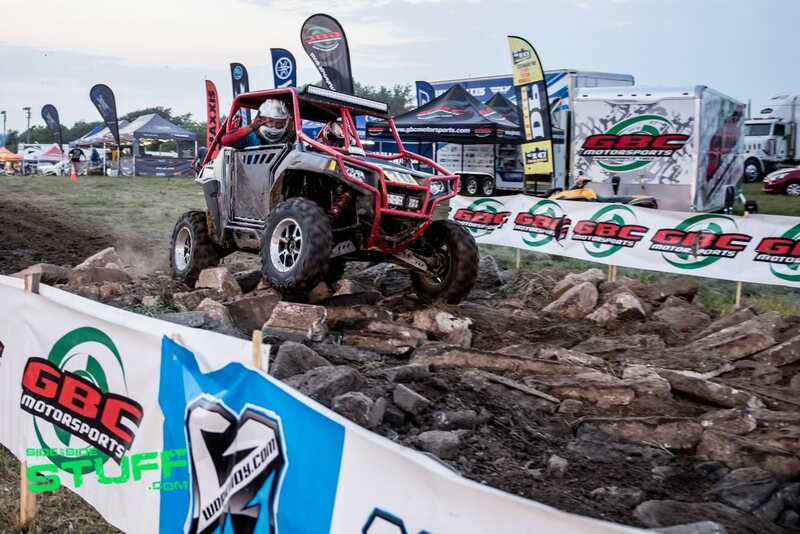 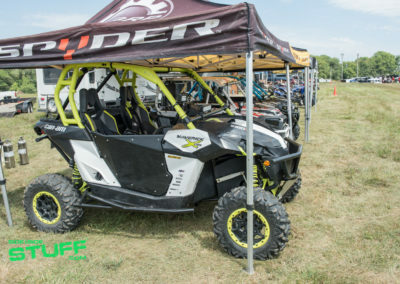 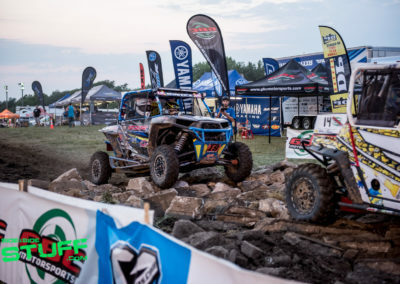 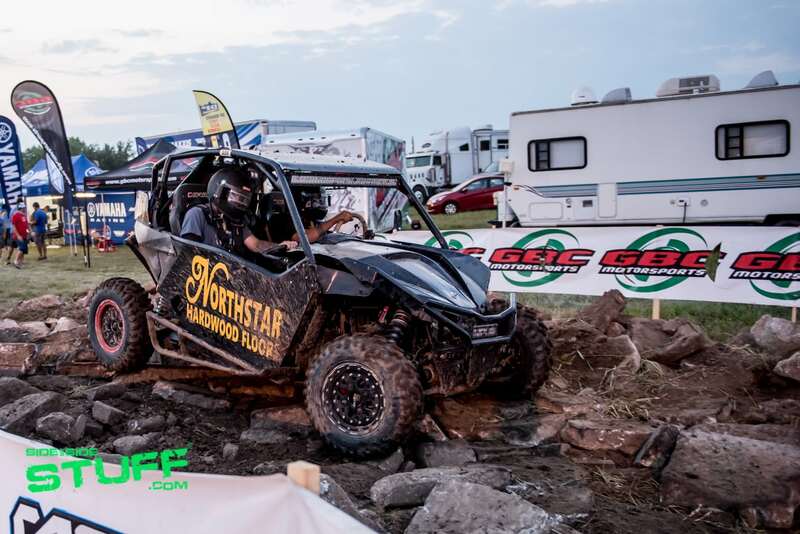 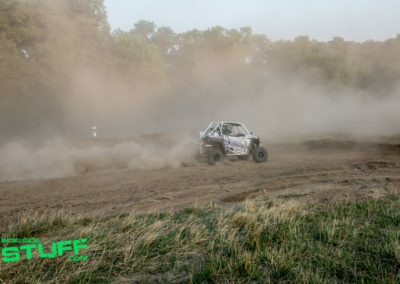 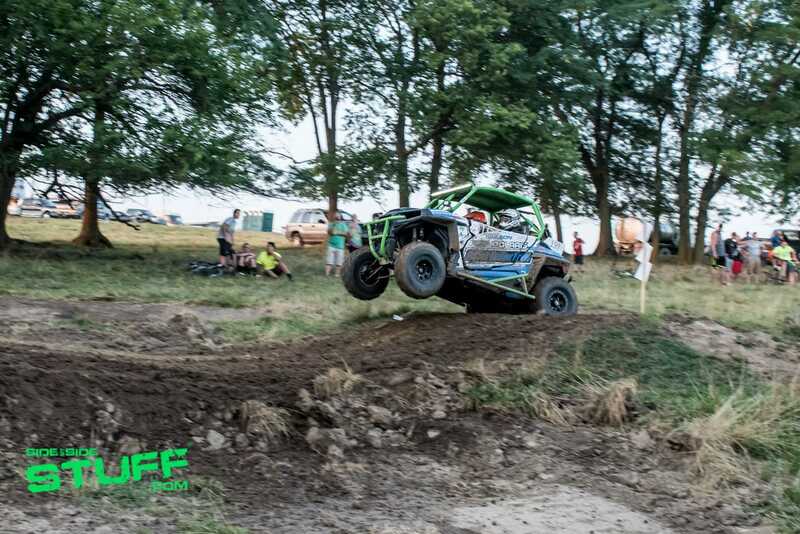 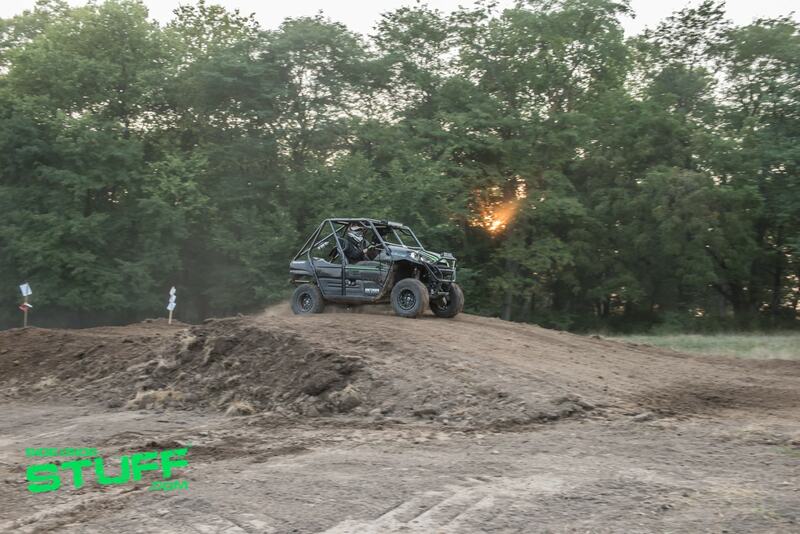 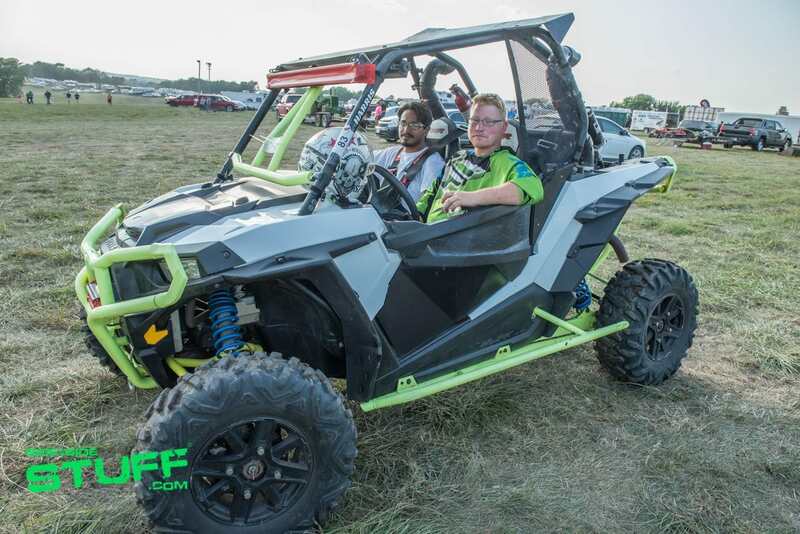 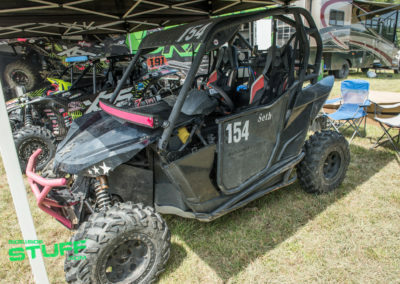 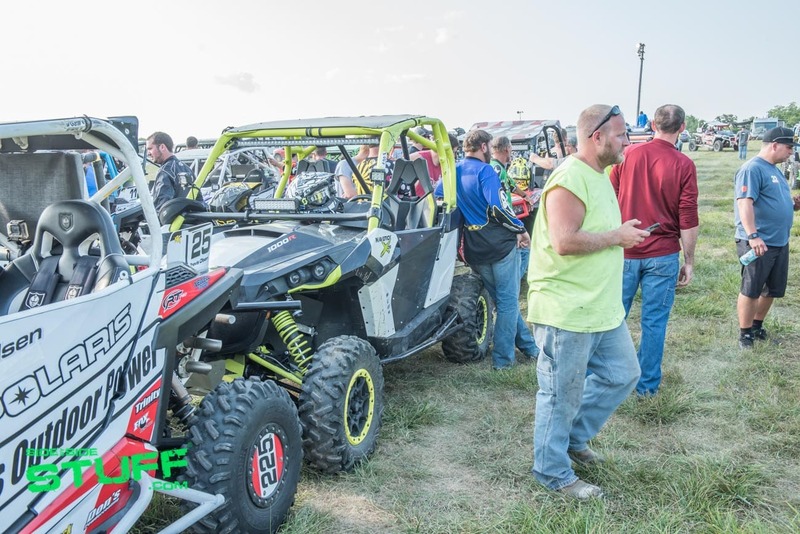 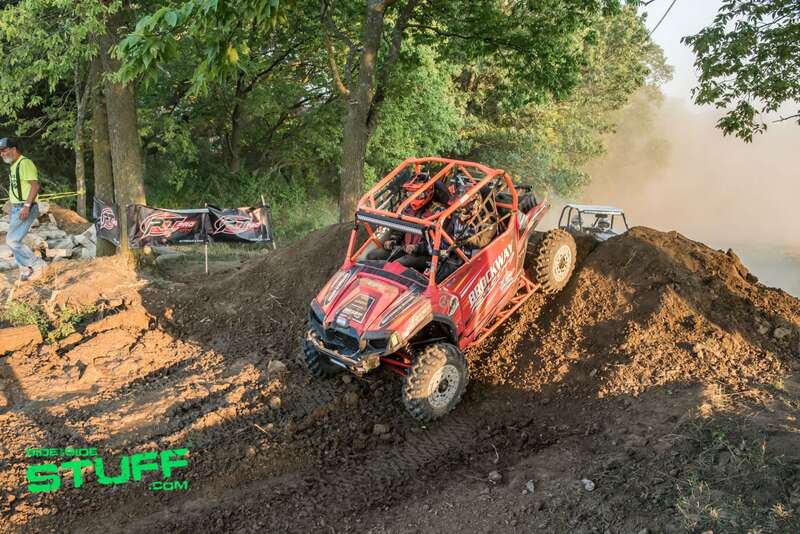 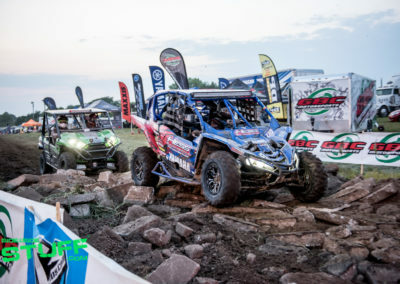 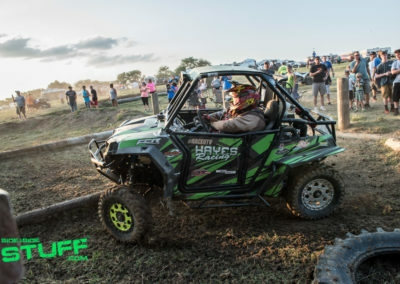 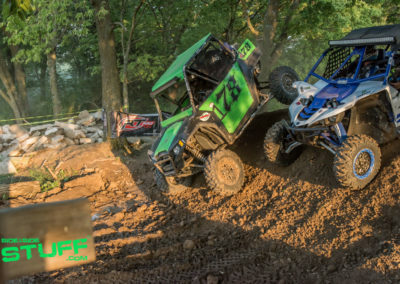 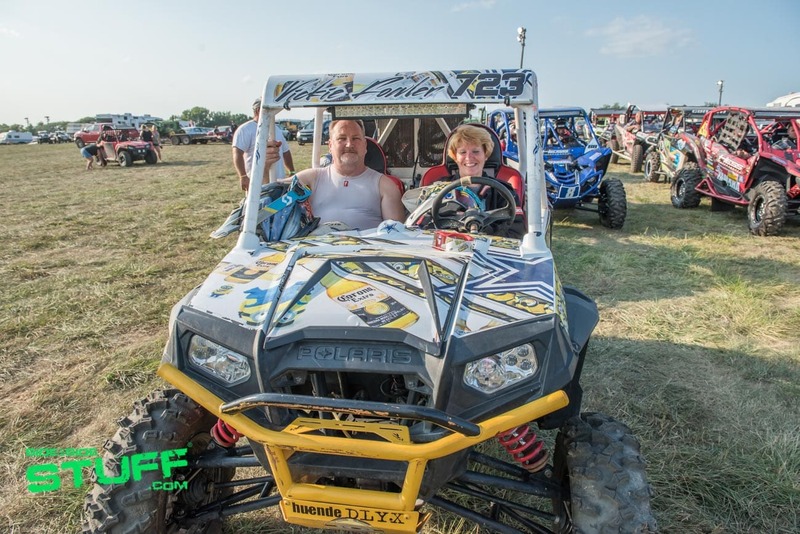 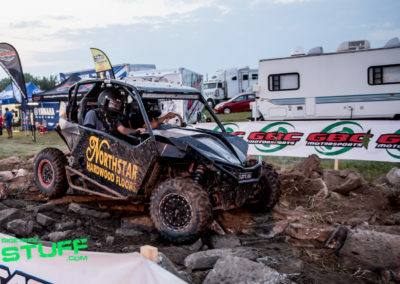 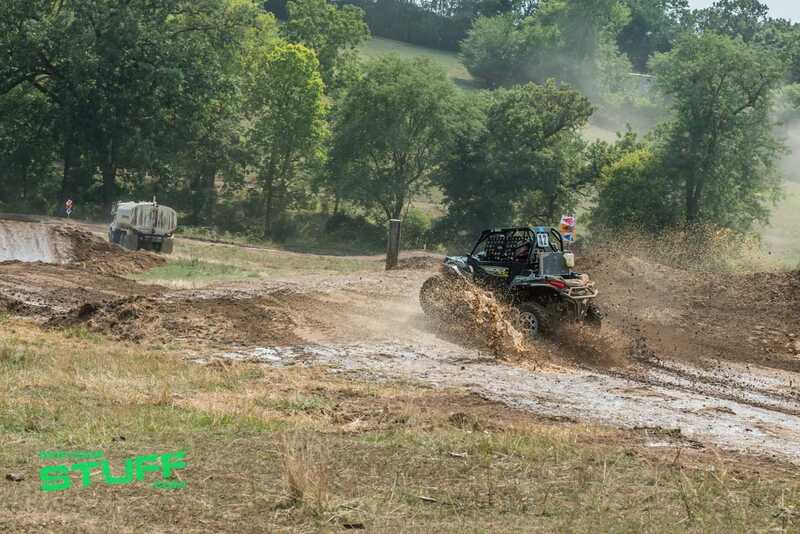 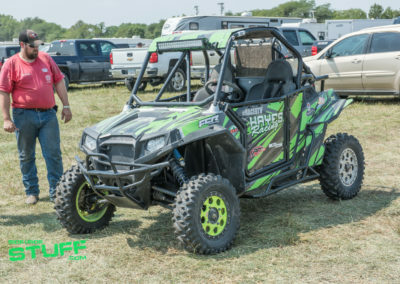 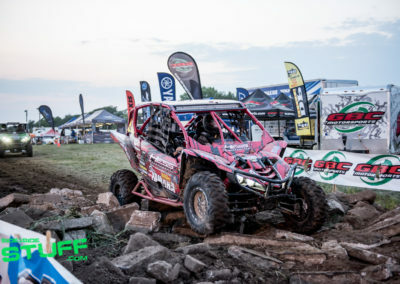 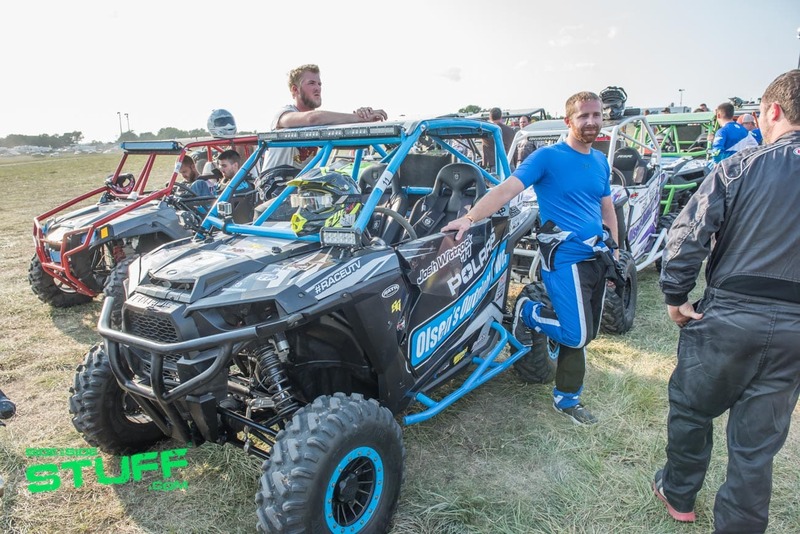 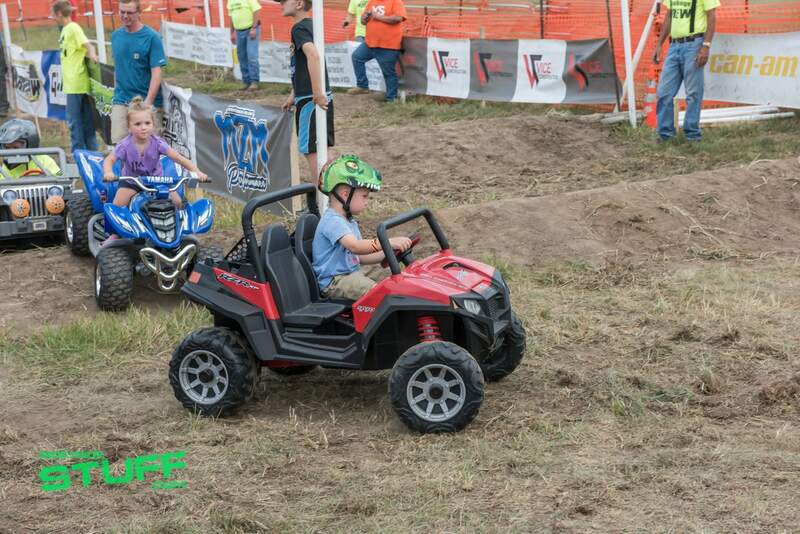 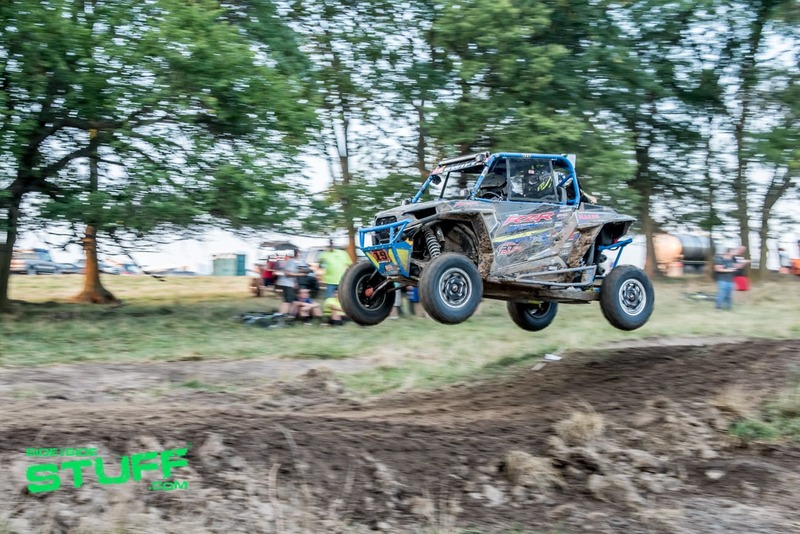 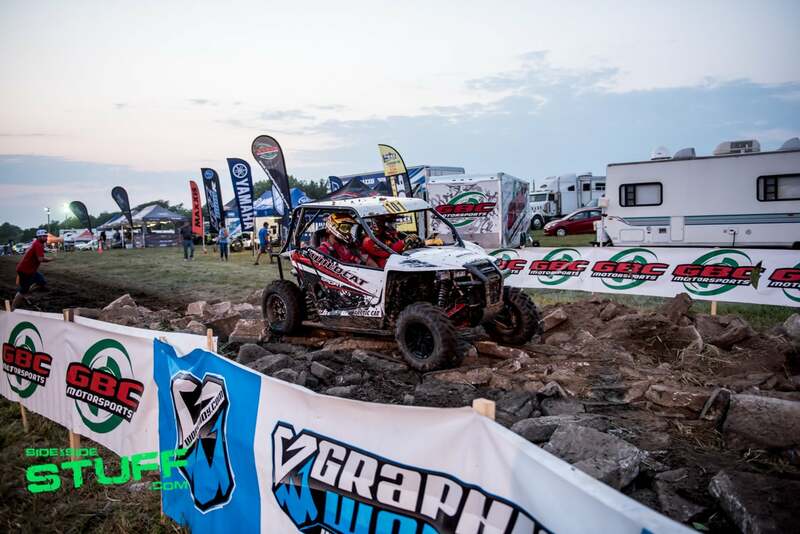 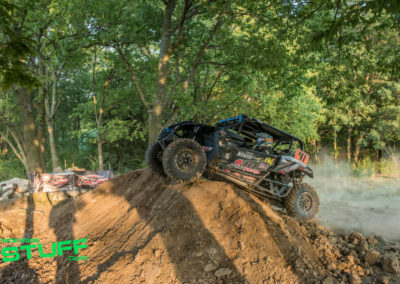 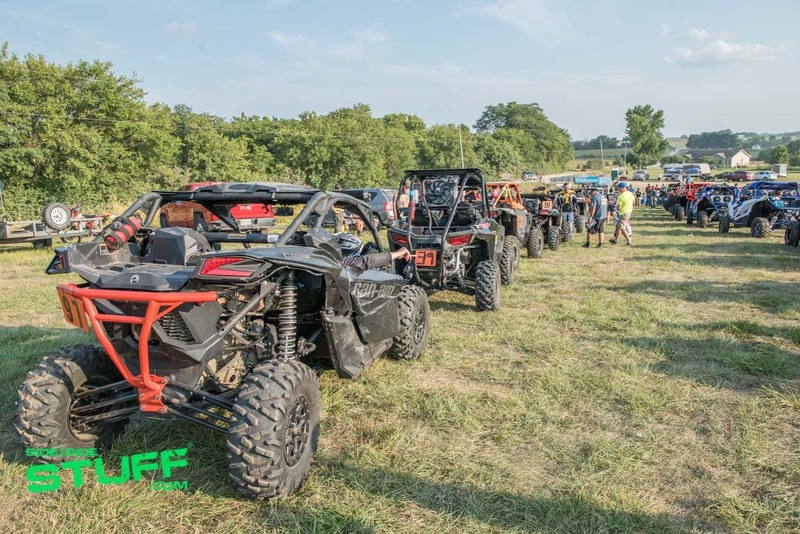 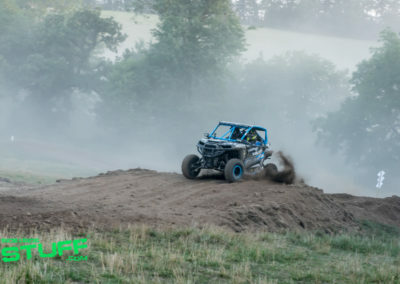 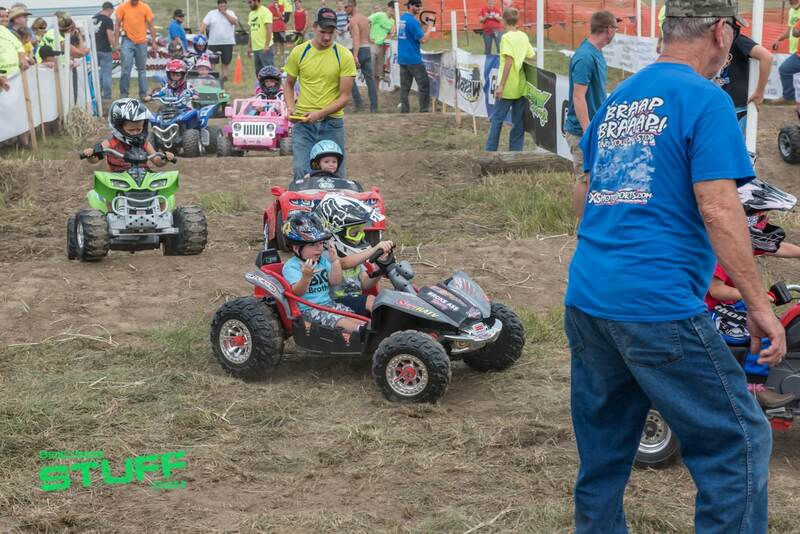 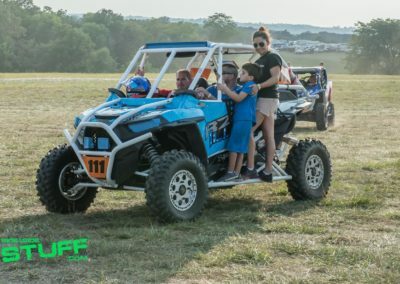 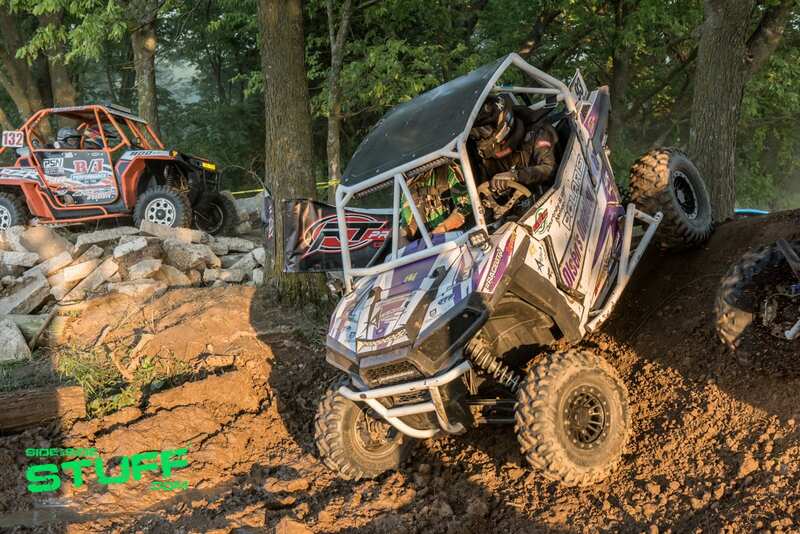 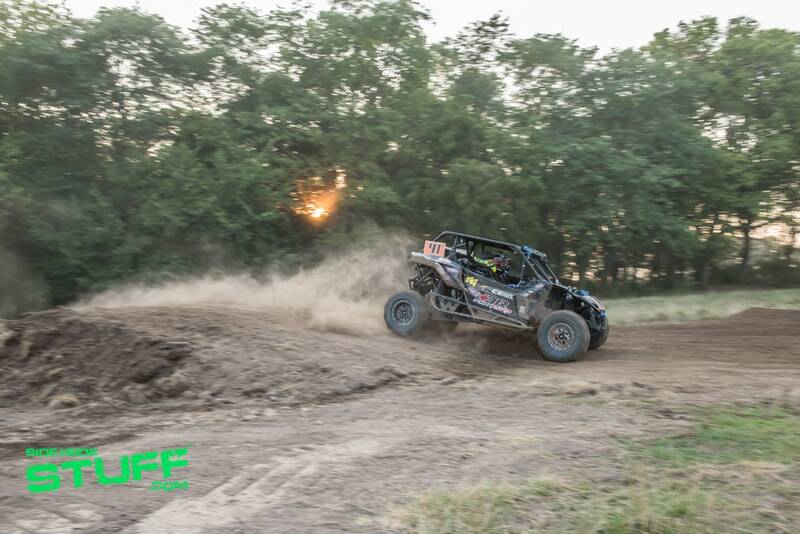 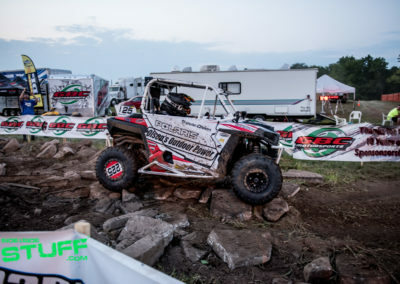 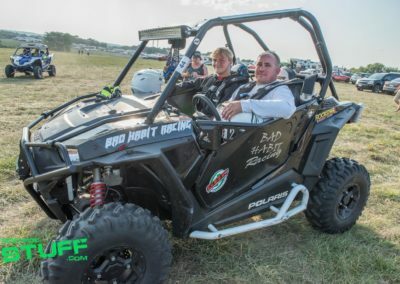 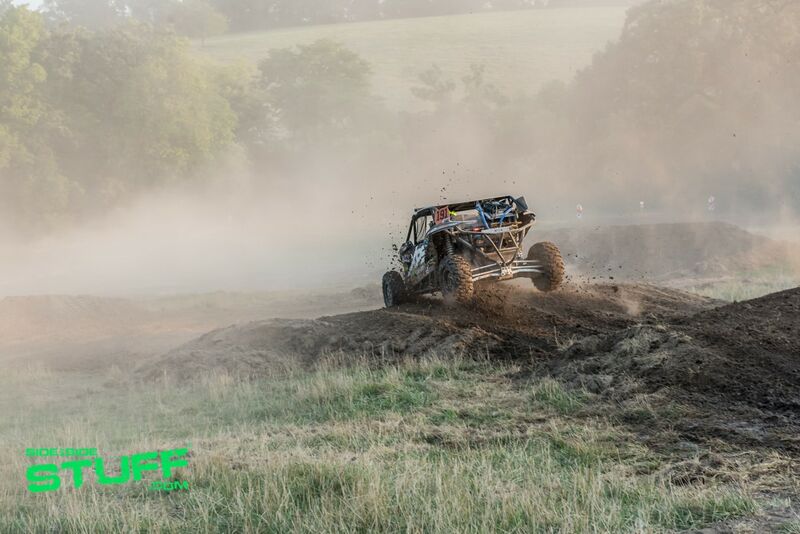 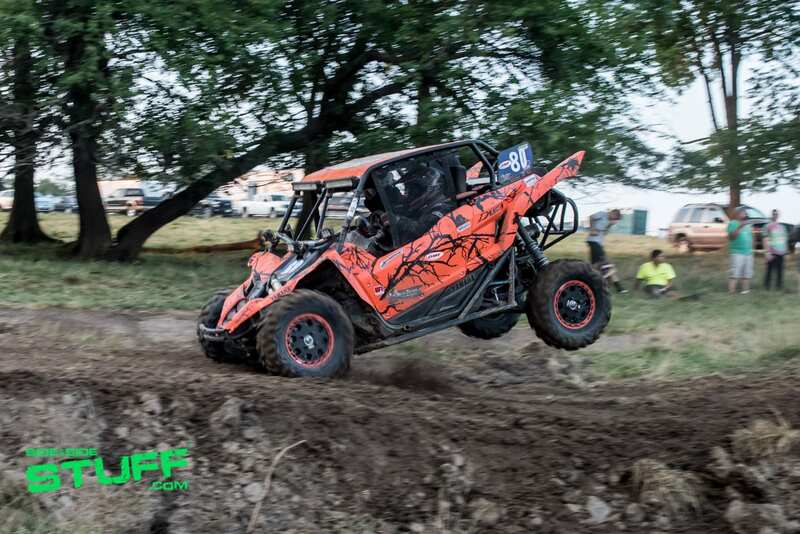 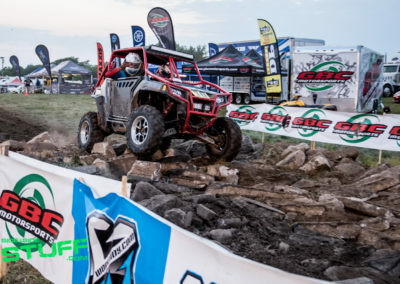 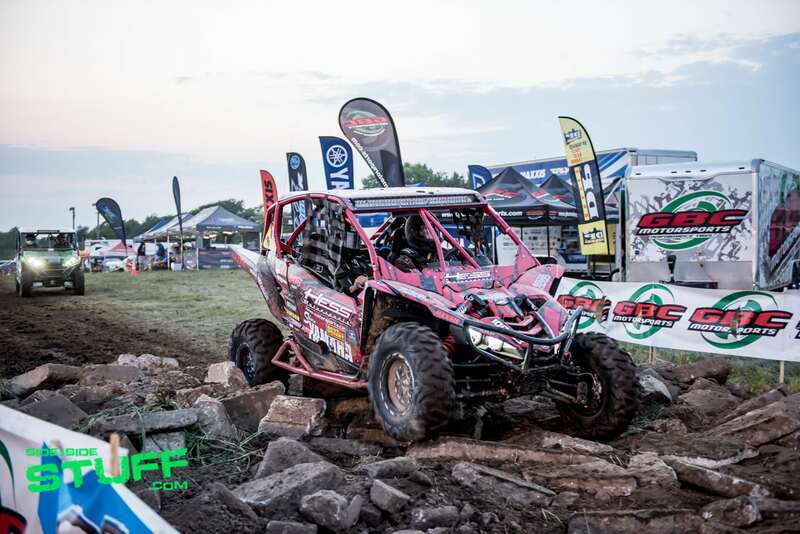 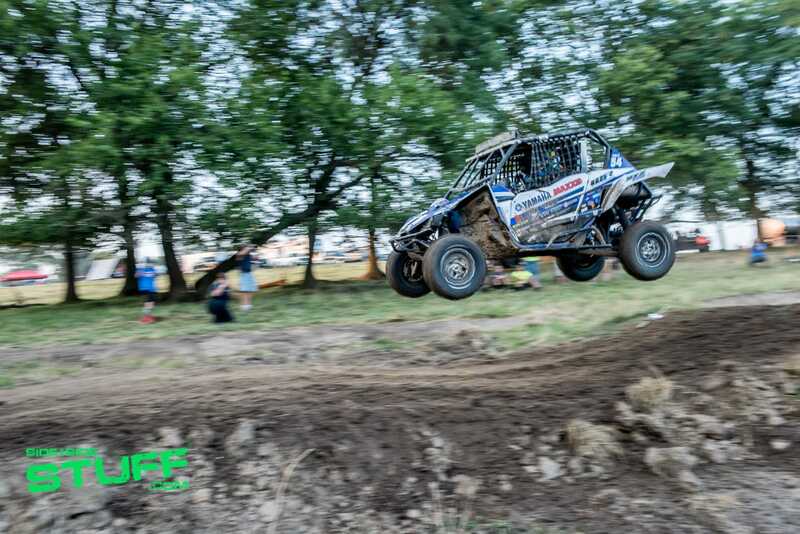 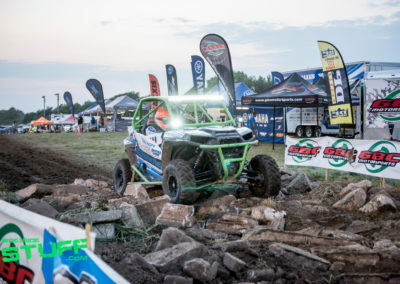 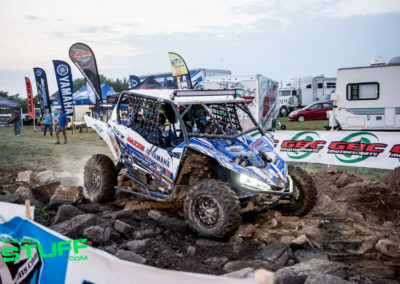 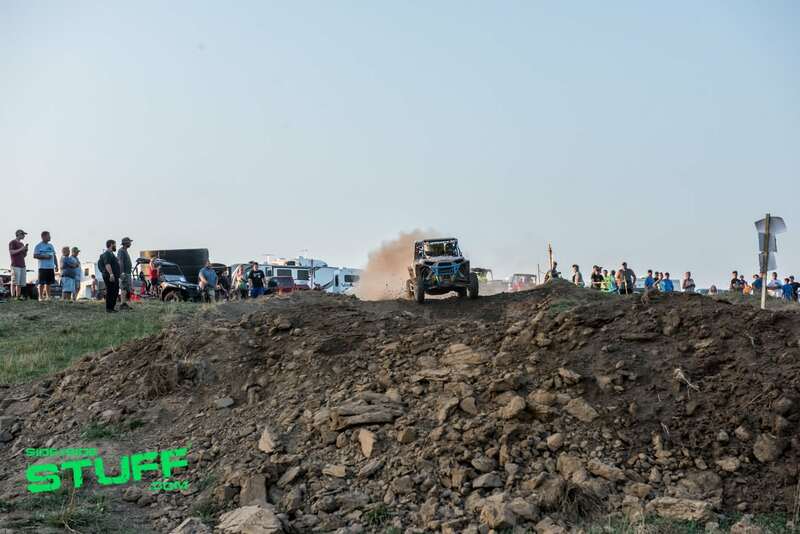 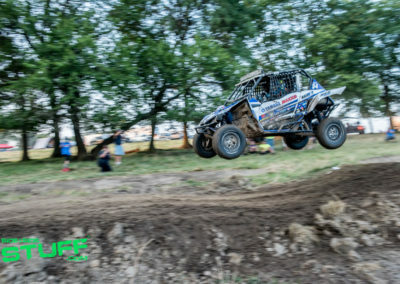 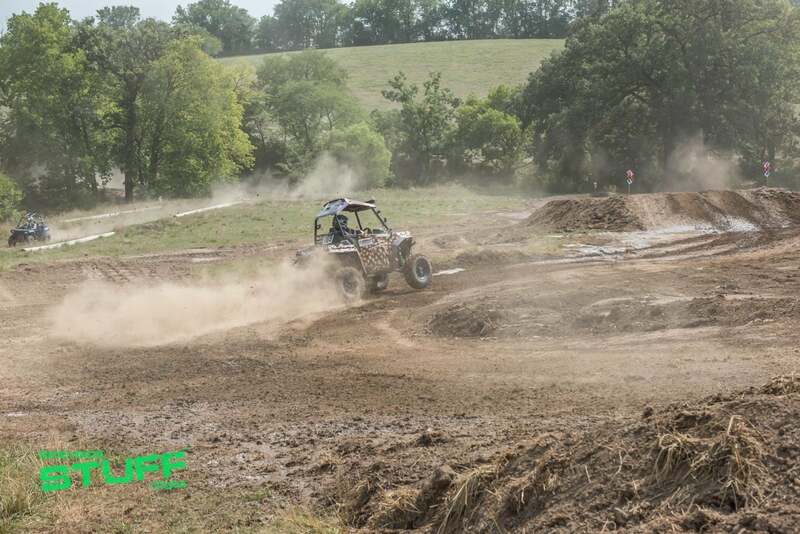 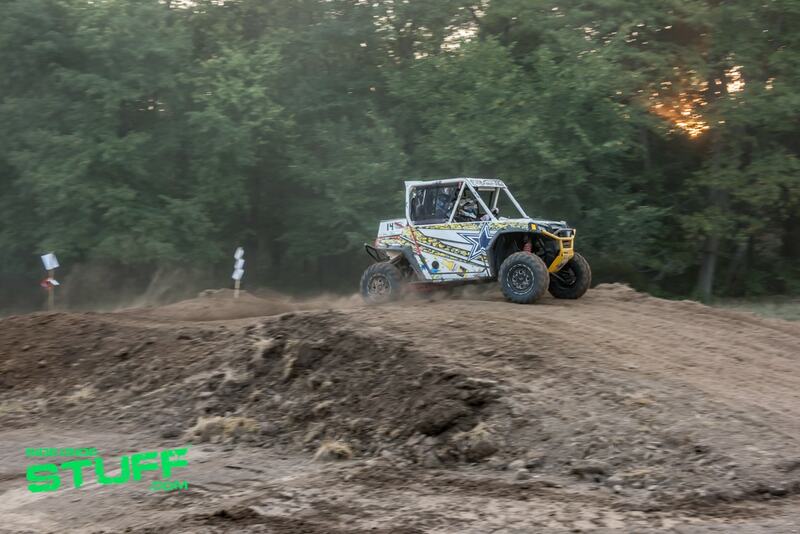 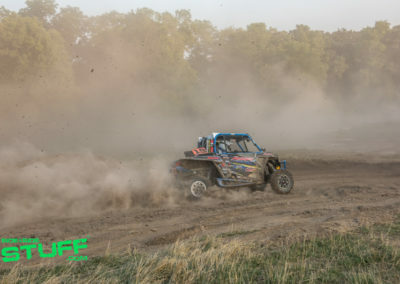 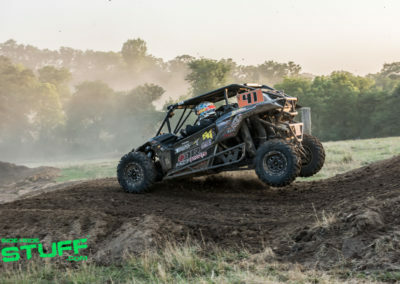 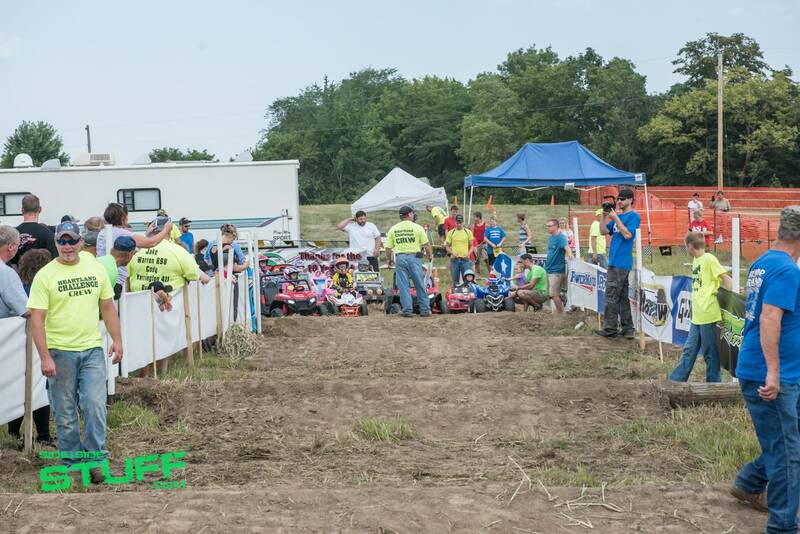 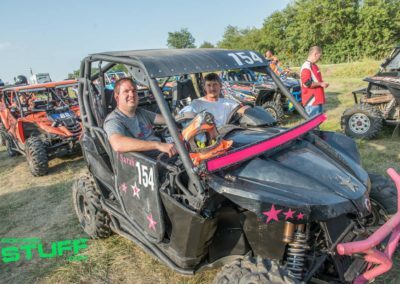 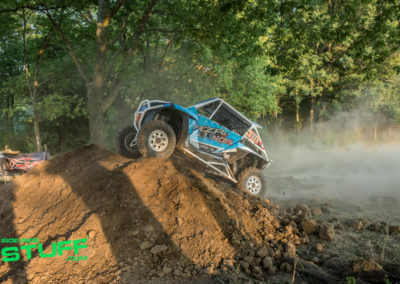 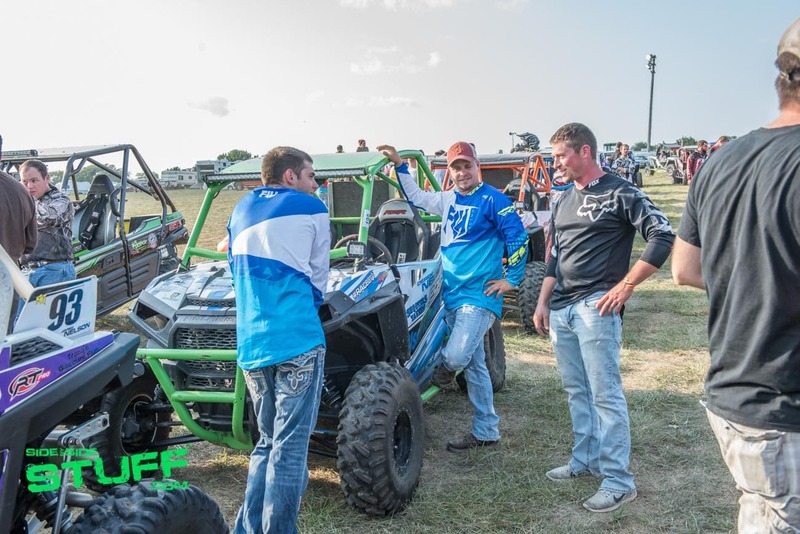 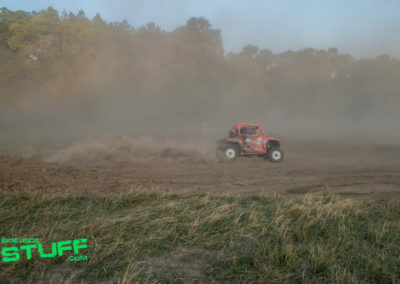 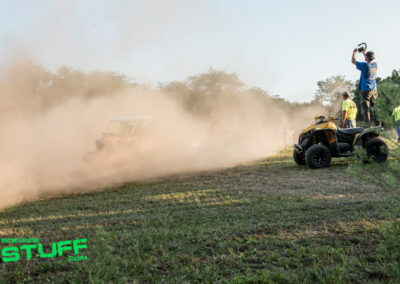 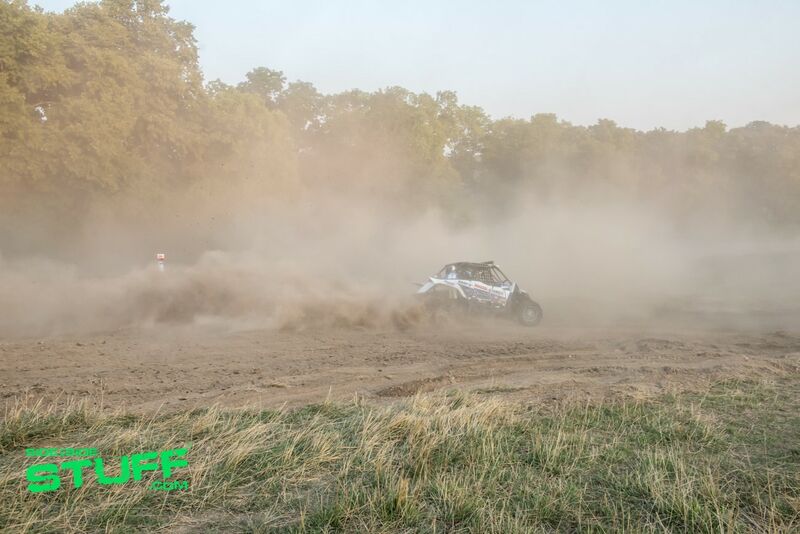 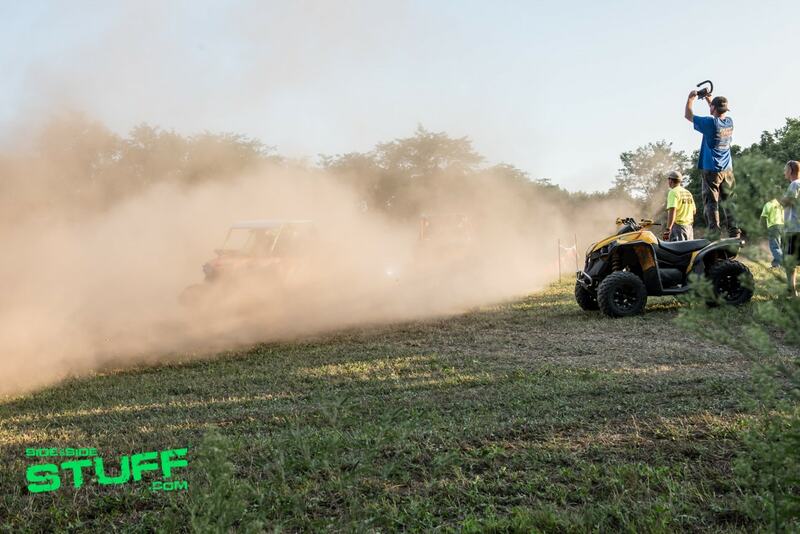 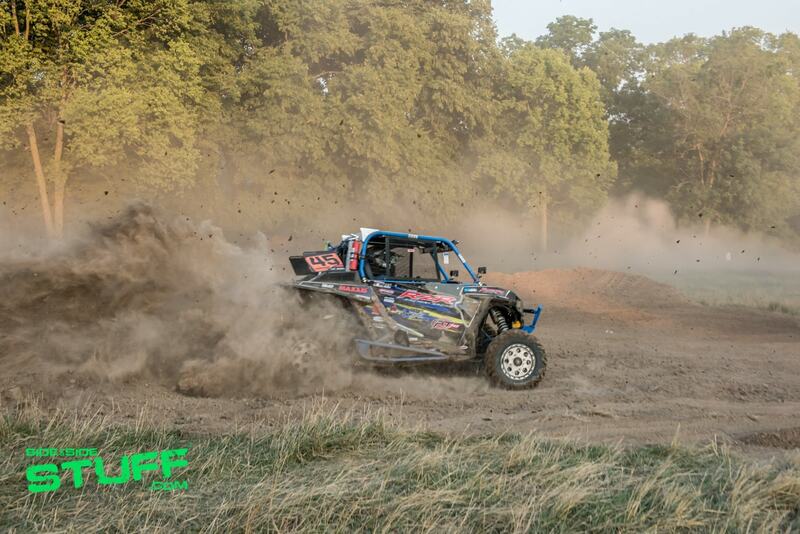 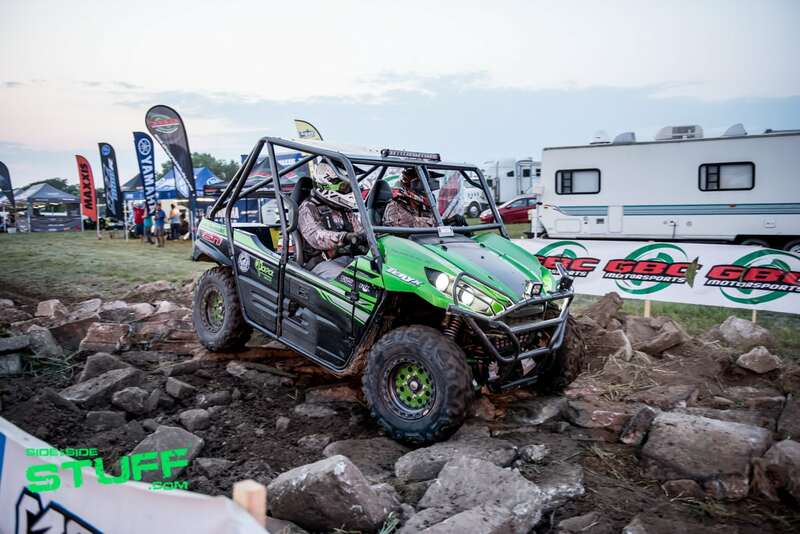 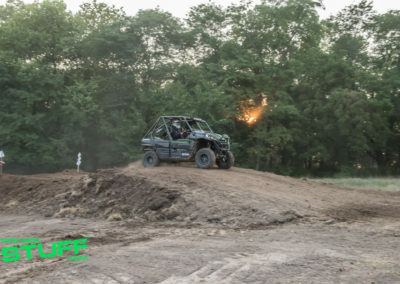 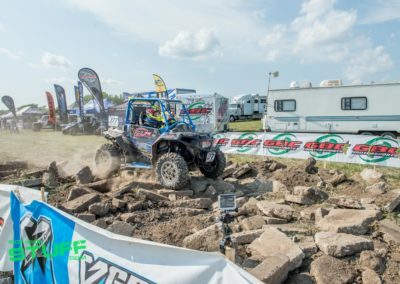 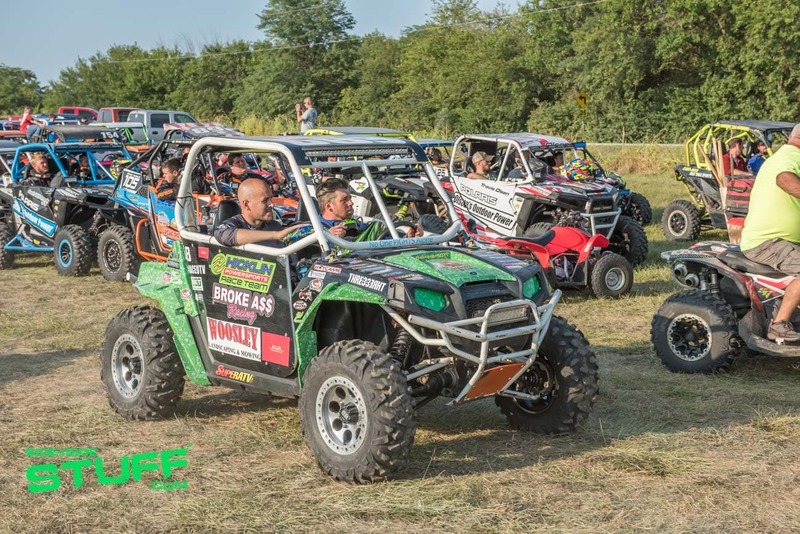 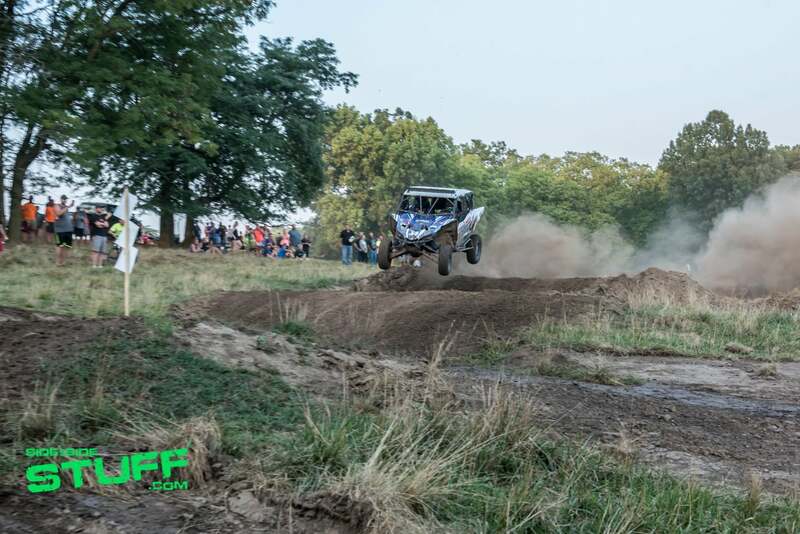 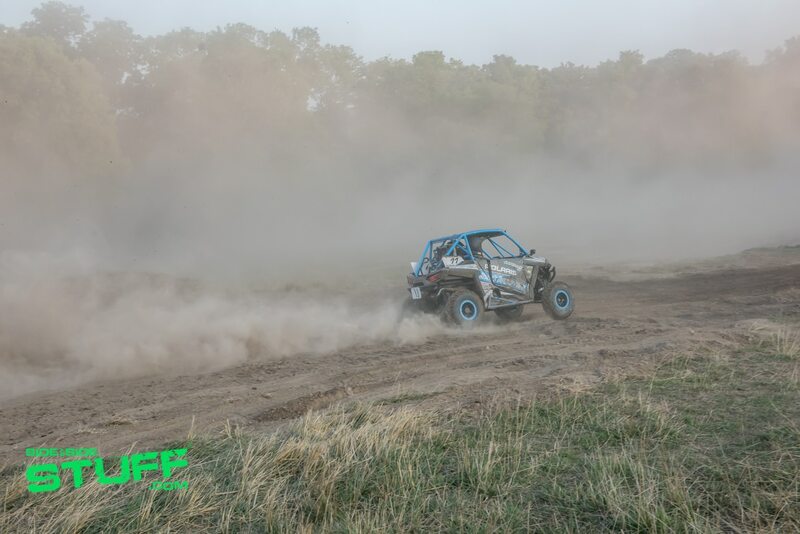 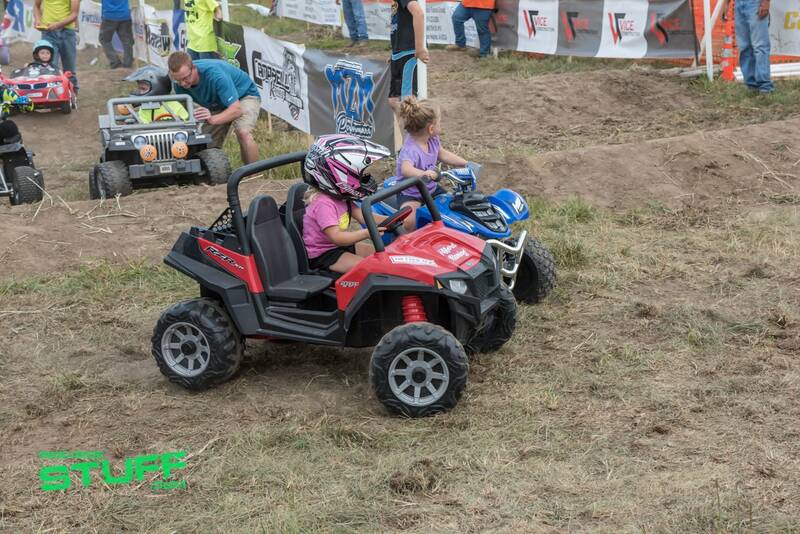 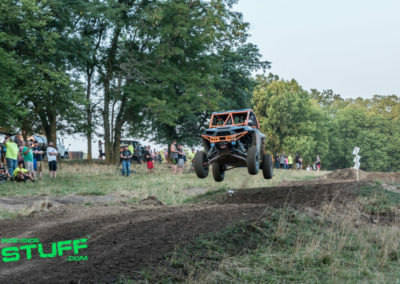 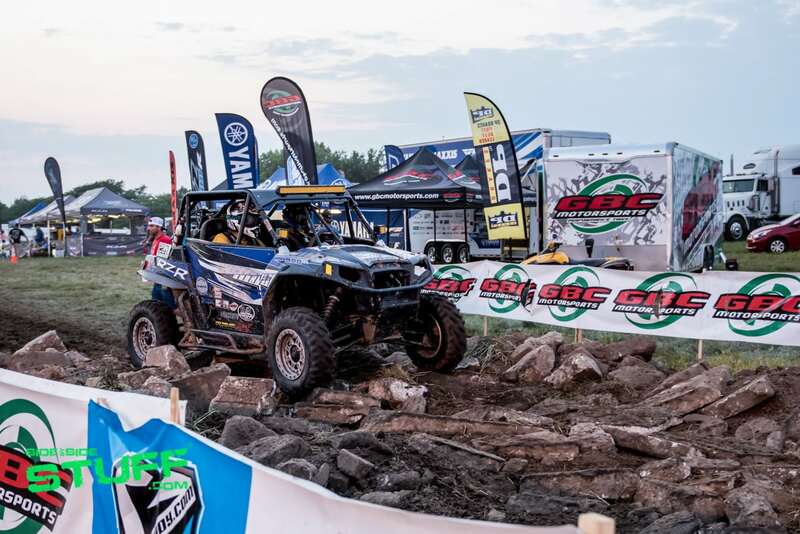 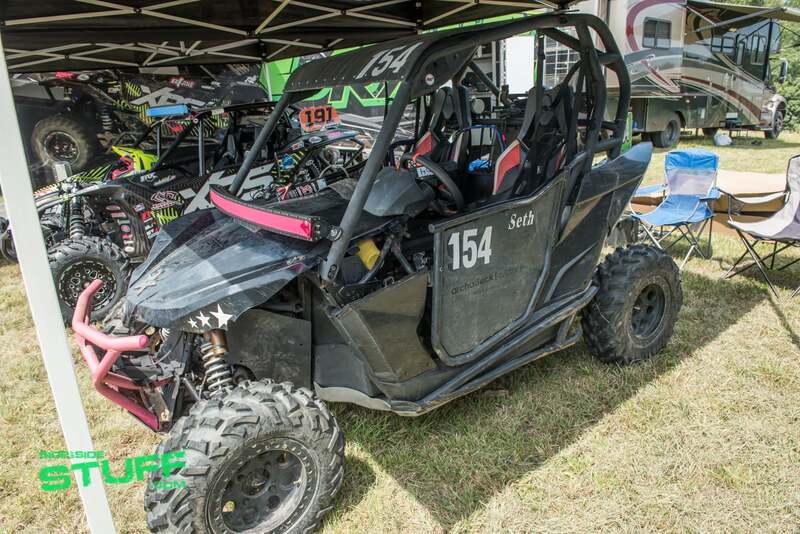 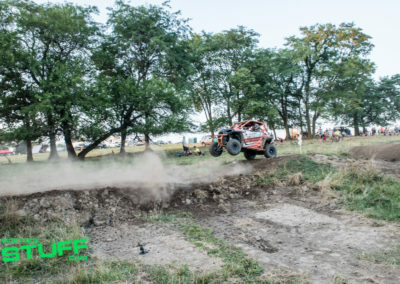 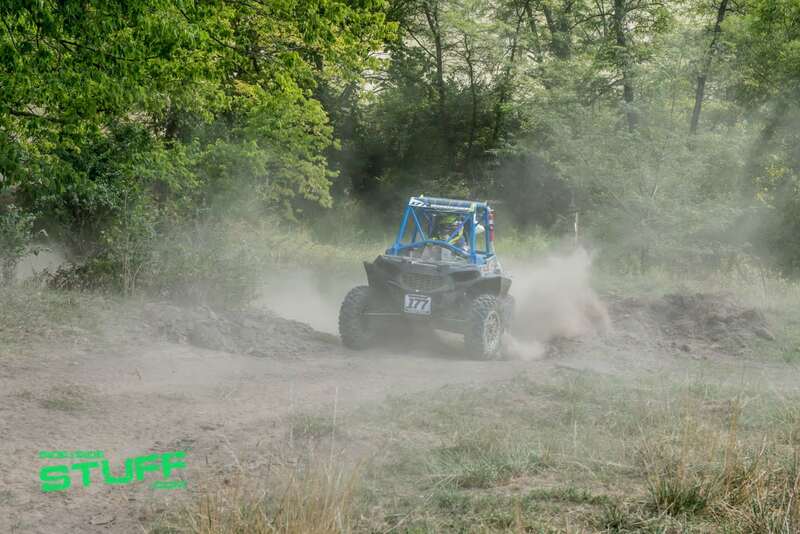 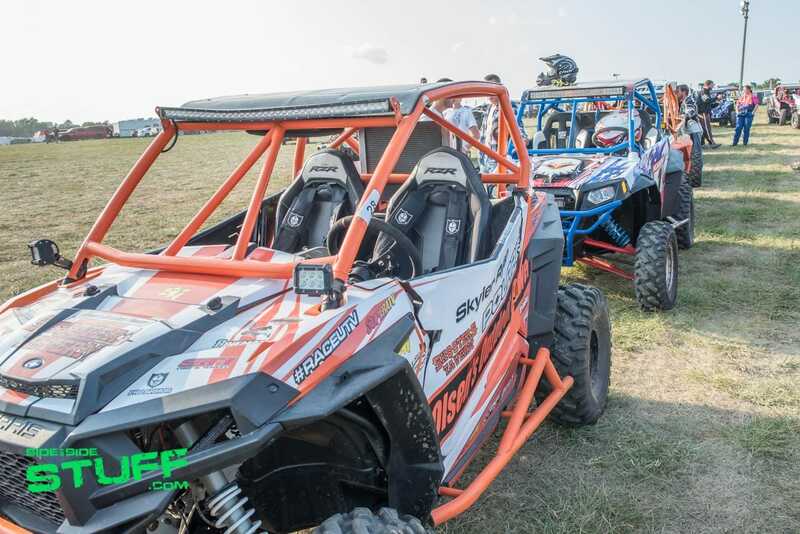 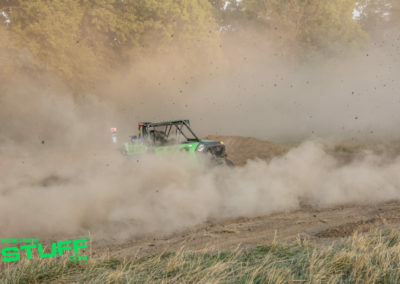 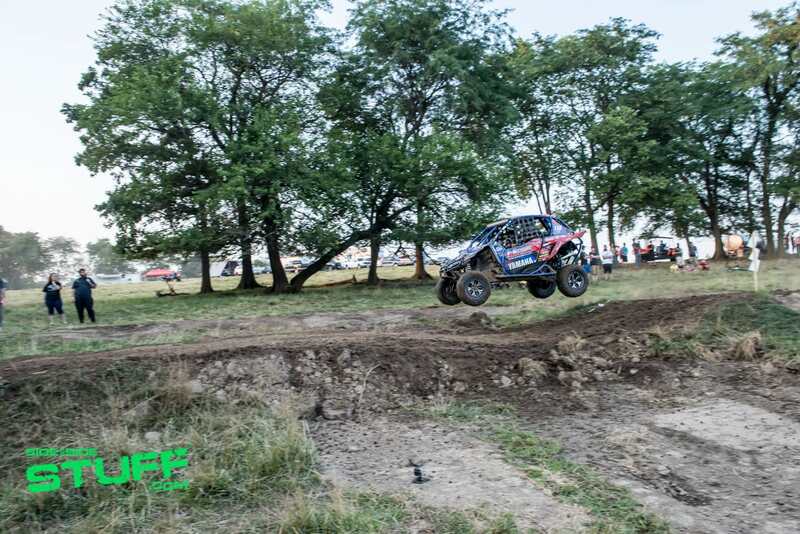 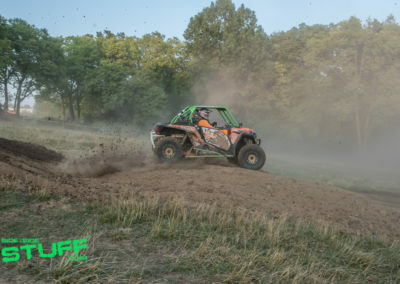 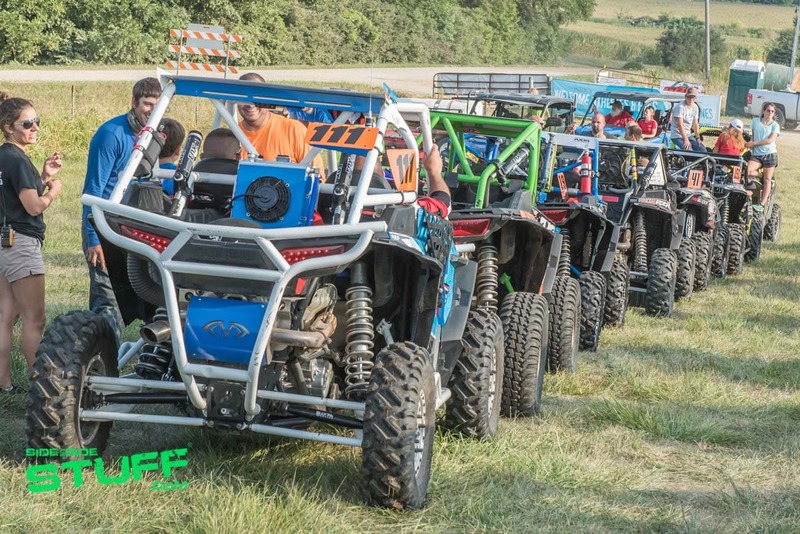 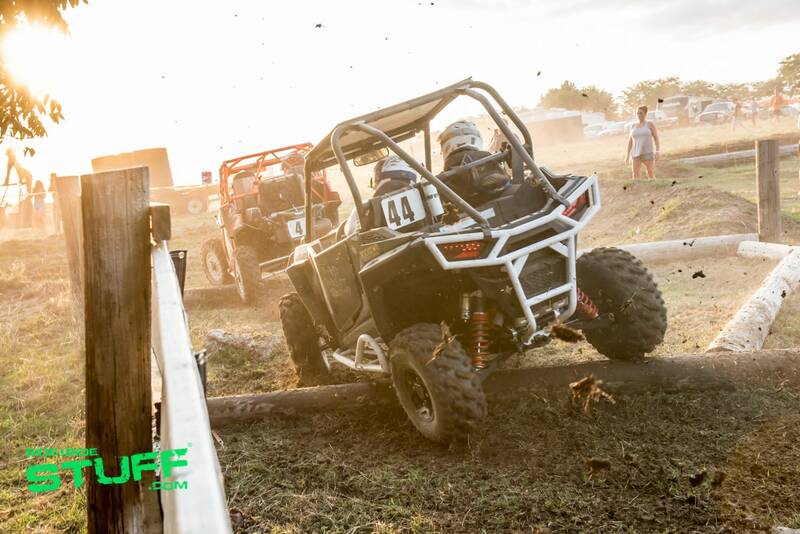 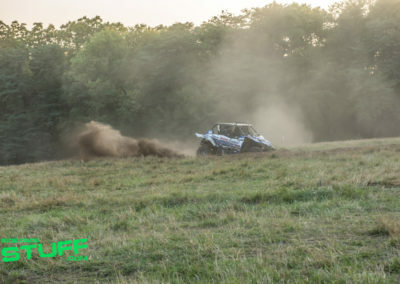 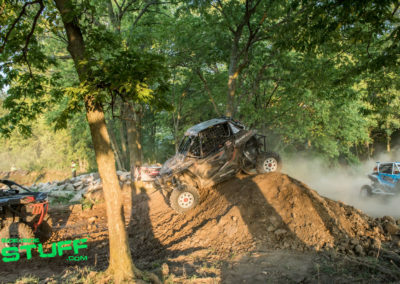 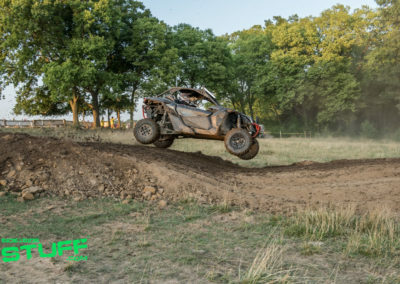 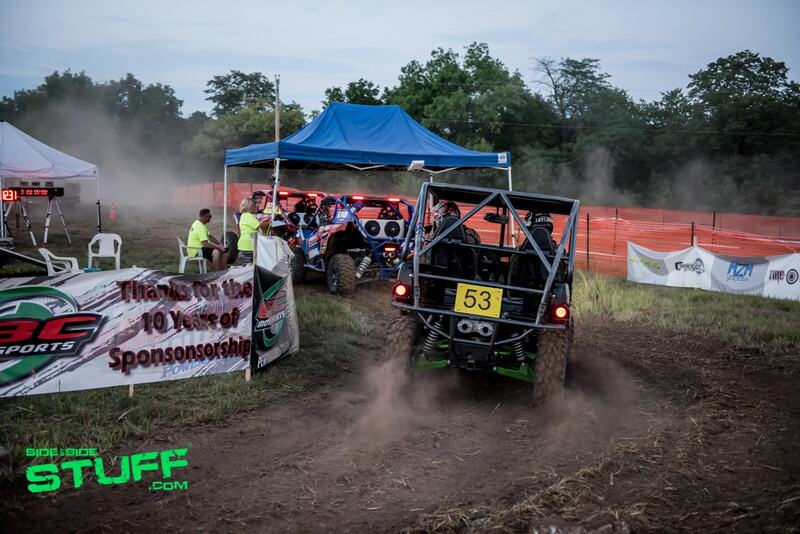 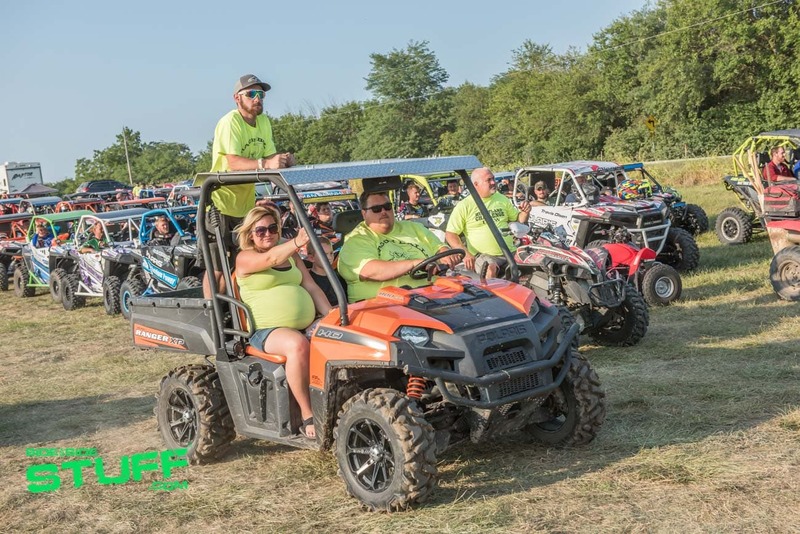 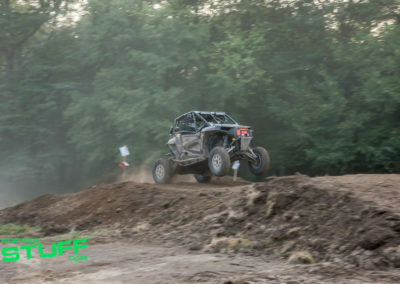 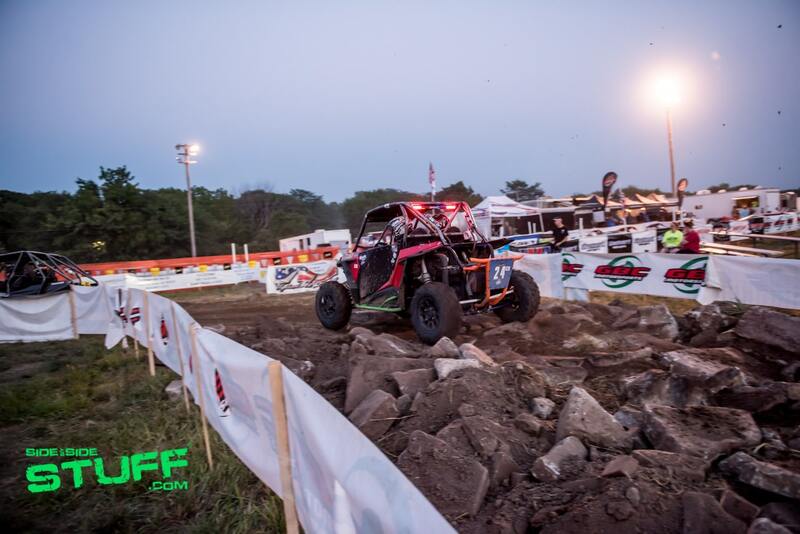 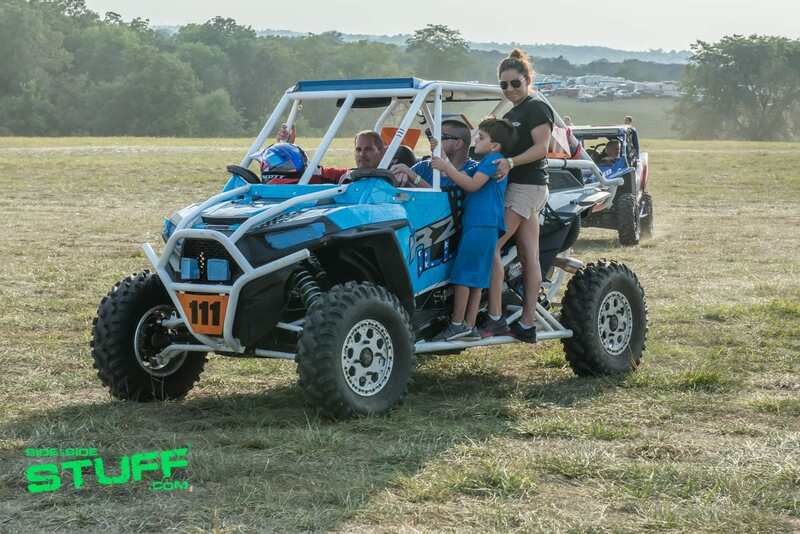 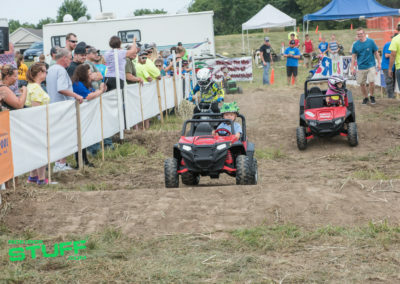 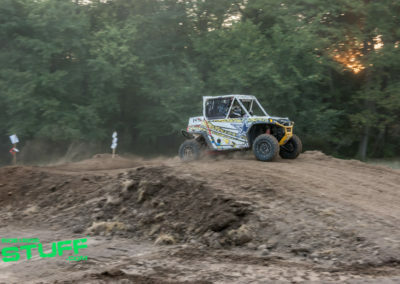 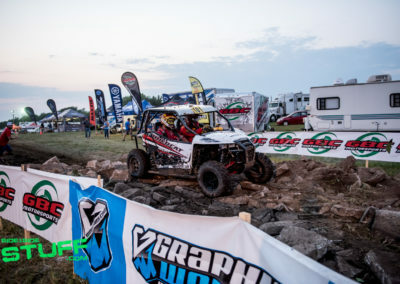 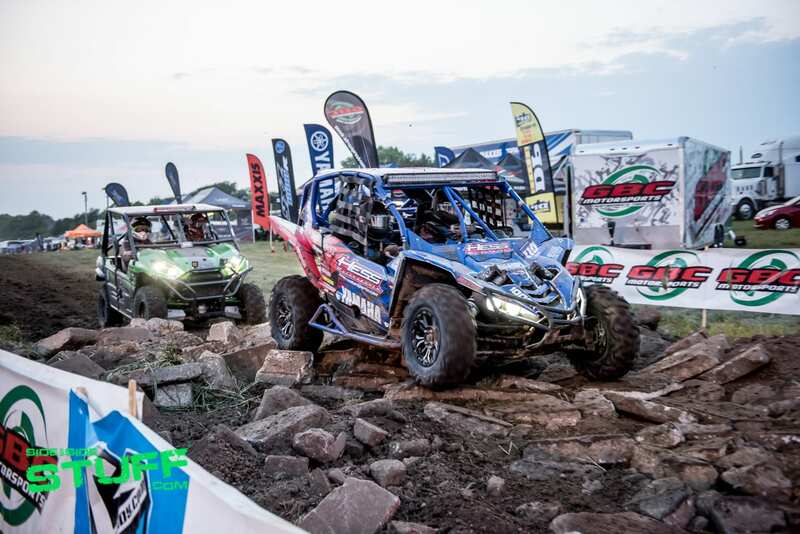 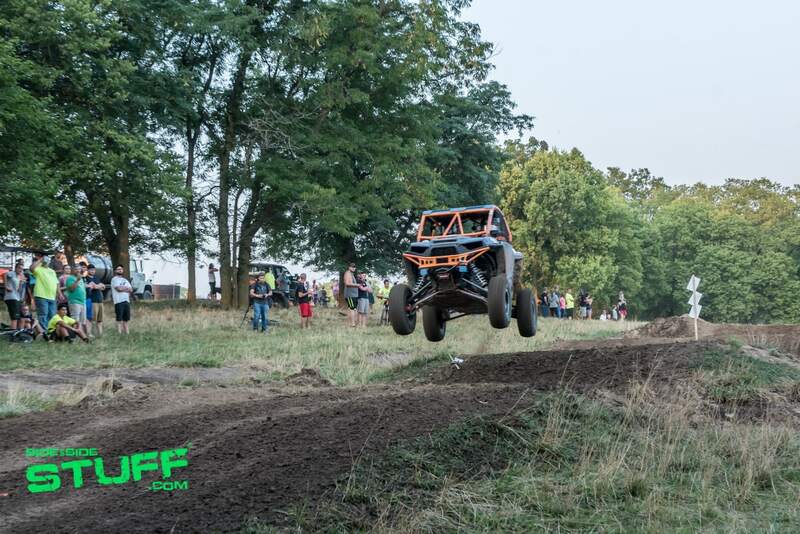 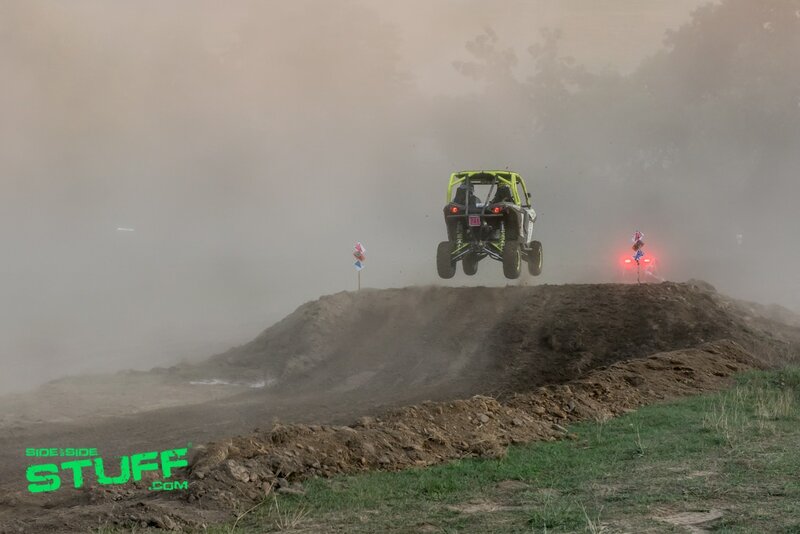 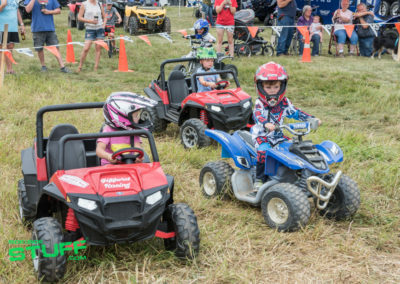 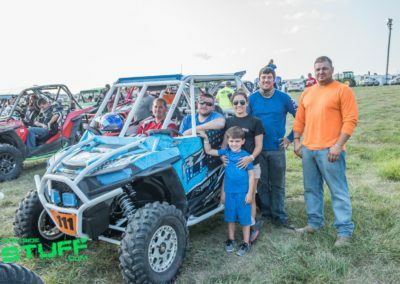 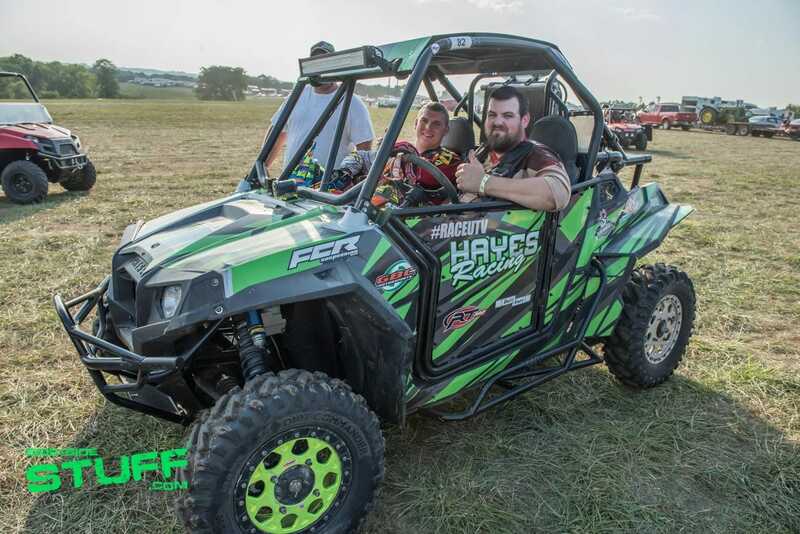 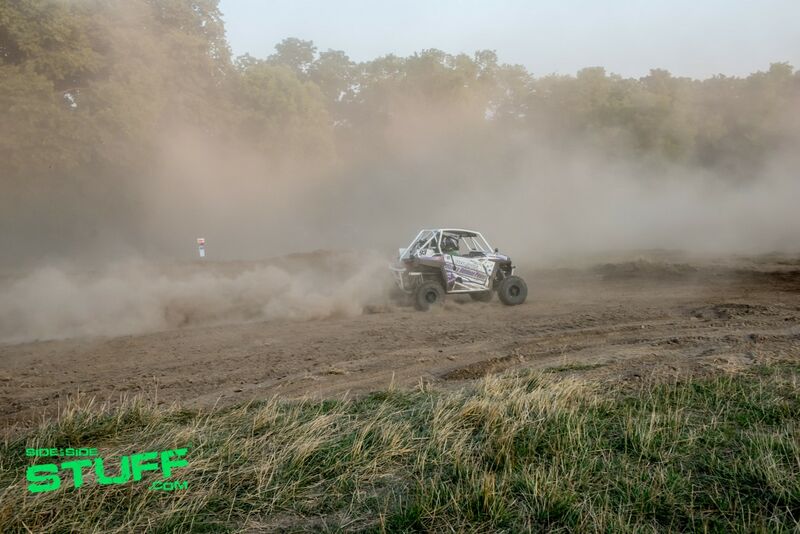 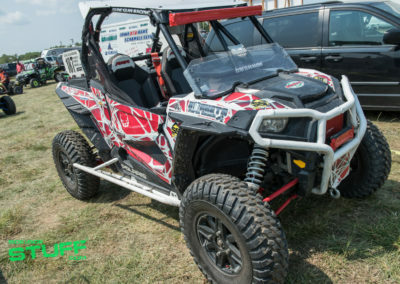 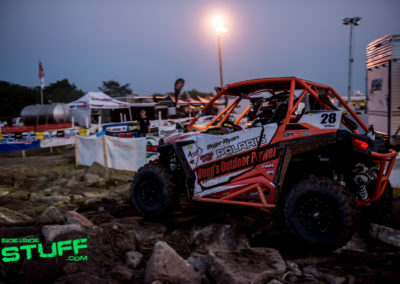 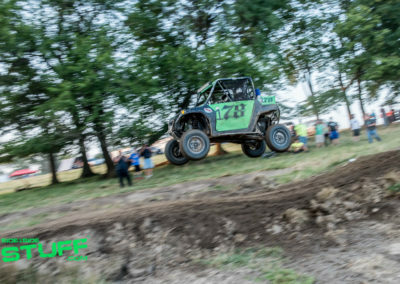 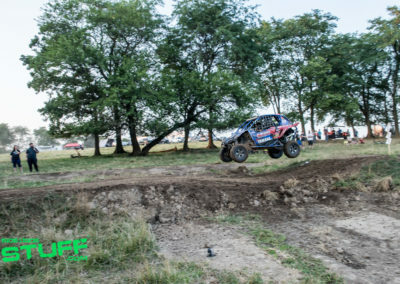 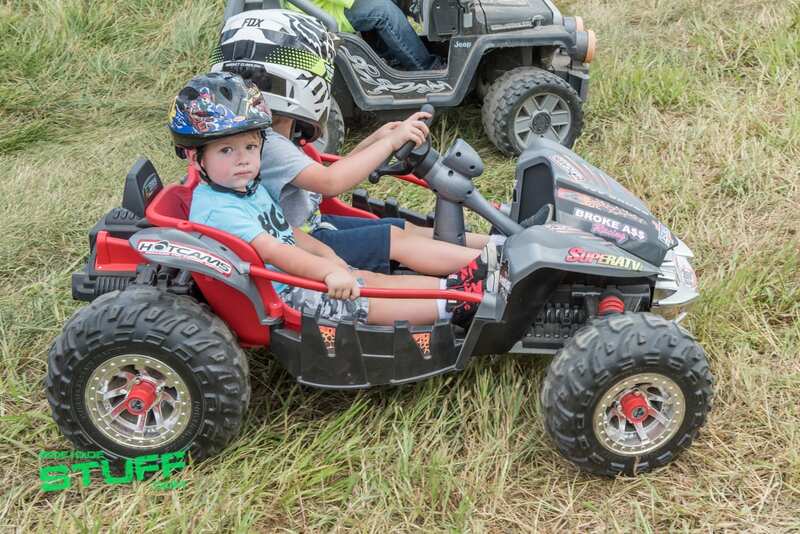 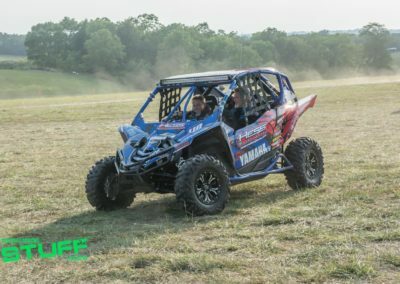 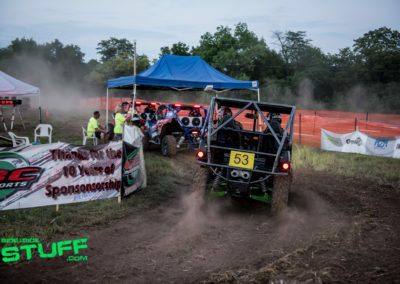 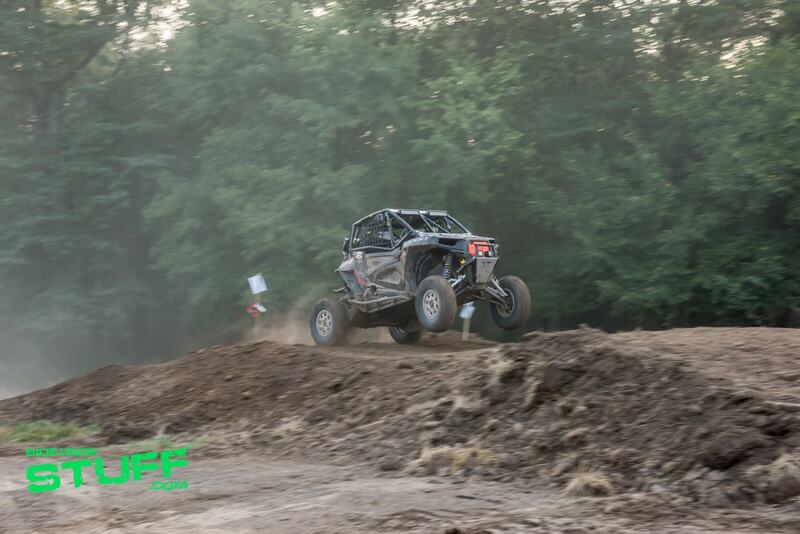 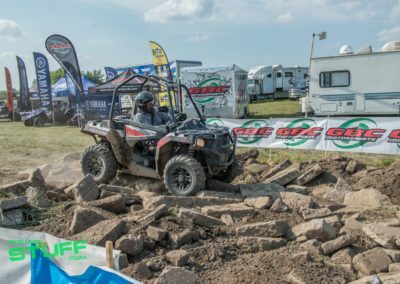 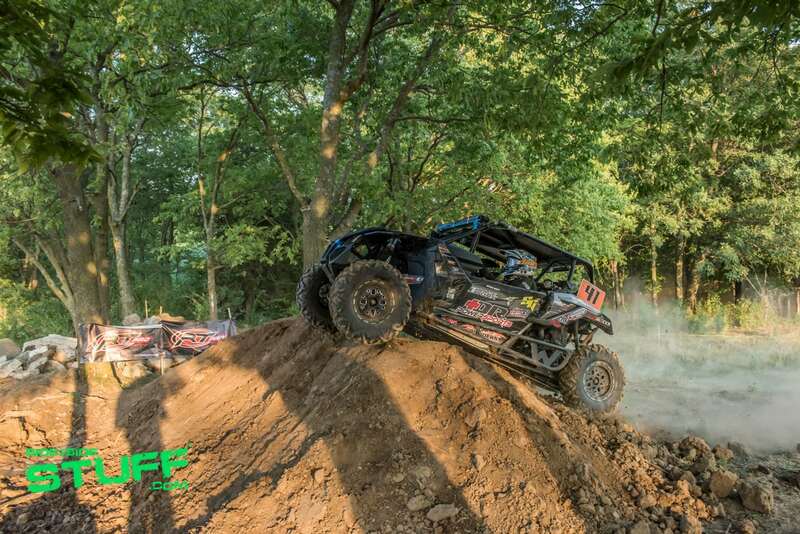 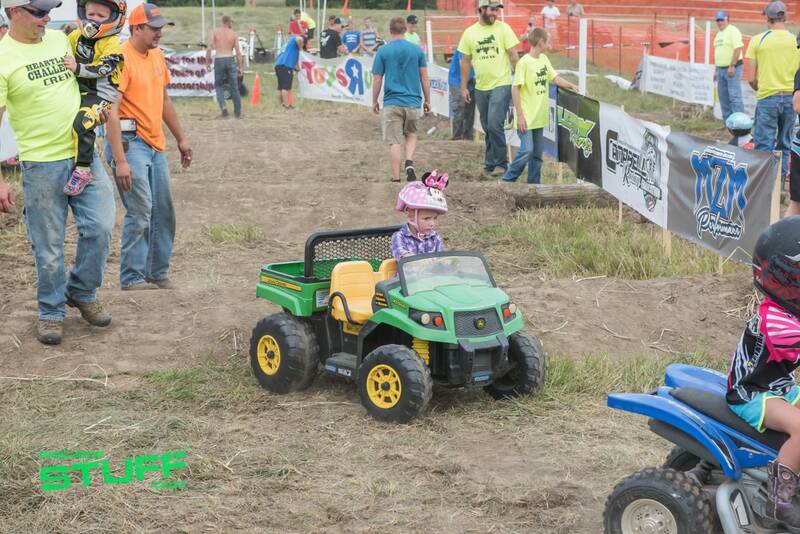 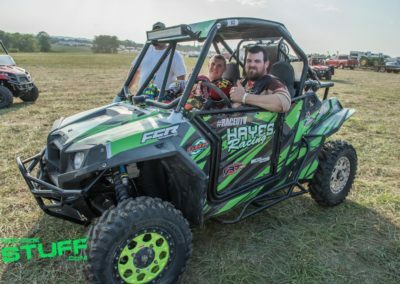 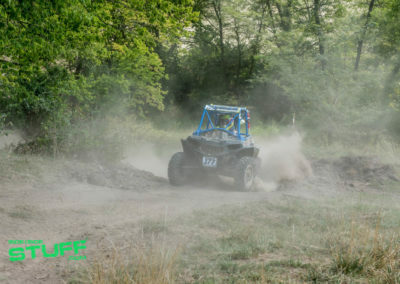 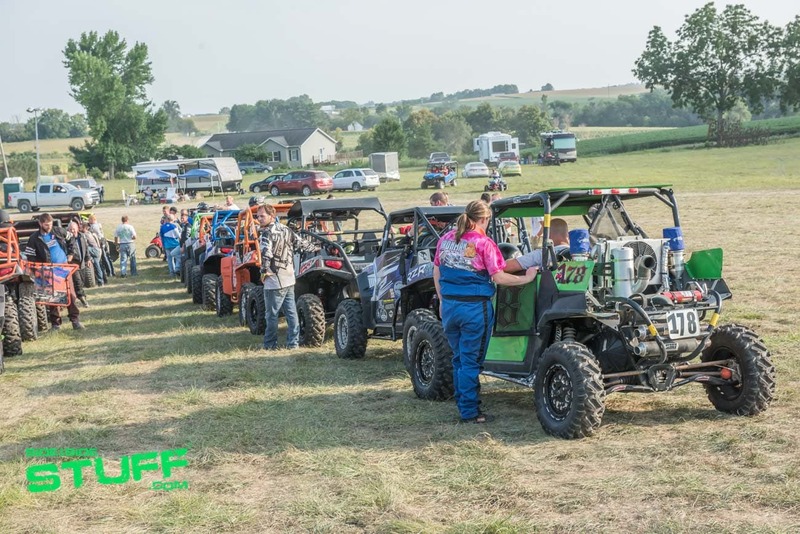 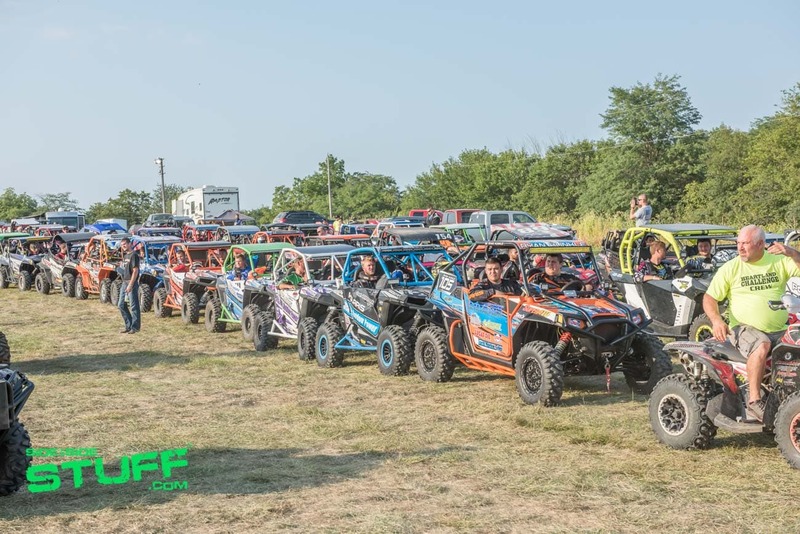 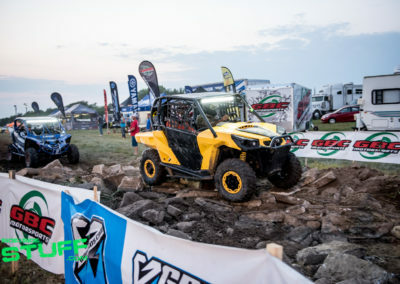 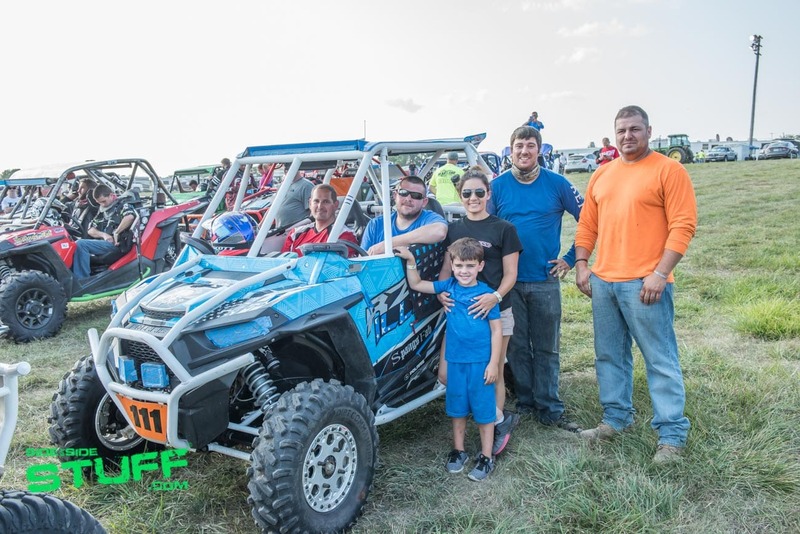 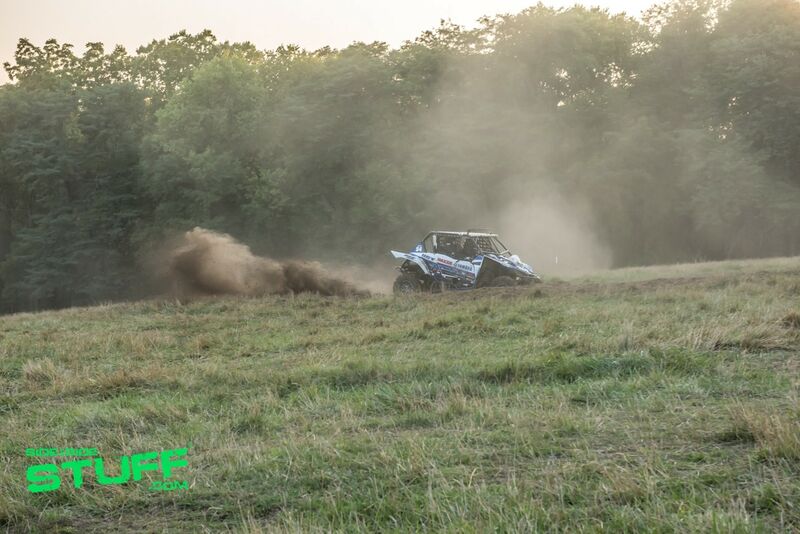 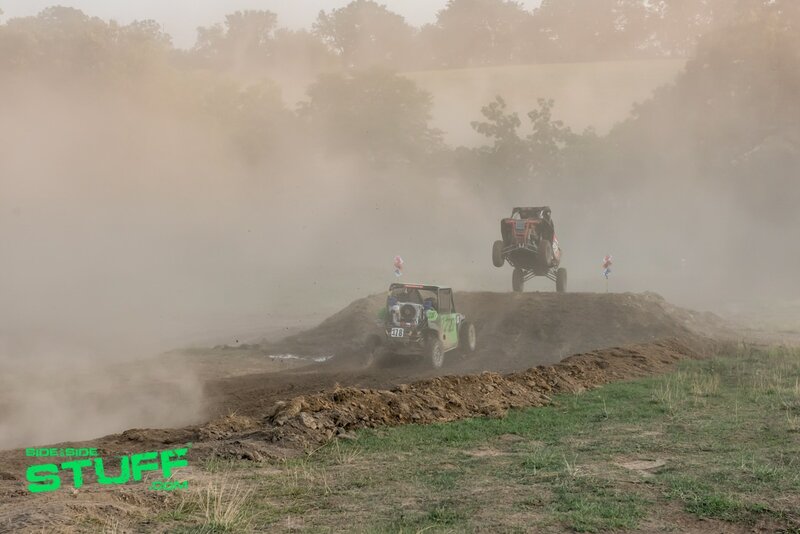 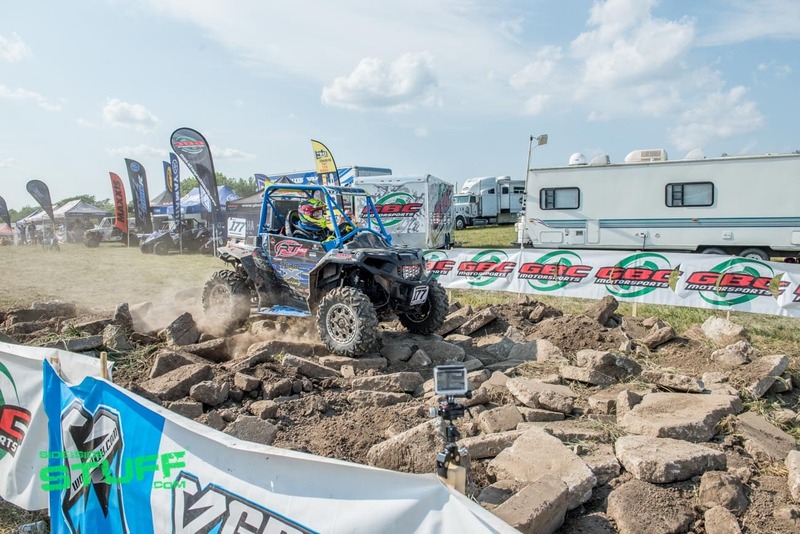 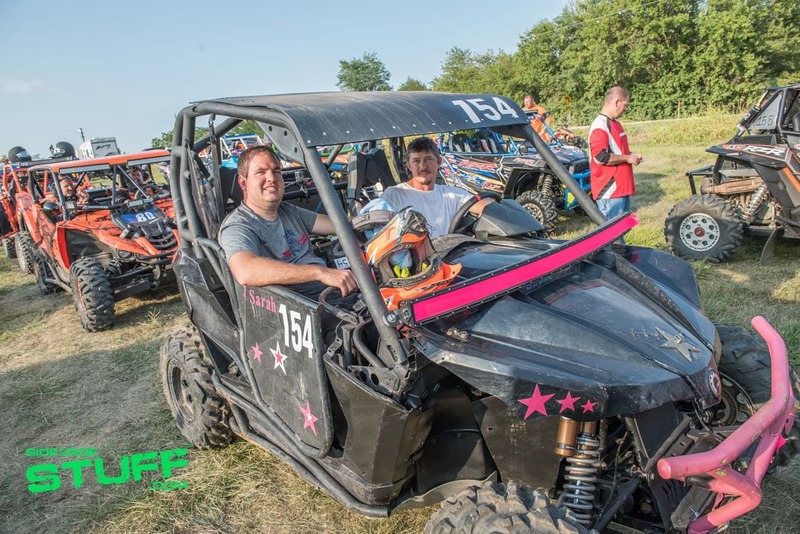 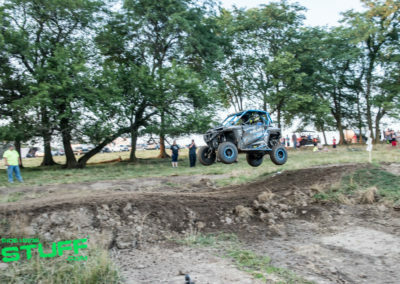 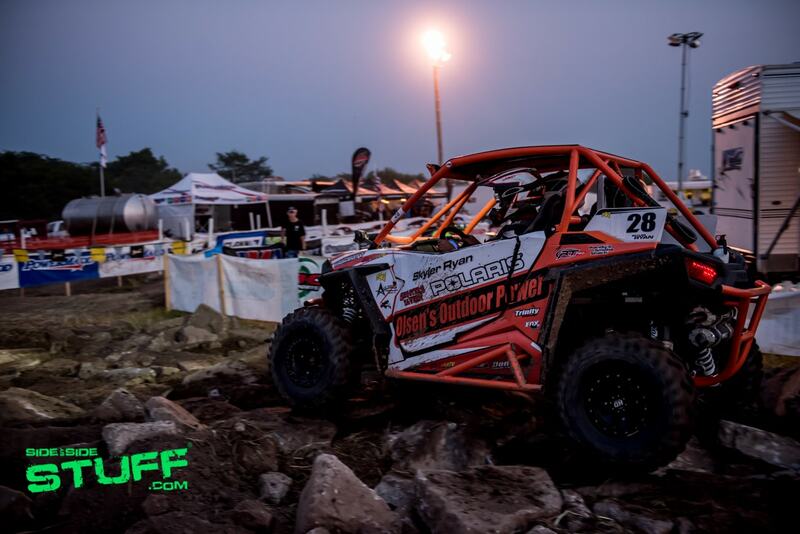 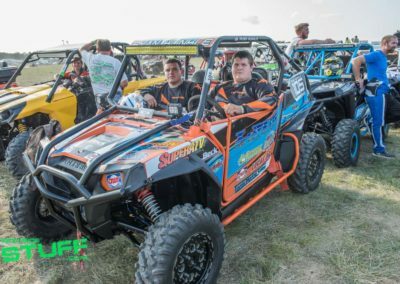 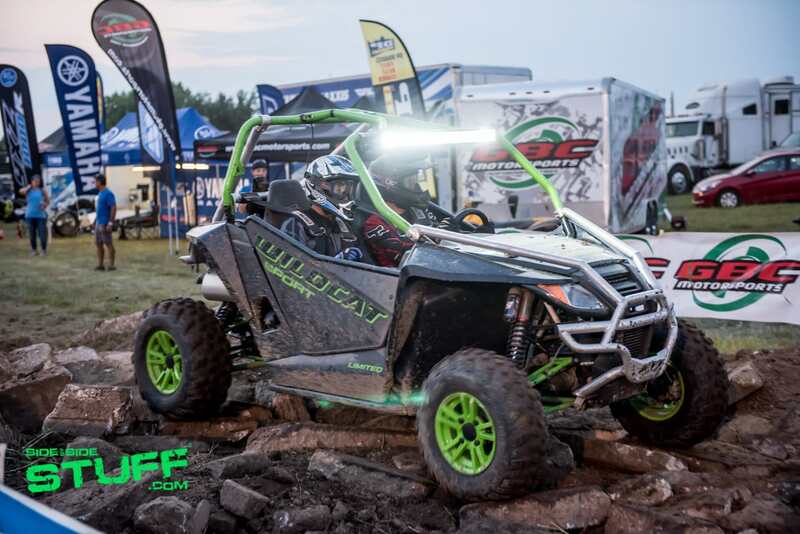 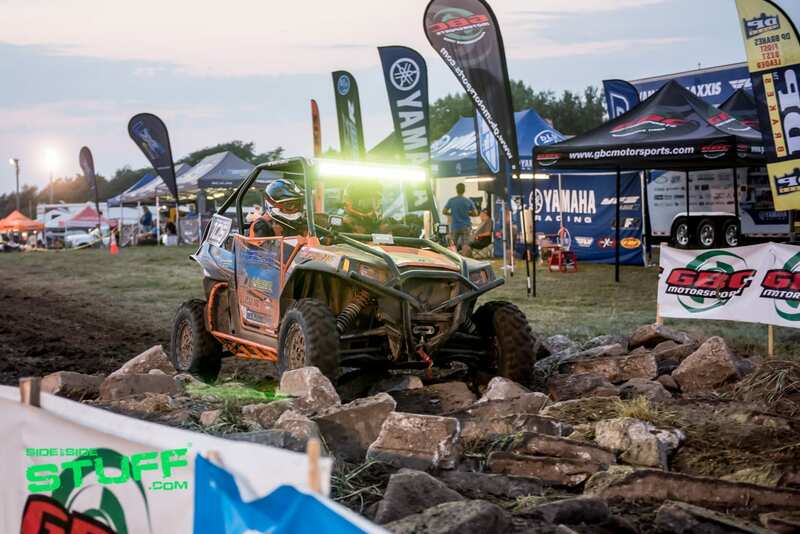 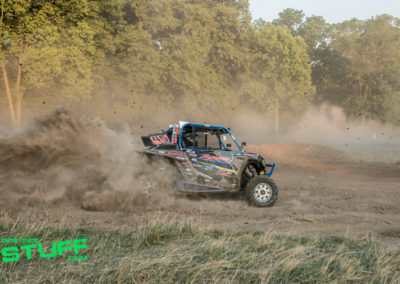 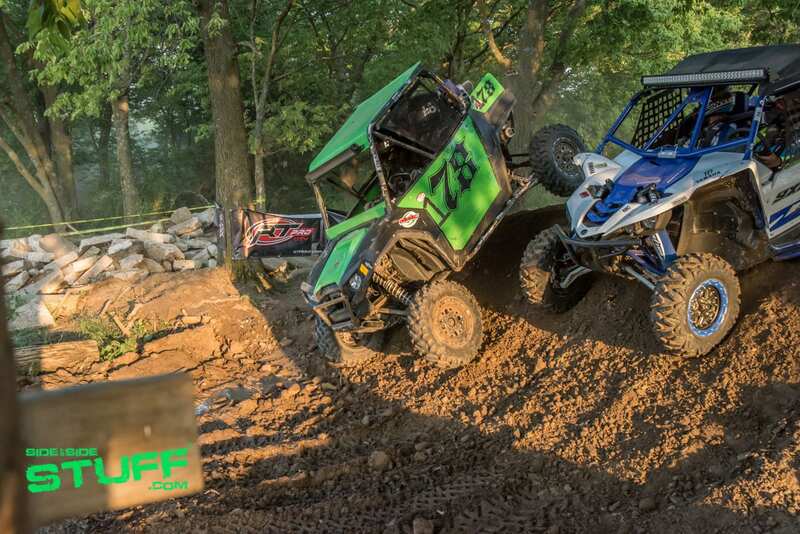 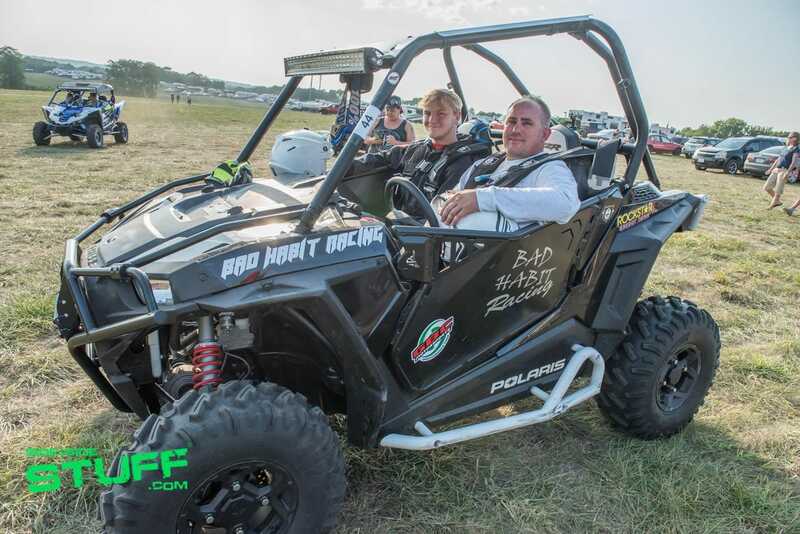 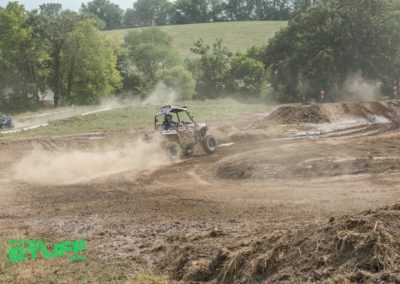 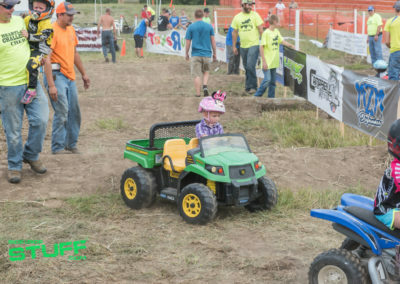 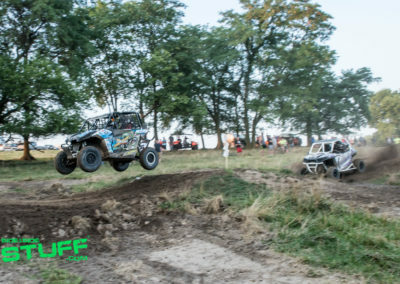 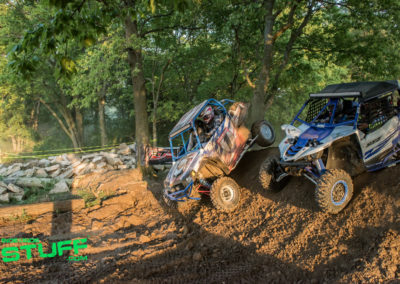 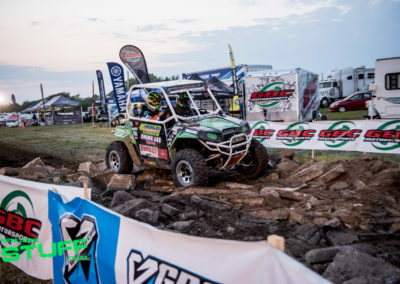 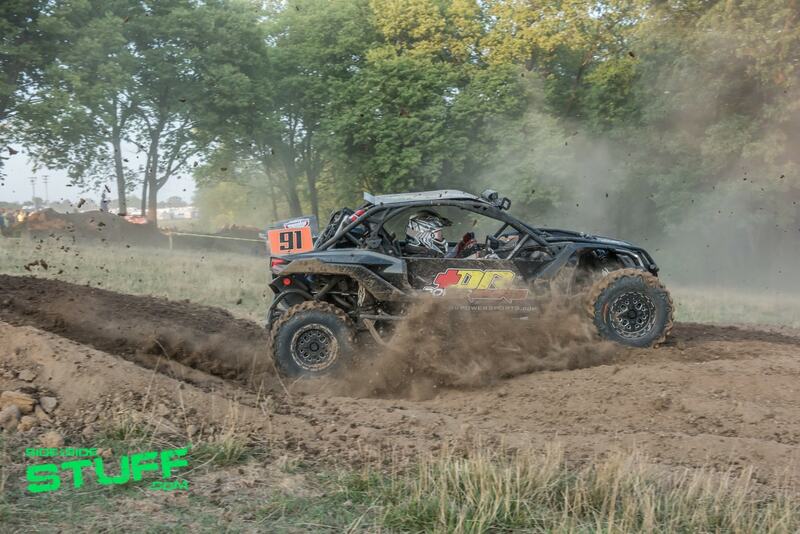 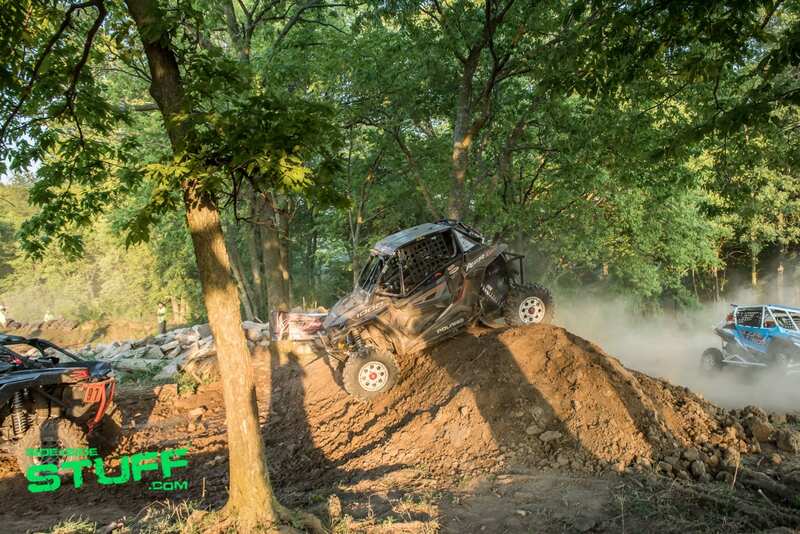 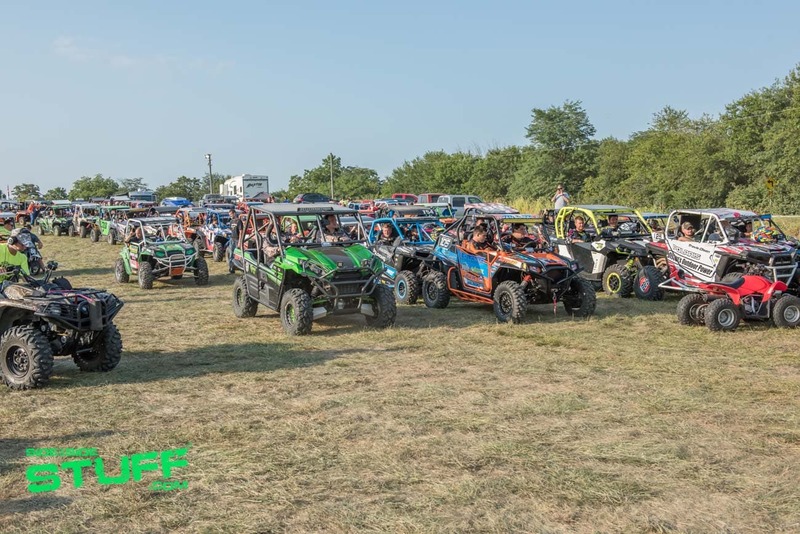 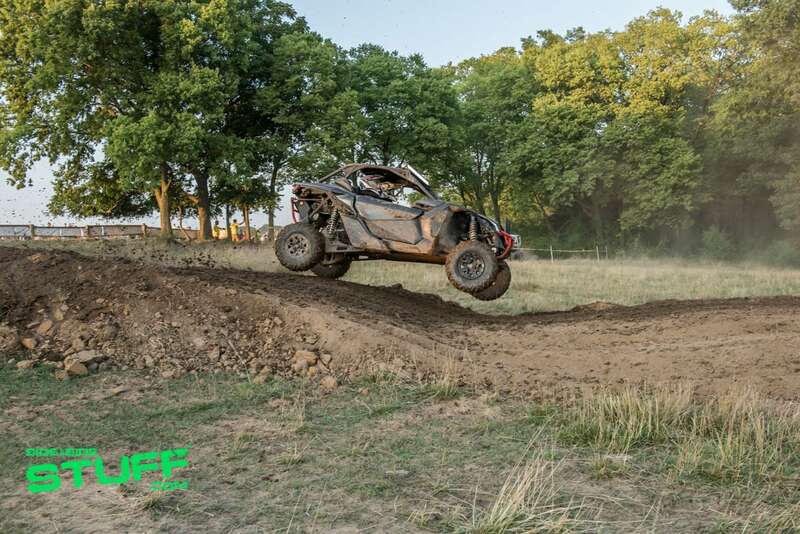 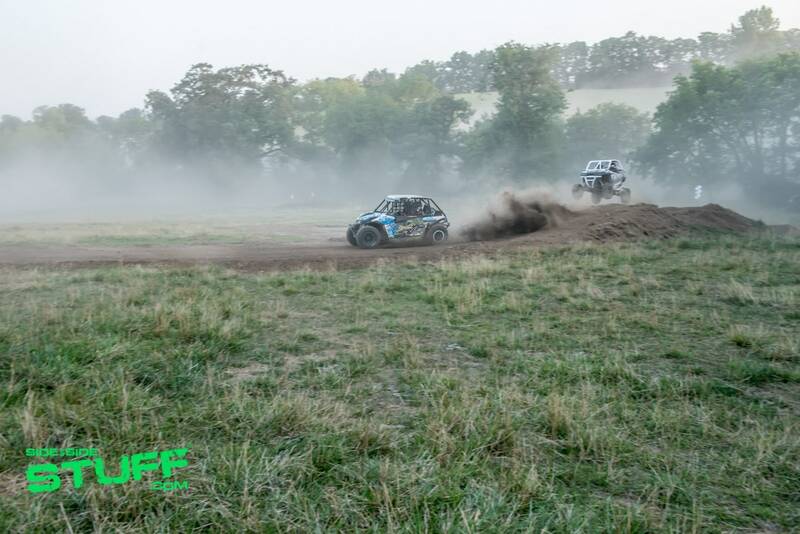 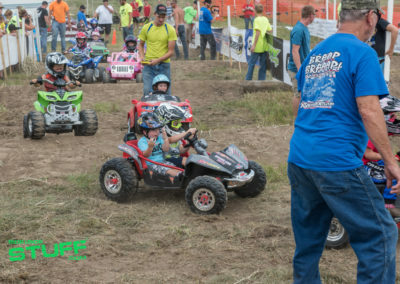 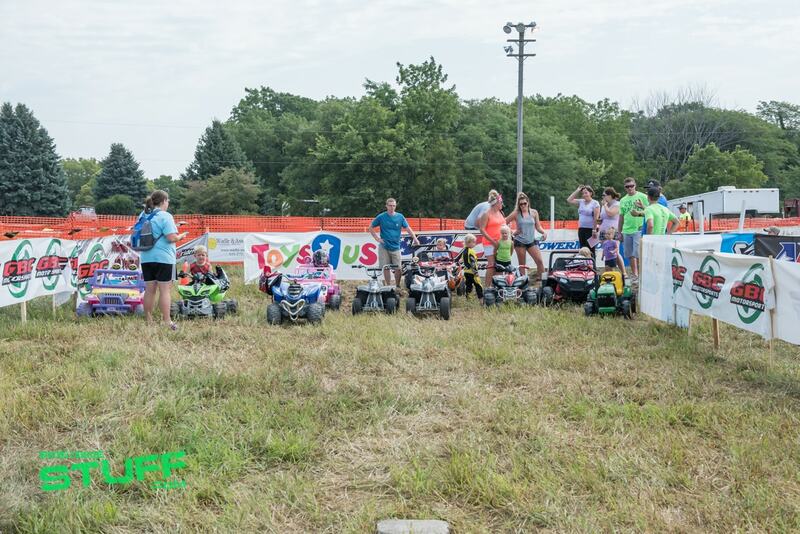 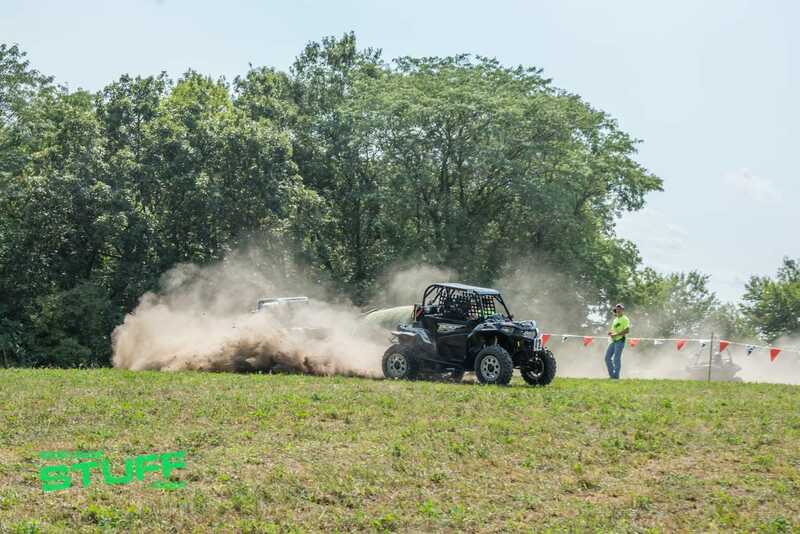 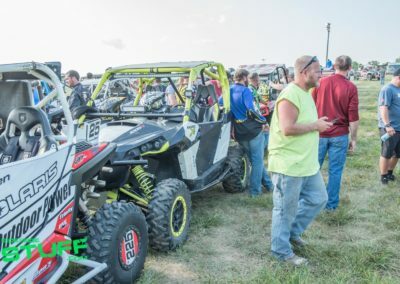 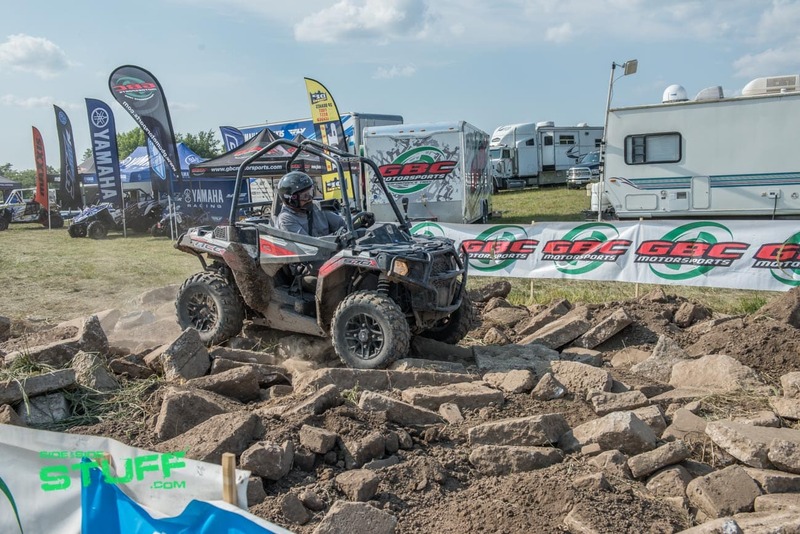 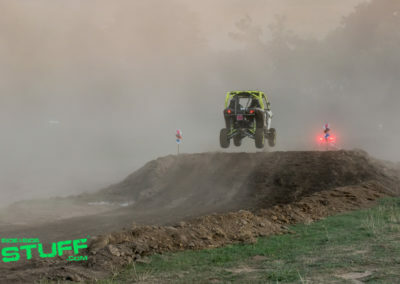 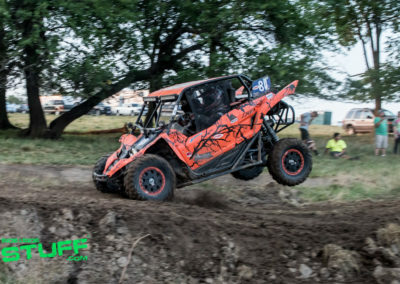 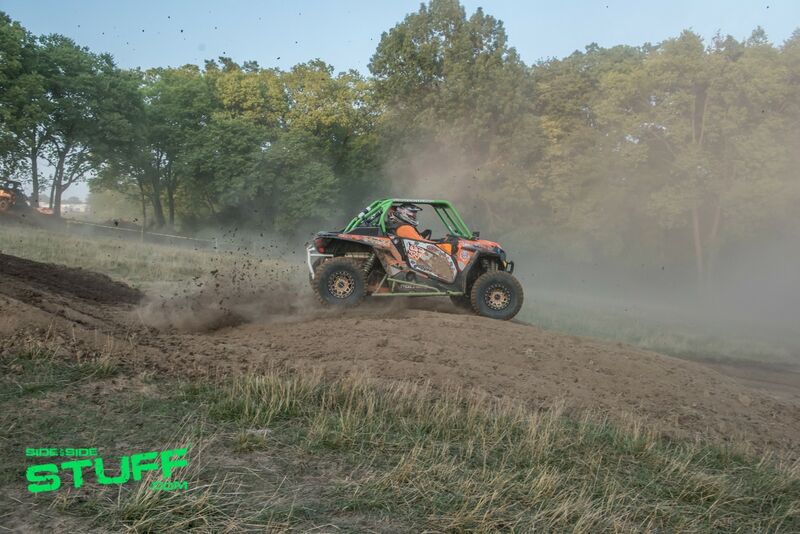 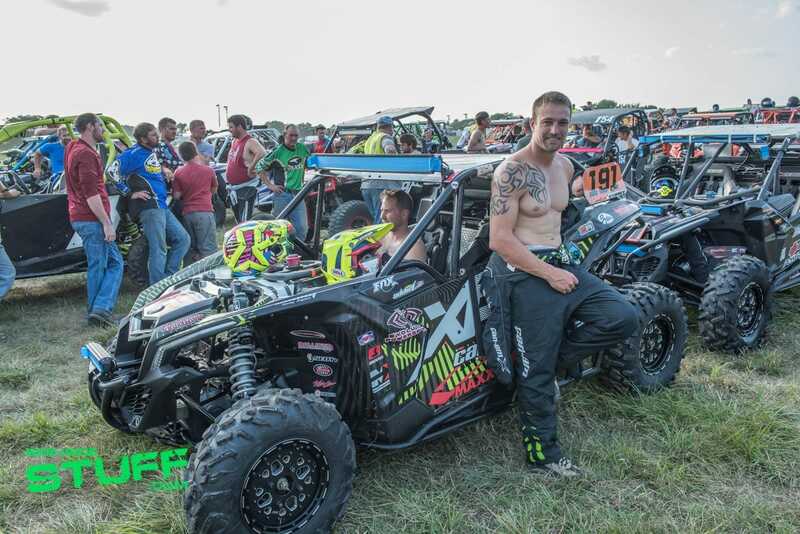 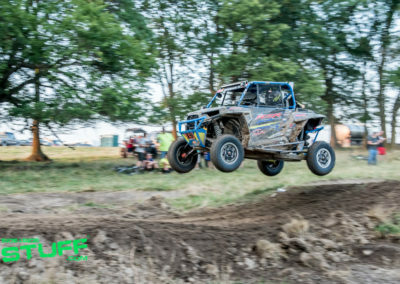 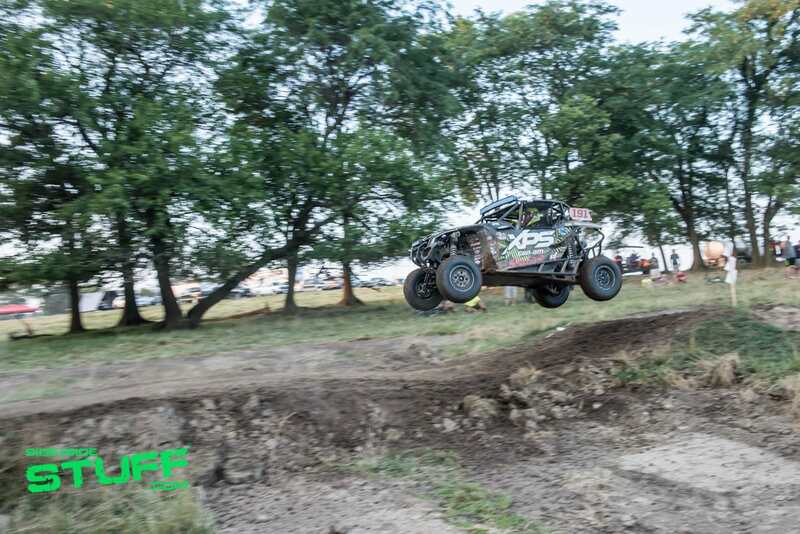 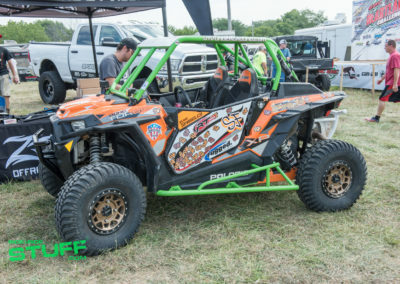 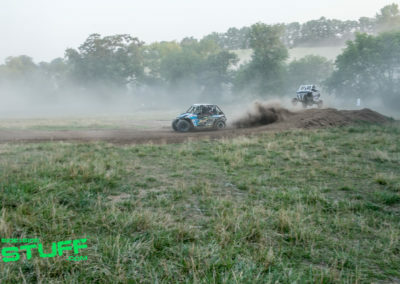 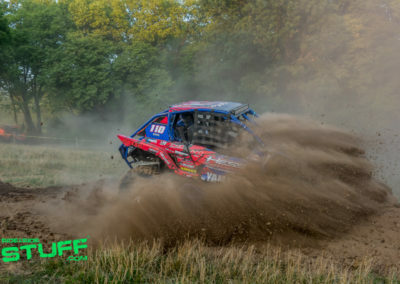 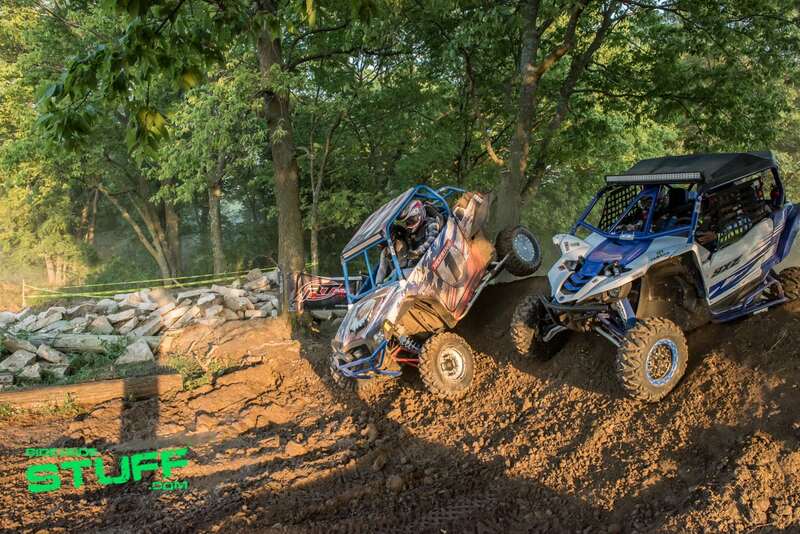 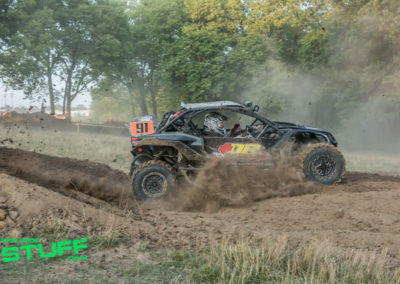 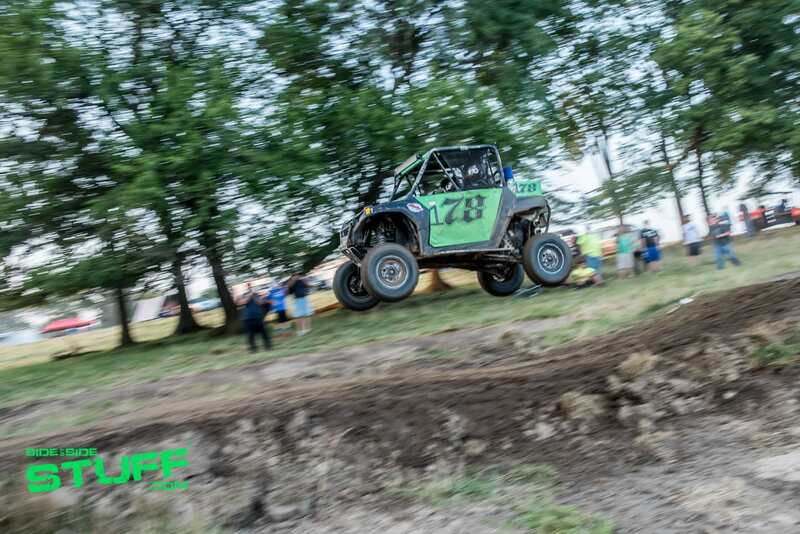 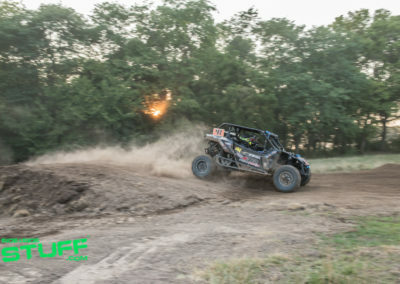 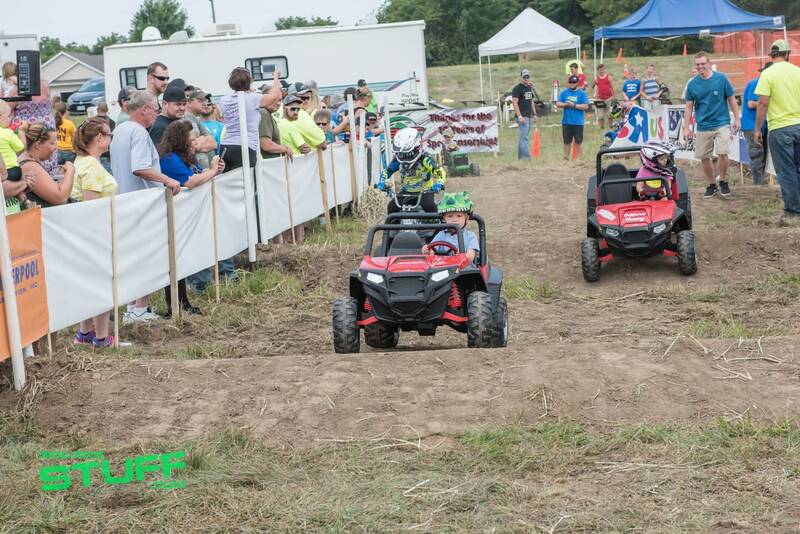 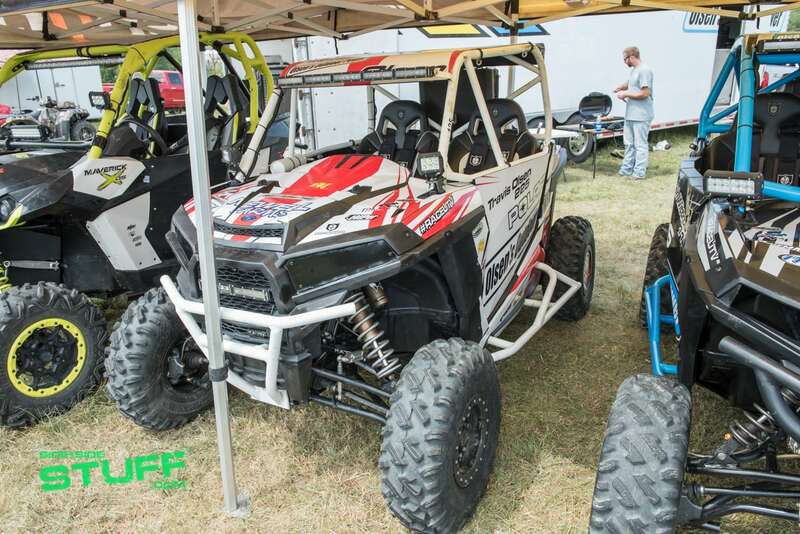 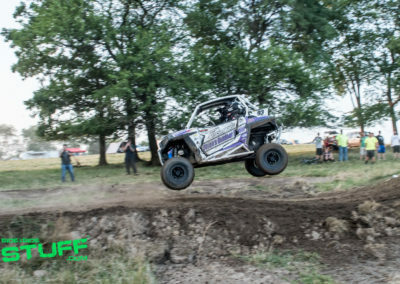 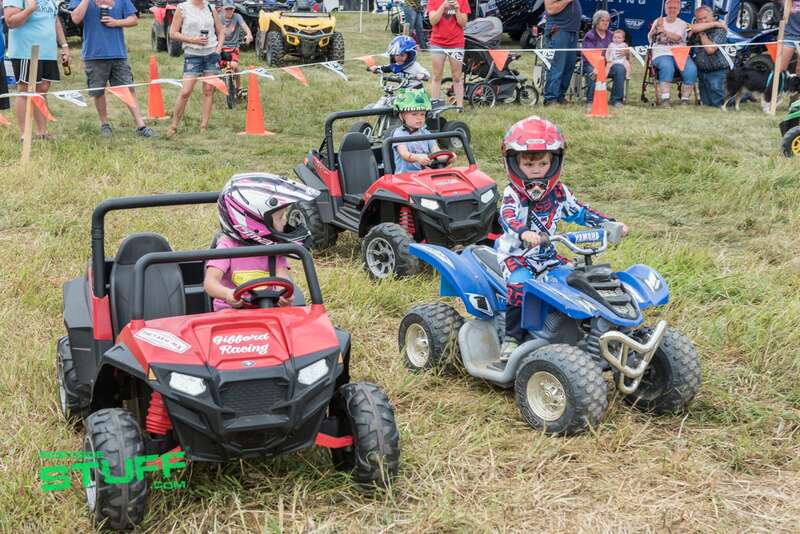 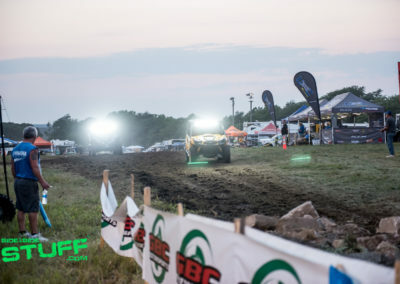 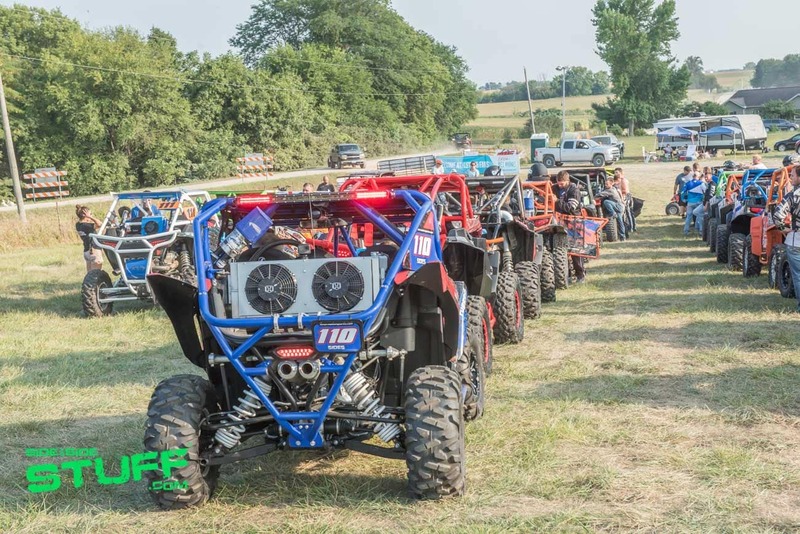 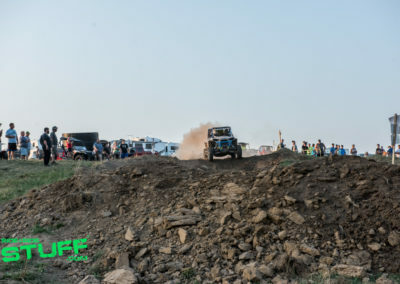 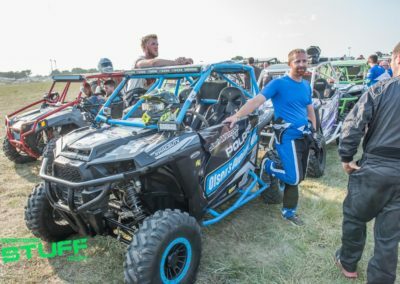 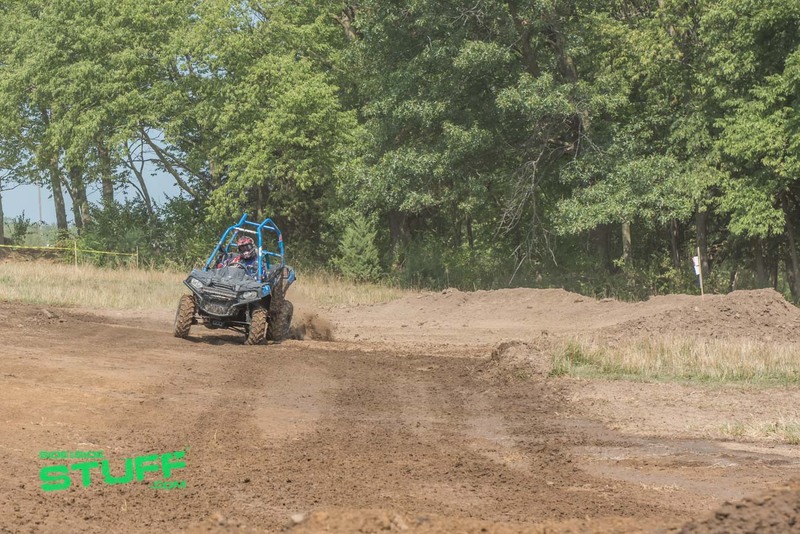 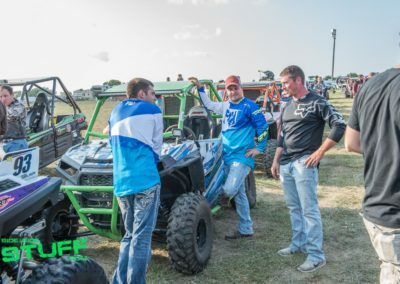 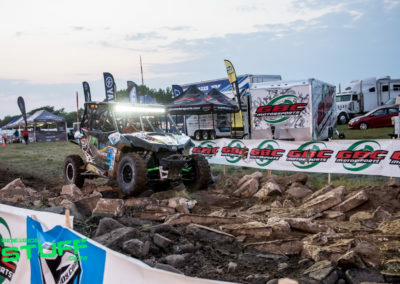 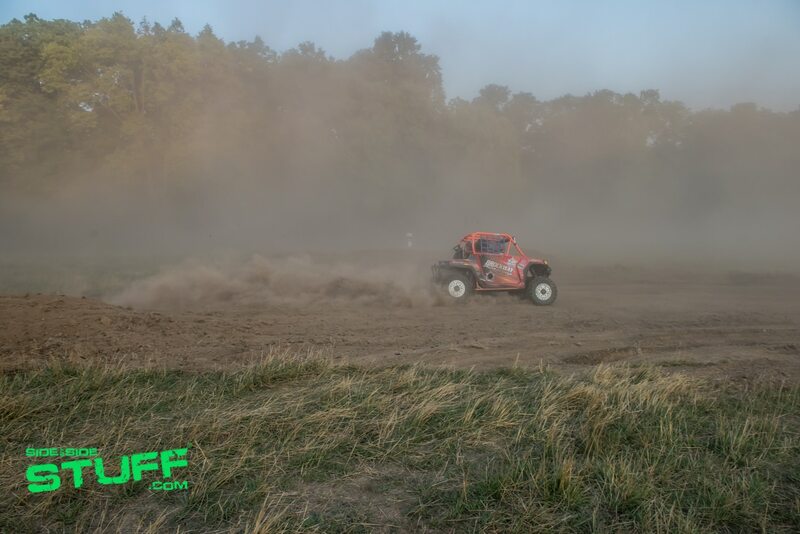 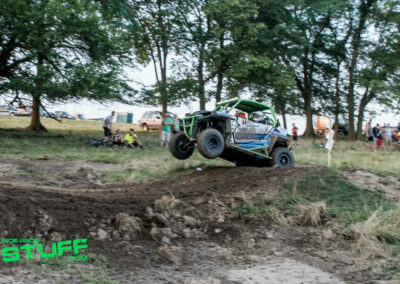 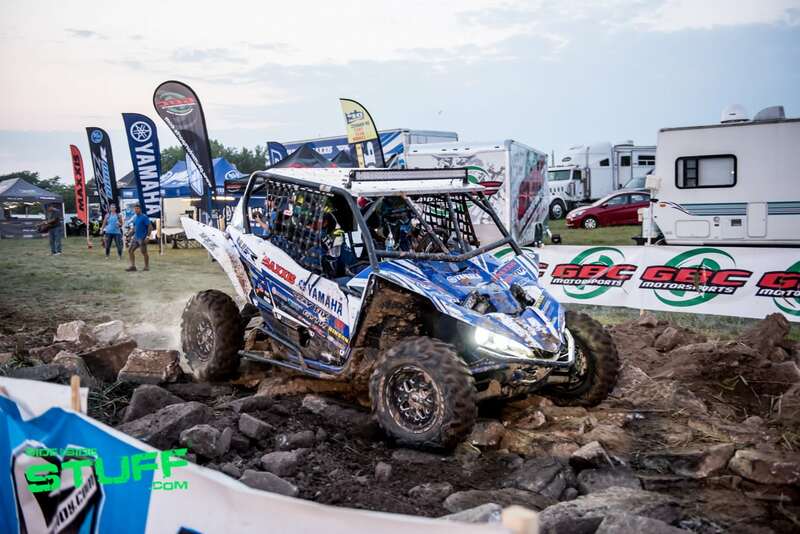 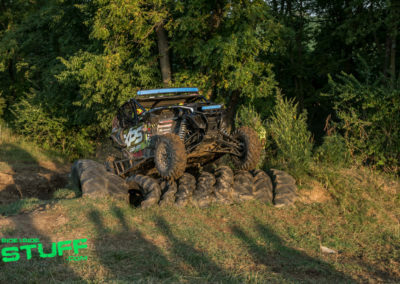 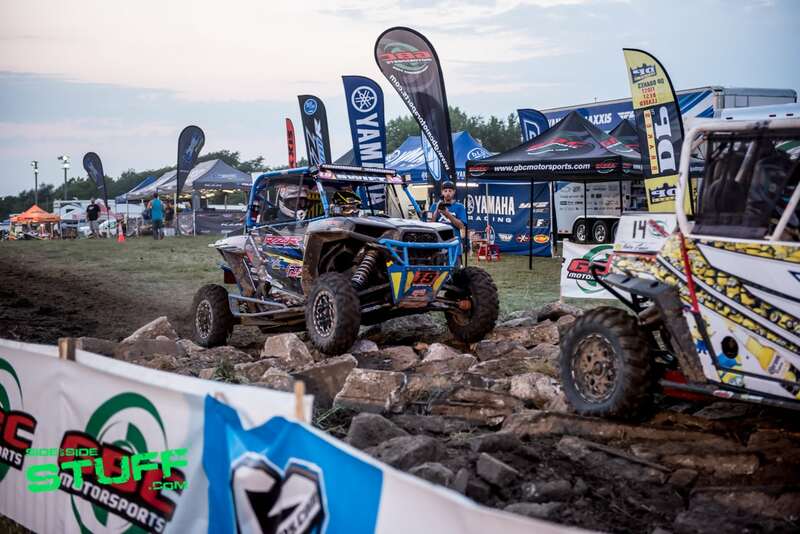 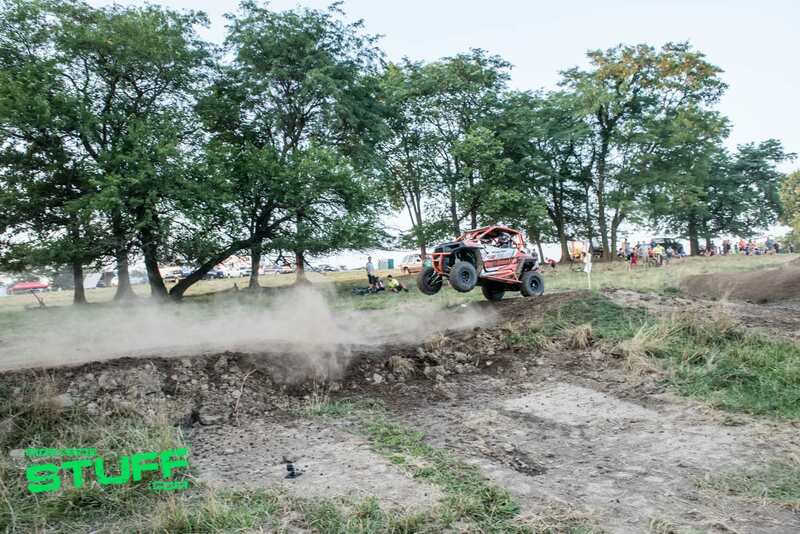 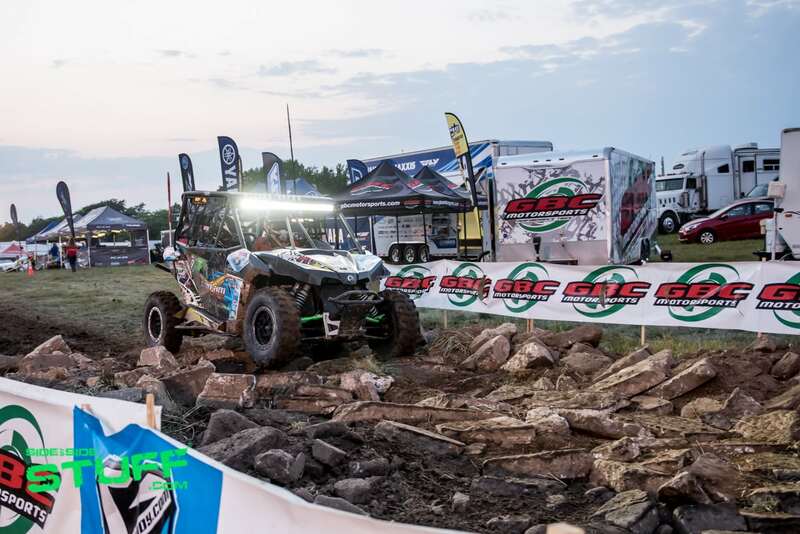 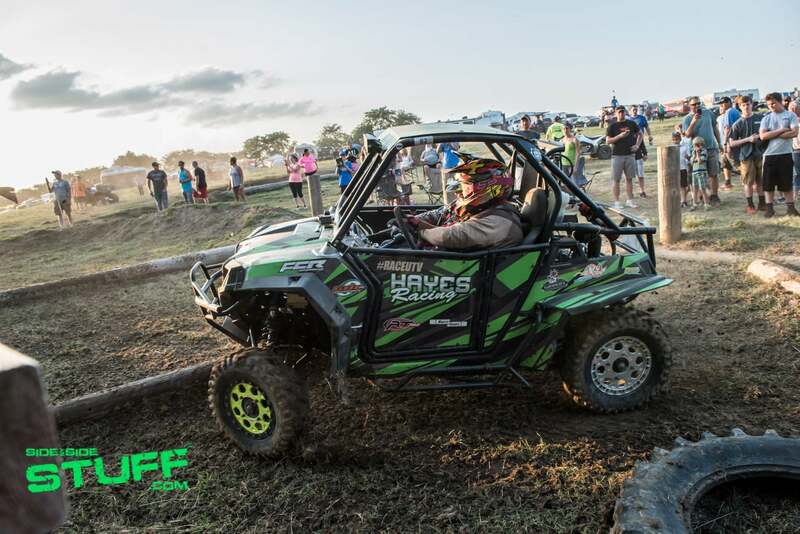 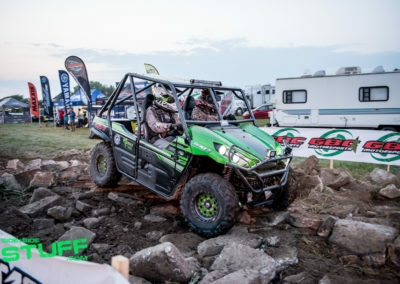 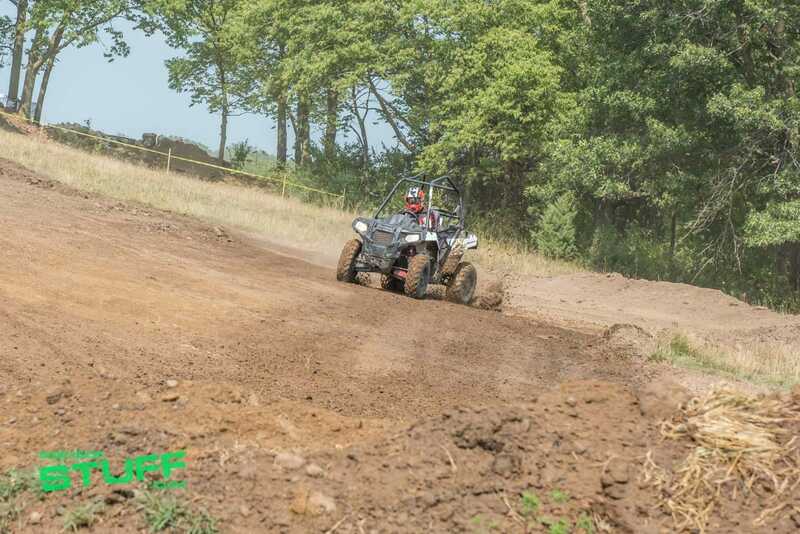 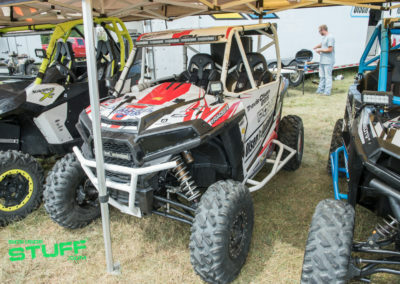 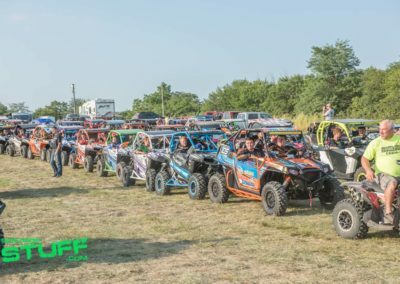 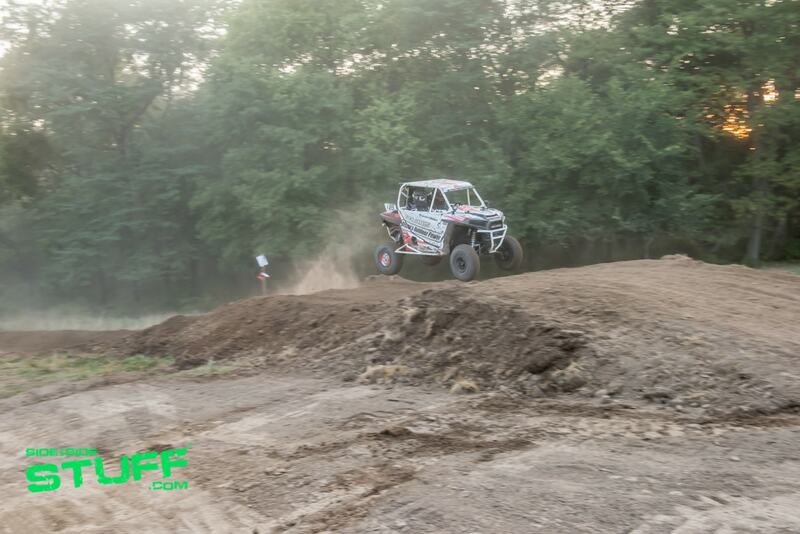 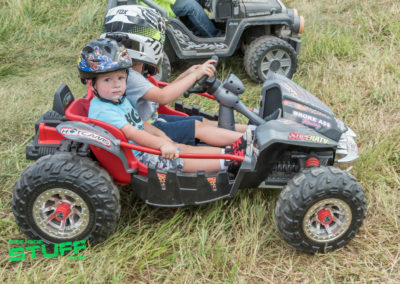 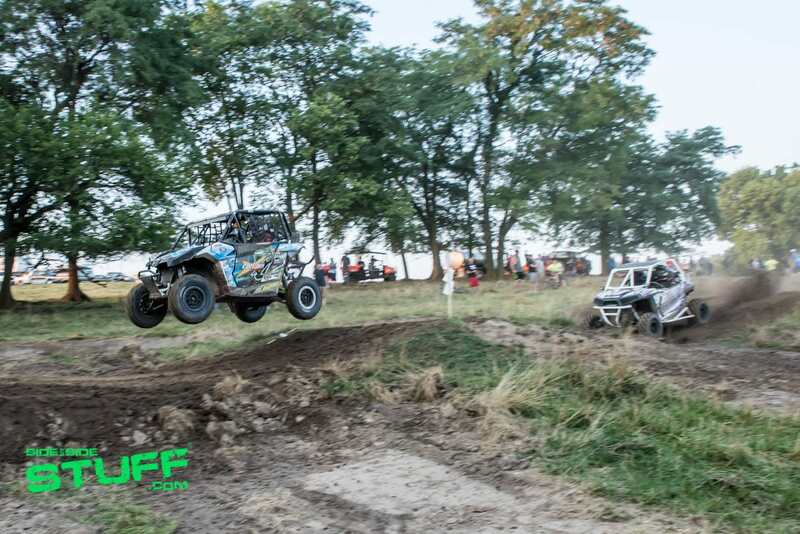 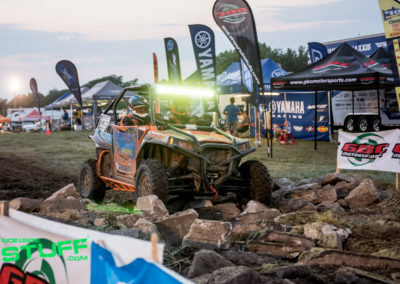 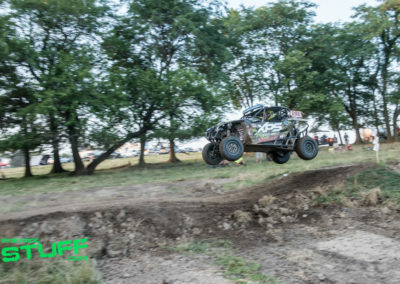 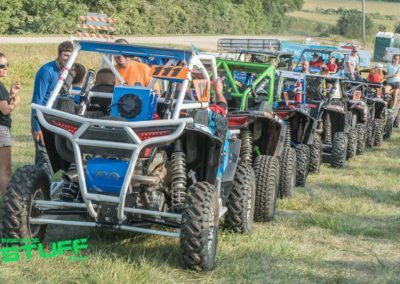 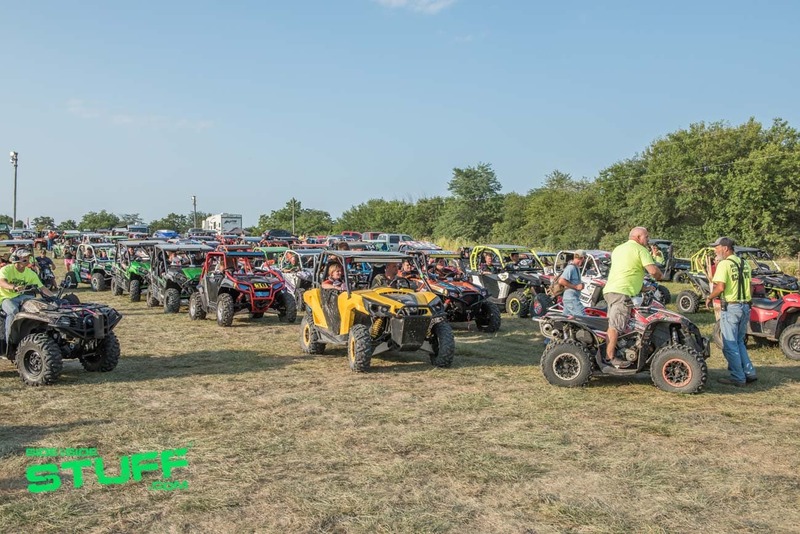 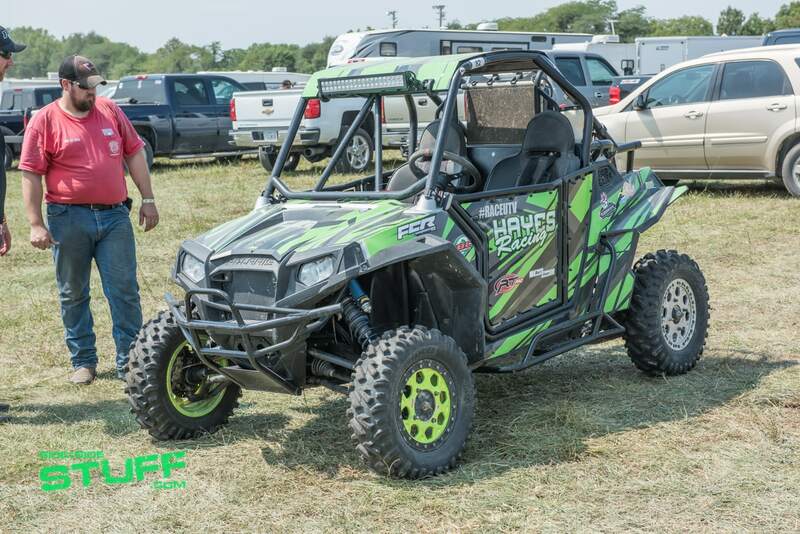 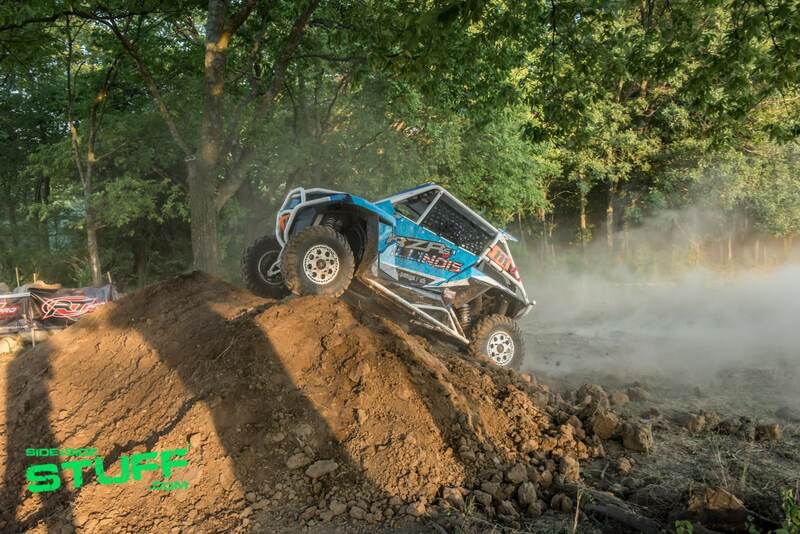 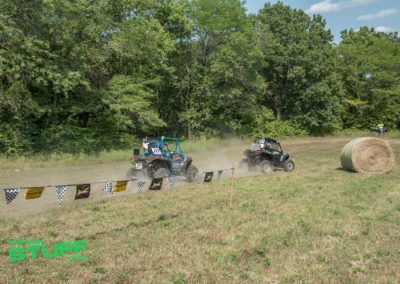 The UTV race consisted of 4 classes racing on the track at the same time, each trying to capture their piece of the $7500 prize money that was up for grabs. 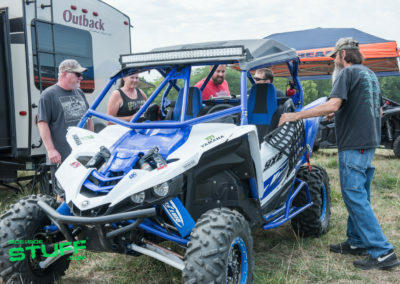 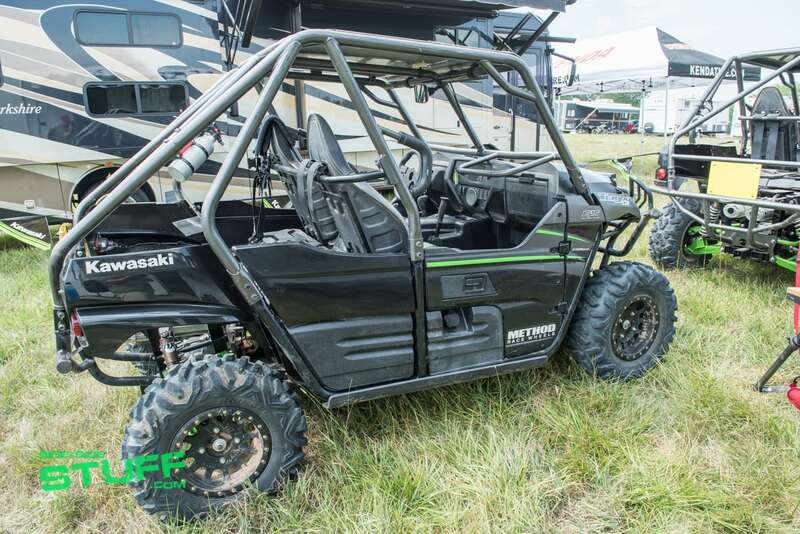 The classes were 800, 900, 1000 and open UTV. 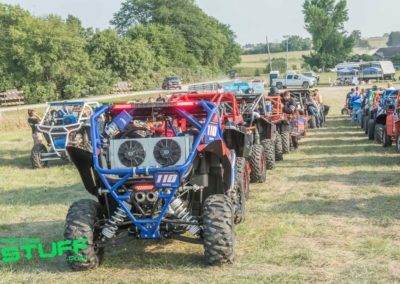 Spectators lined up to witness the start of the UTV main event and witnessed all out chaos when the flag dropped. 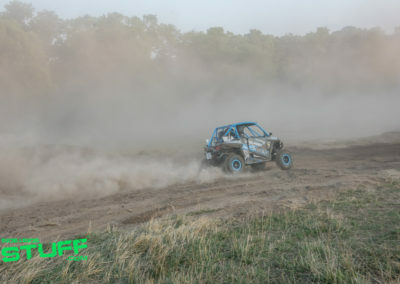 The side by sides kicked up so much dust that the unlucky drivers who didn’t make it off the line first were pretty much driving blind which made for a pretty exciting race start. 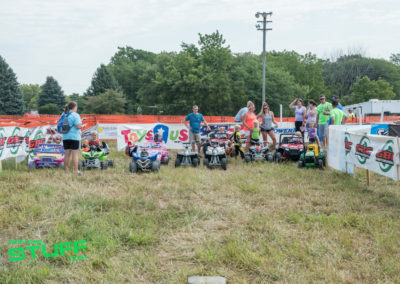 One of the pre-event highlights was the 30 minute children’s Little Electric Race where dozens of youngsters lined up to run head to head against each other in this slow paced electric car shootout. 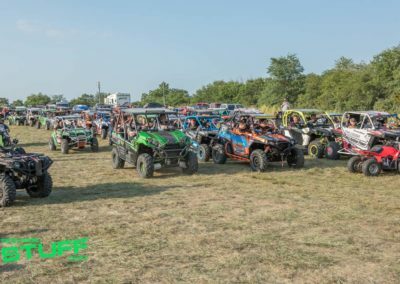 This crowd pleasing race had everything a race fan would expect including NASCAR style drafting, rubbing and all out multi car pile ups. 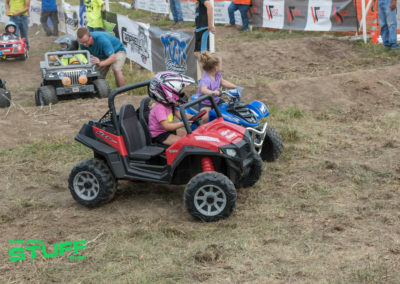 Many of the young aspiring racers were unable to keep focused on the race track which caused carnage to break out everywhere, luckily the kids weren’t moving fast enough to get hurt. 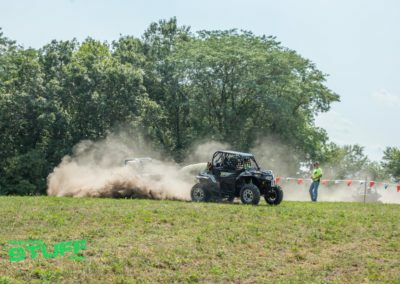 It was really fun to watch. 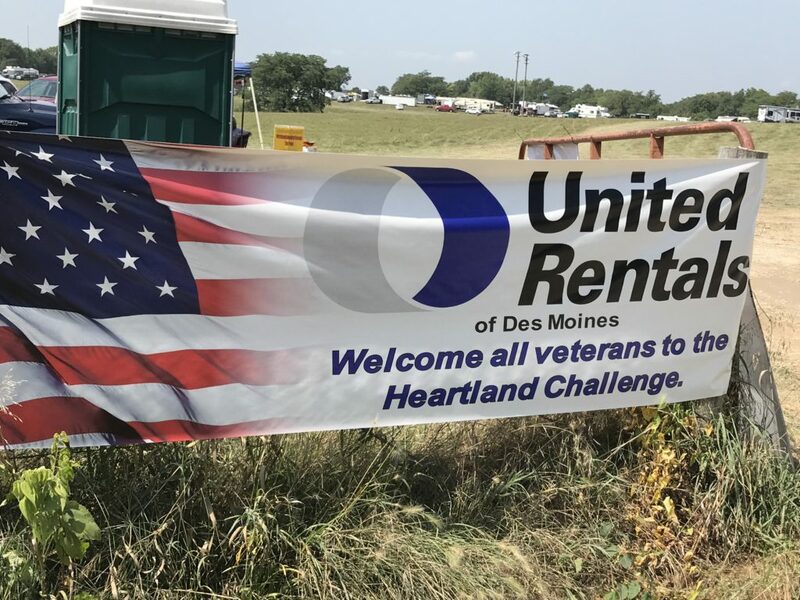 United Rentals of Des Moines showed support for our military by covering 100% of the gate fees for all members of the armed forces, active or veterans! 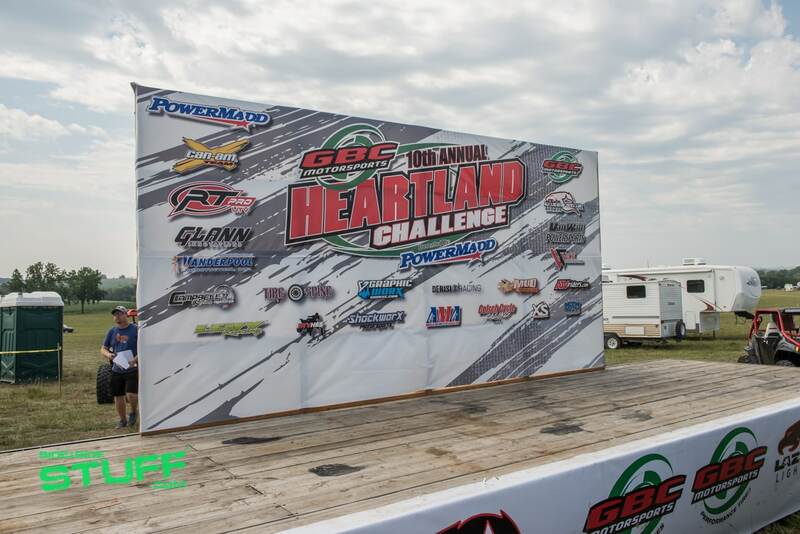 The Heartland Challenge crew did a great job putting this event together making it both an amazing event for race teams but also went the extra mile to make it a great event for everyone else attending the event. 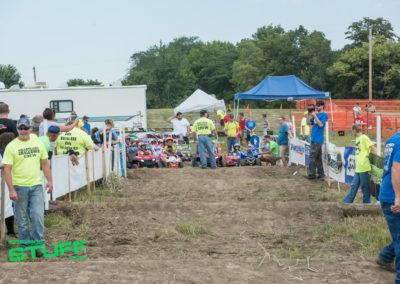 Spectating areas were set up in good locations and were easy for everyone to access. 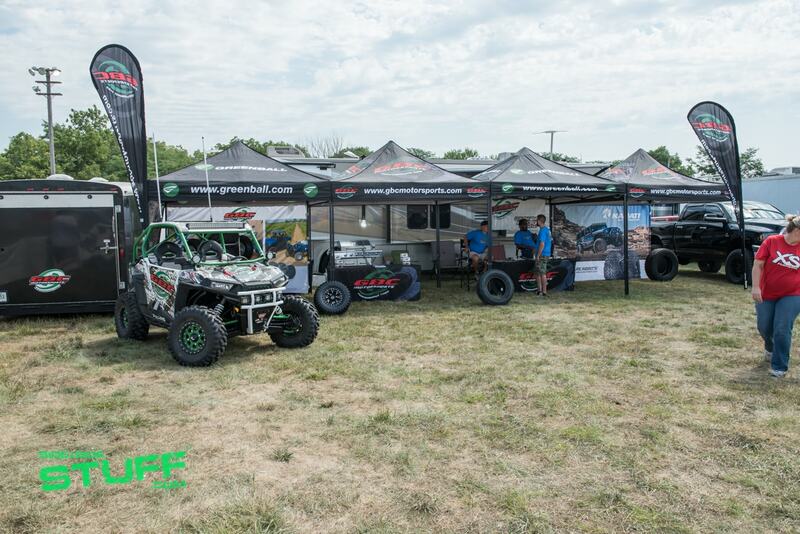 Our Side By Side Stuff hats are off to everyone involved in putting on a great event!